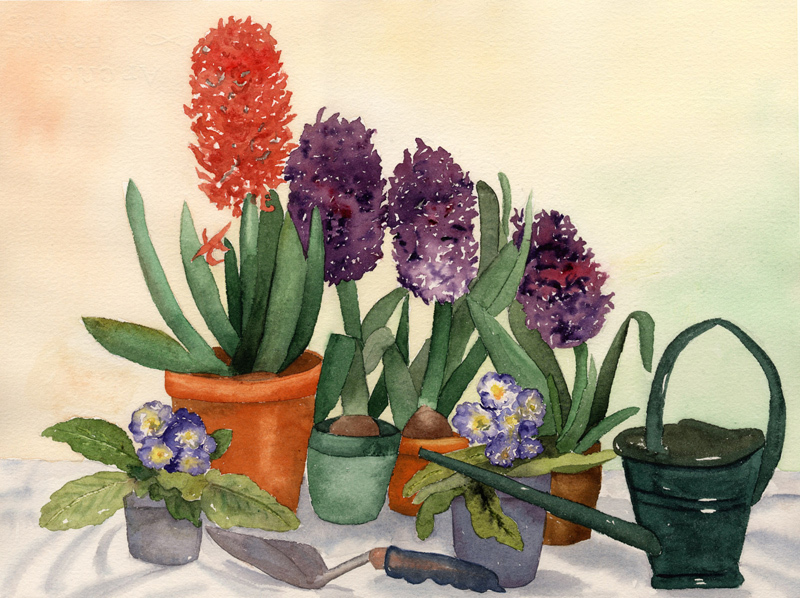 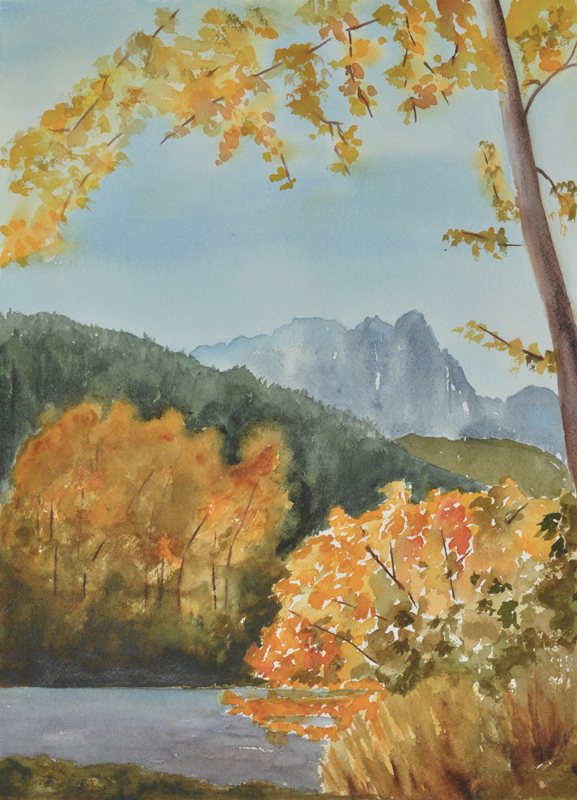 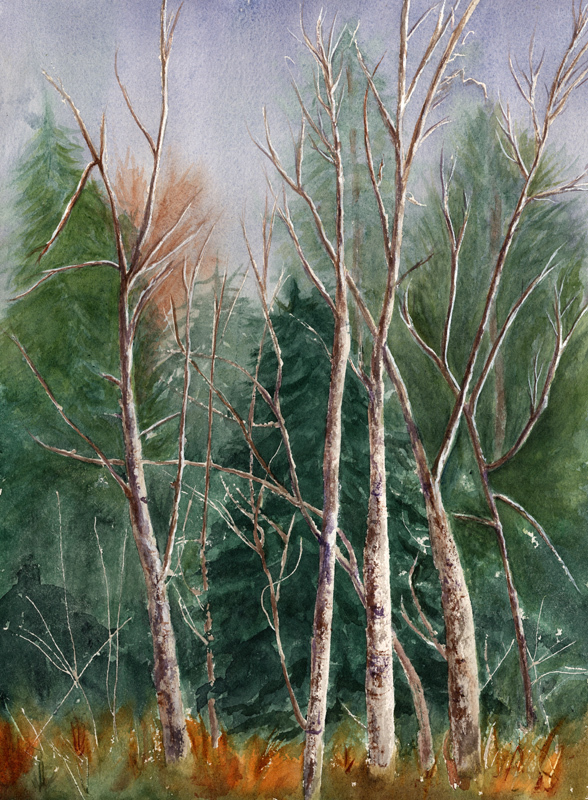 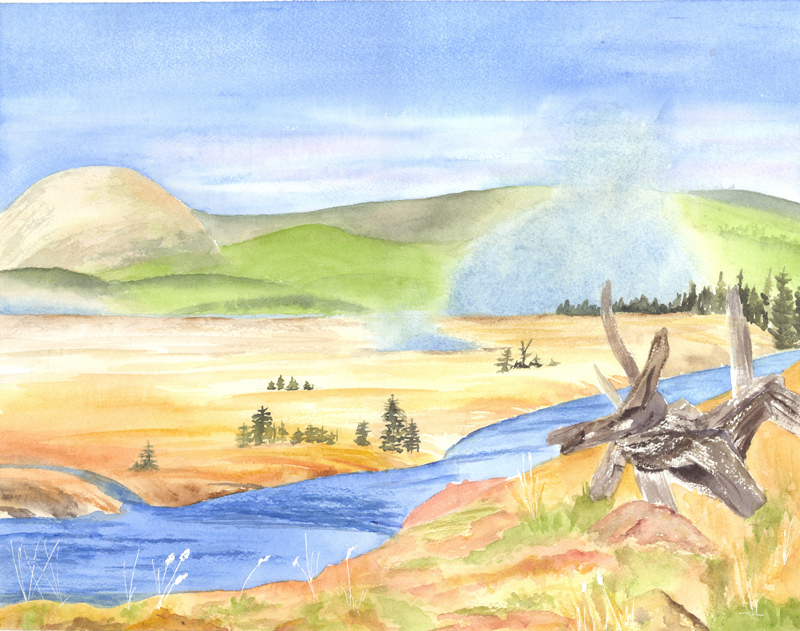 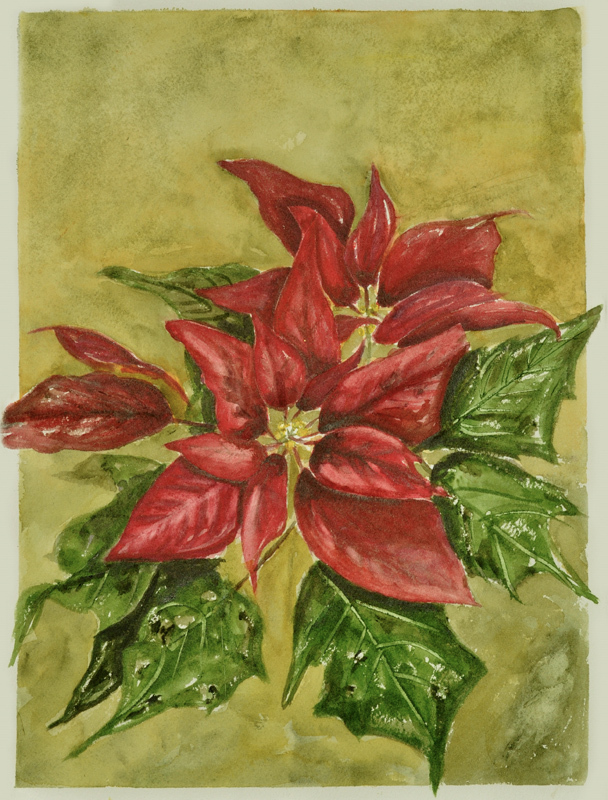 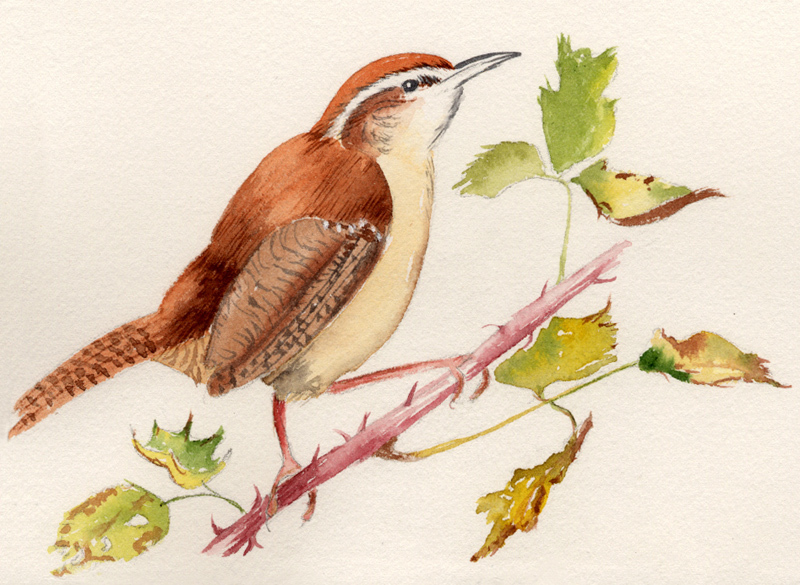 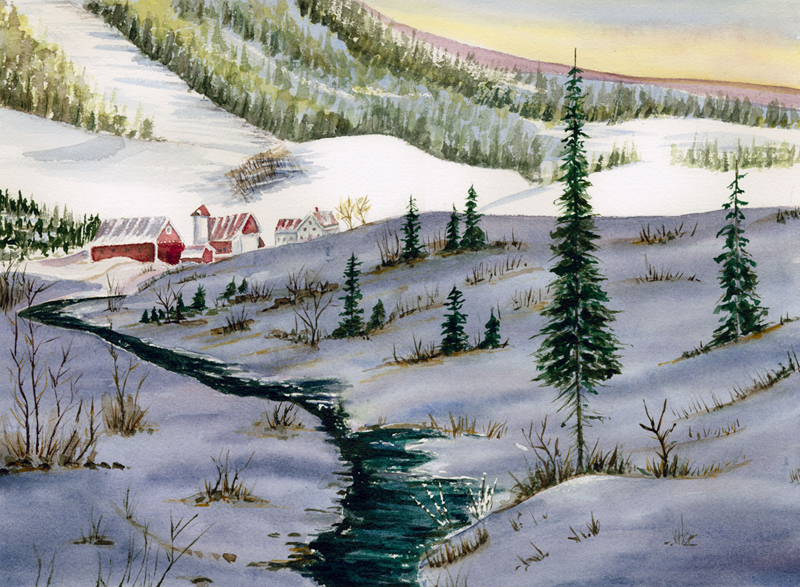 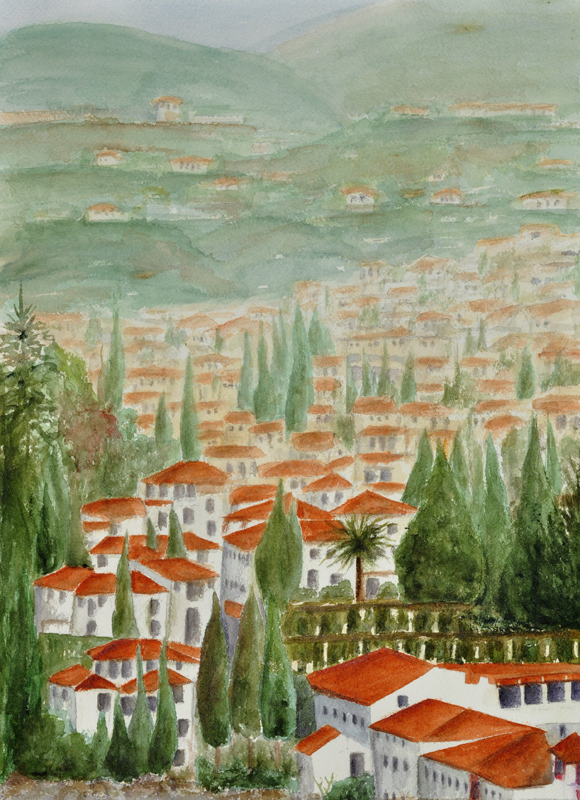 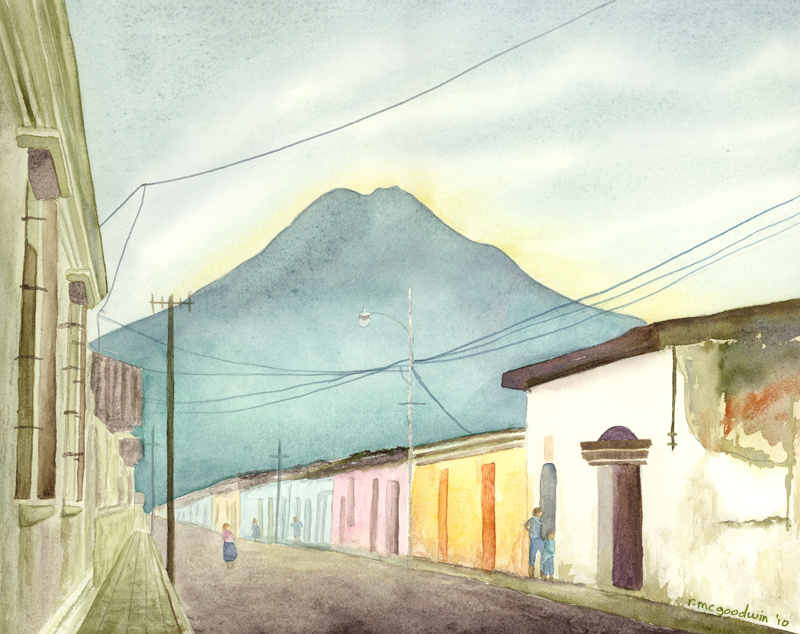 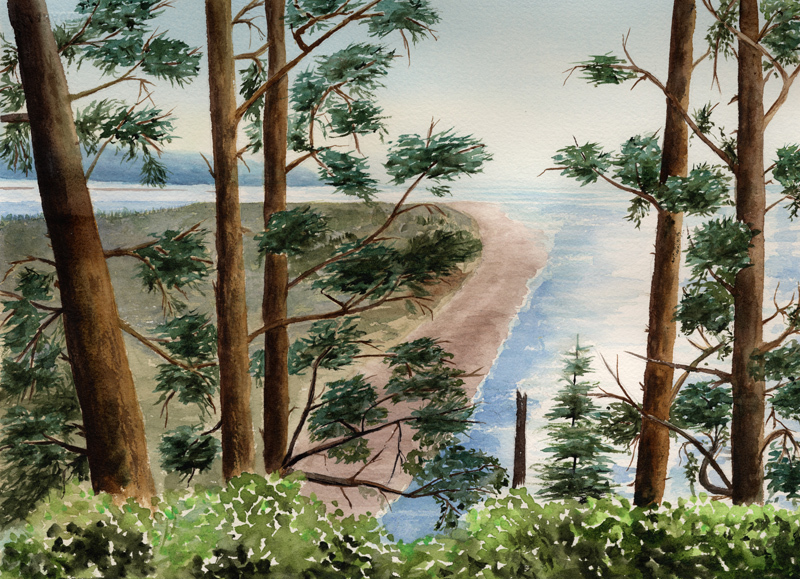 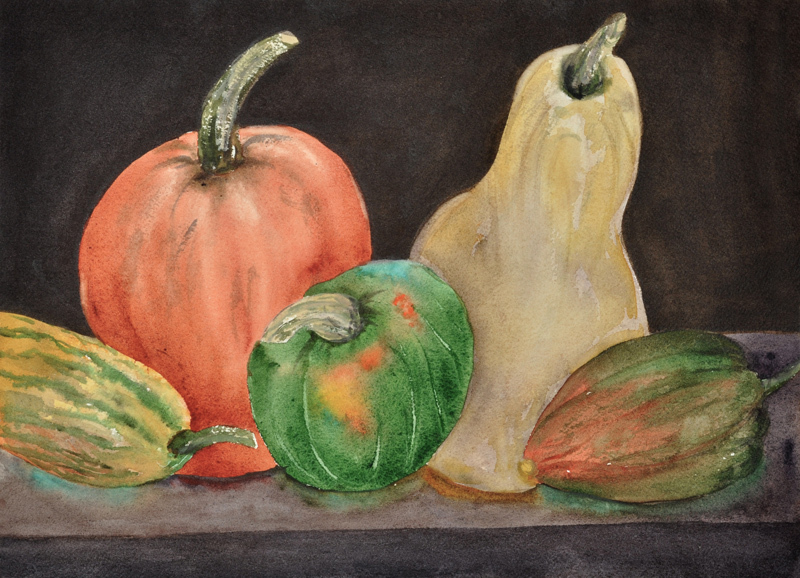 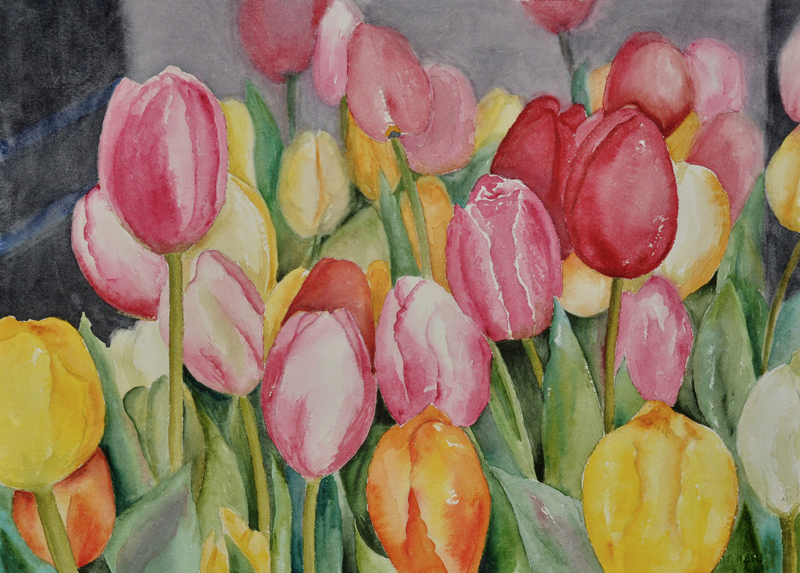 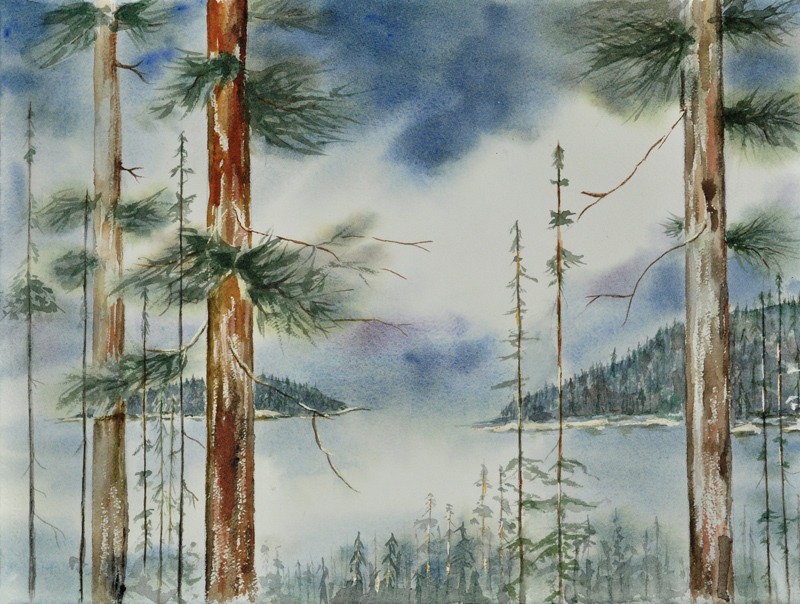 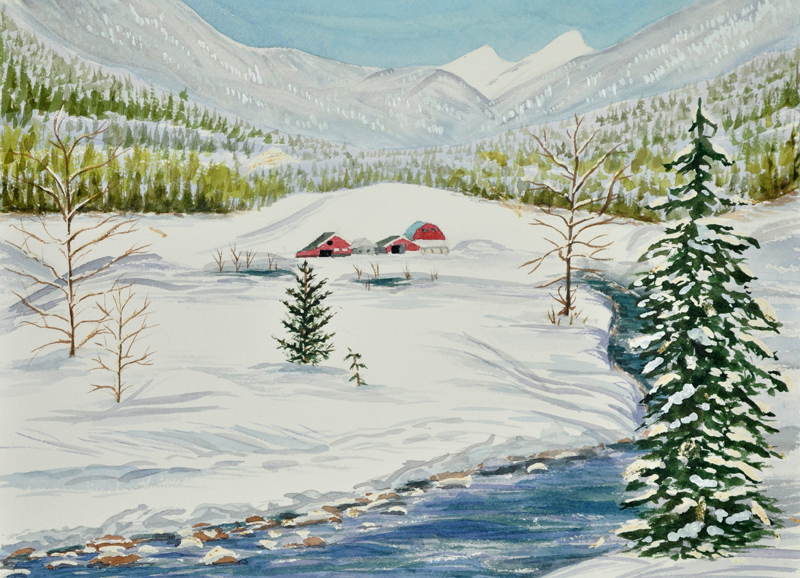 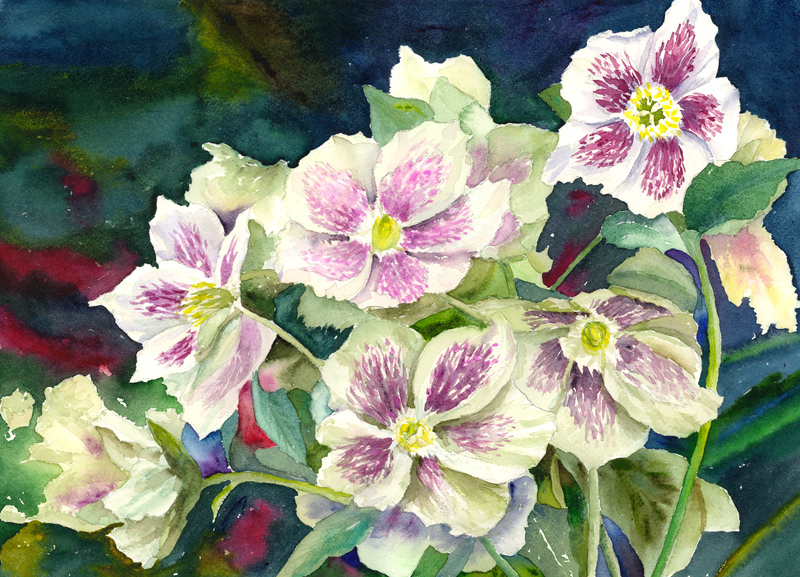 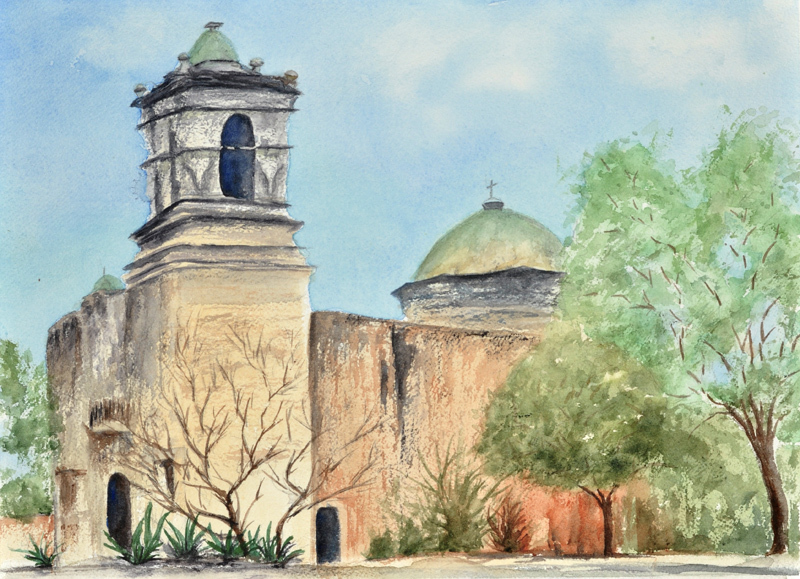 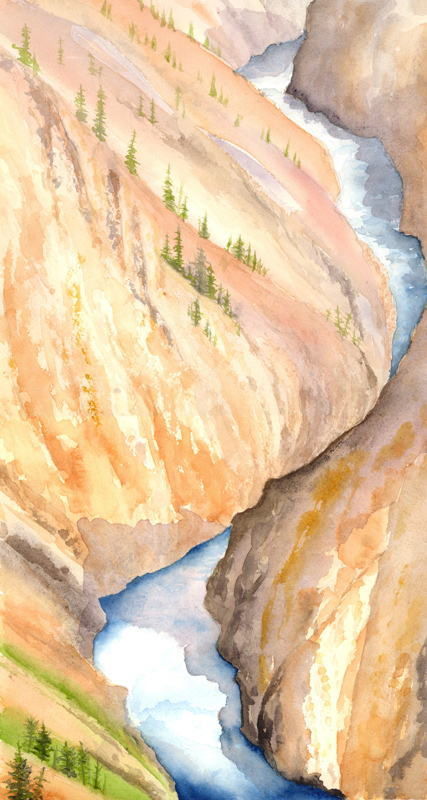 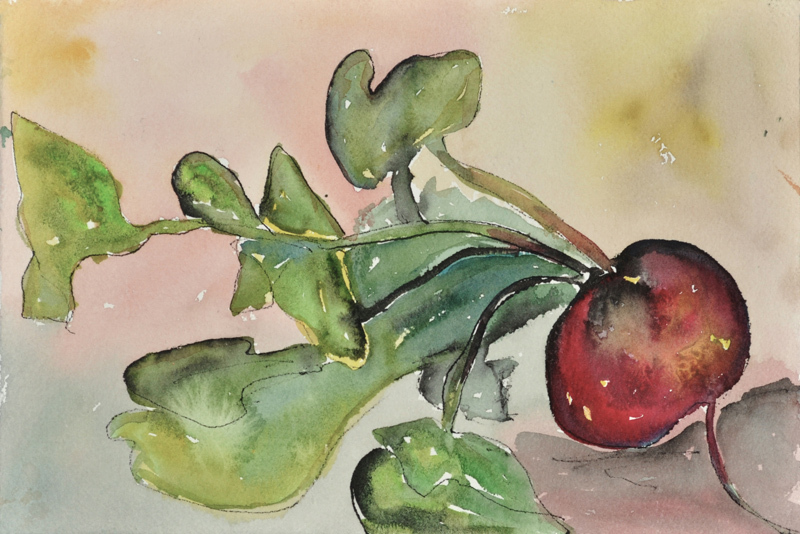 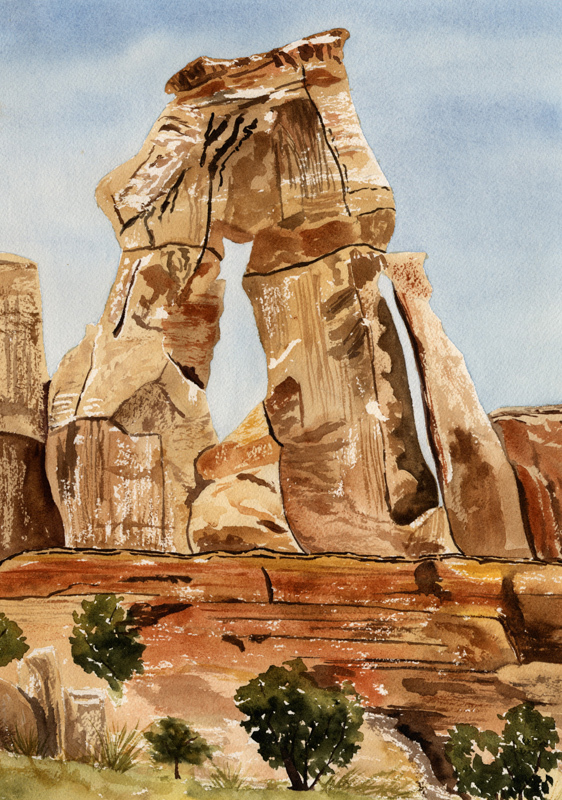 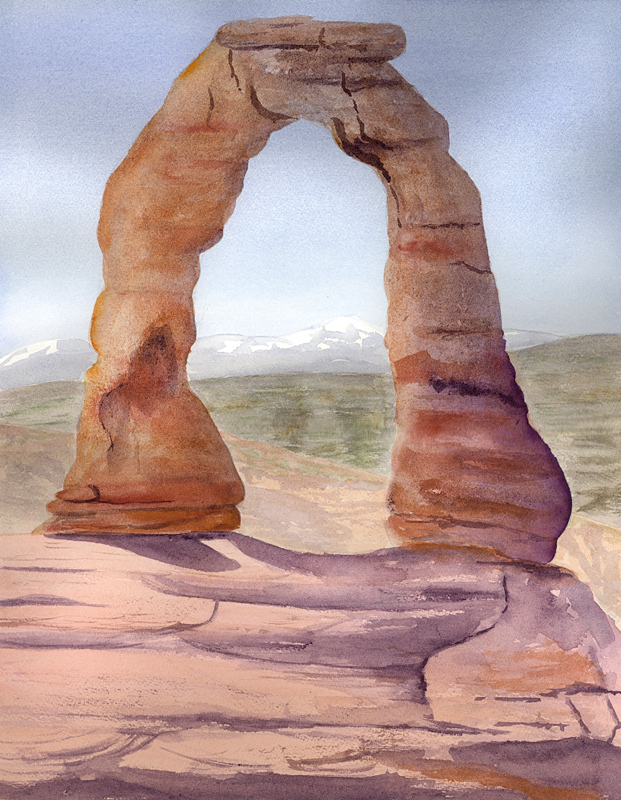 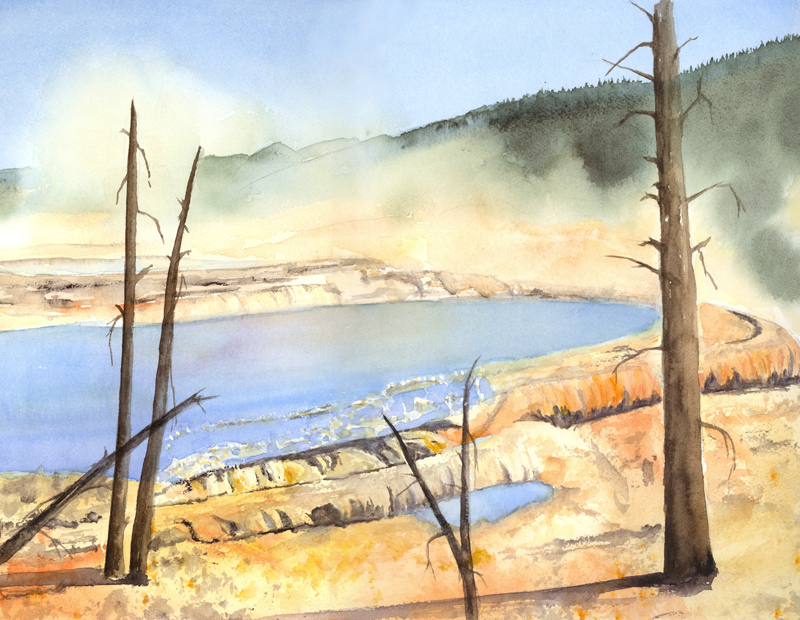 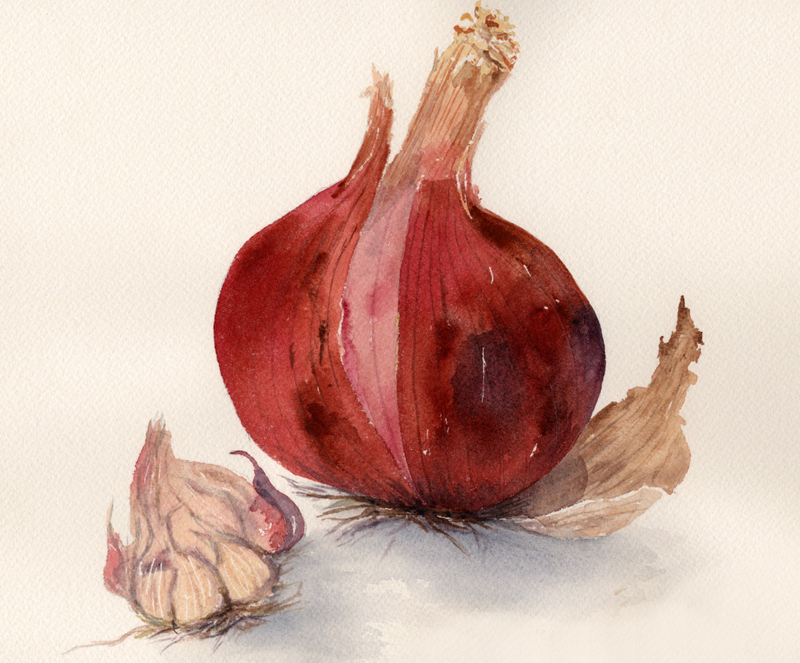 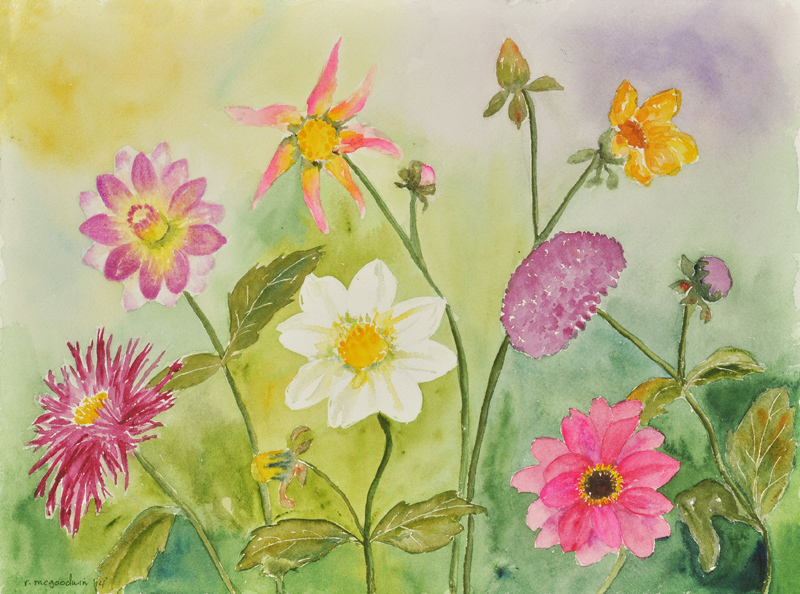 Overview: This webpage displays more than 200 of Rebecca's watercolor works in the form of digital scanned or photographic images. 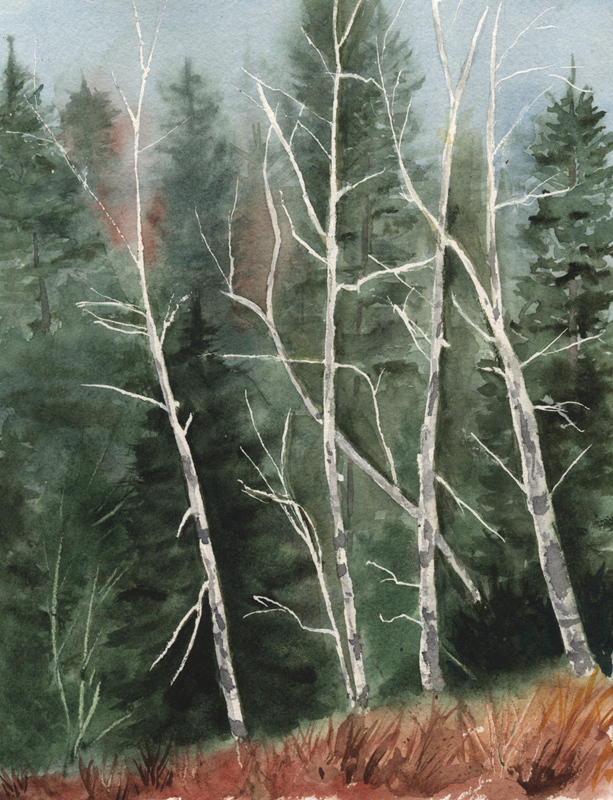 To the best of my knowledge, this is a complete catalog of the works she painted (other than certain preliminary "studies" that are not cataloged or photographed), and a few that she gave away before I could photograph them. These images are best viewed on a large-scale computer or monitor video screen. 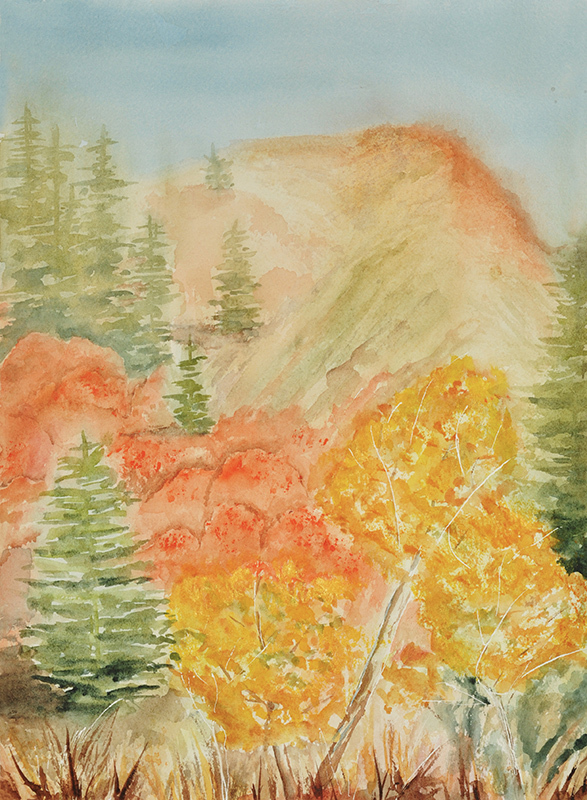 They display the progress and evolution of Rebecca's career in watercolor painting, a passion which gave her and her family great pleasure. 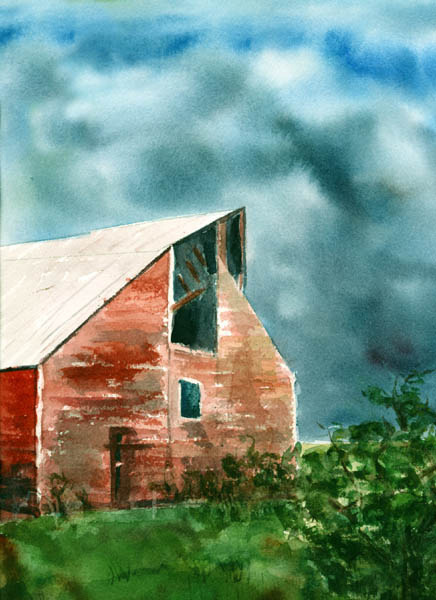 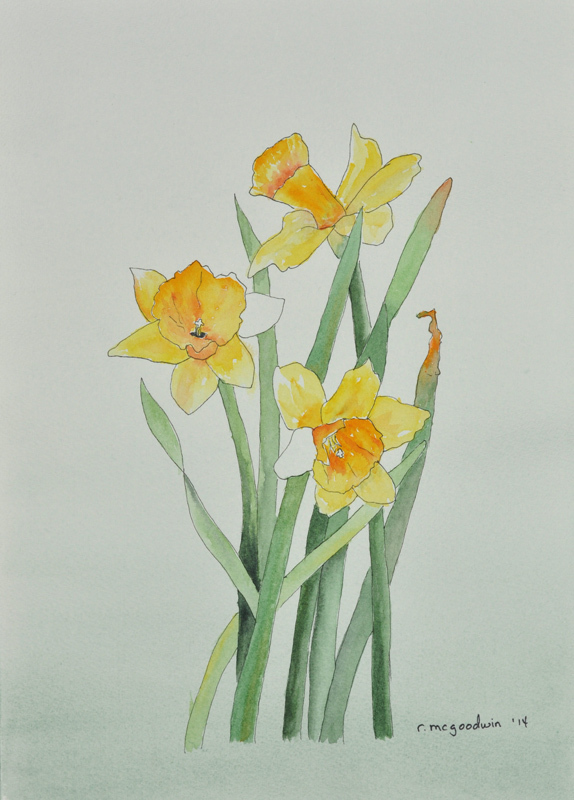 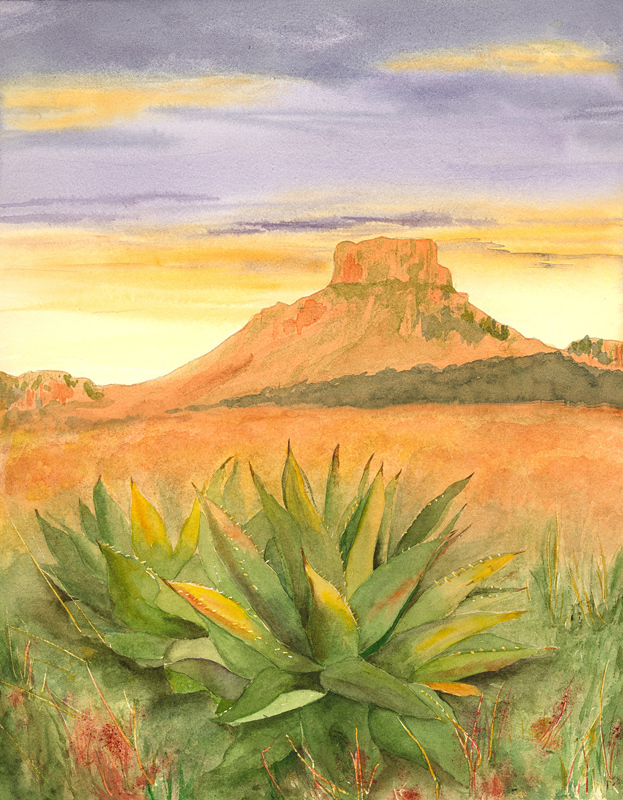 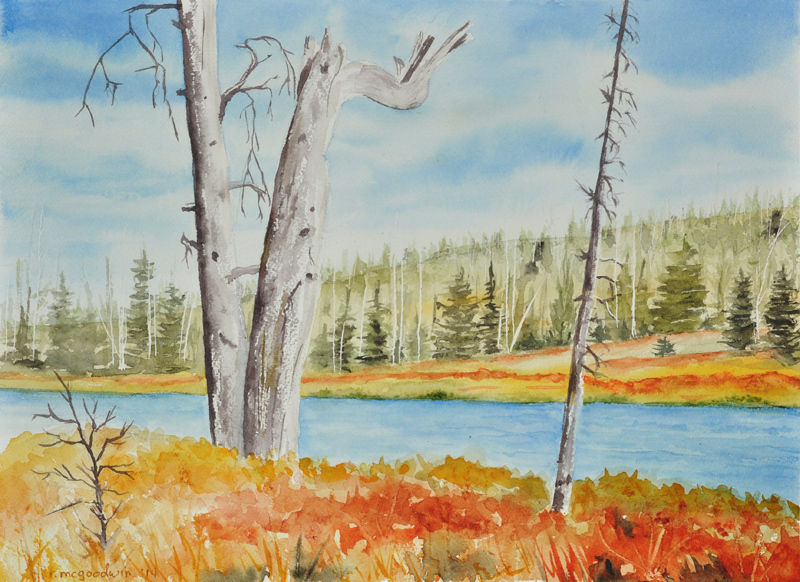 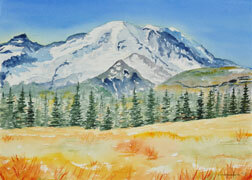 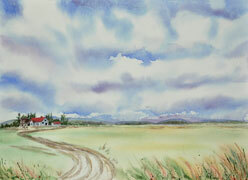 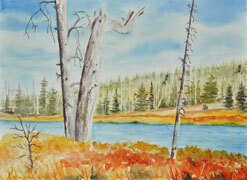 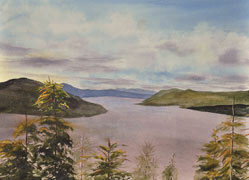 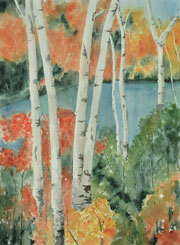 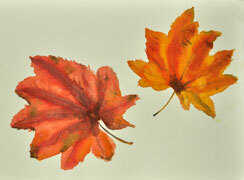 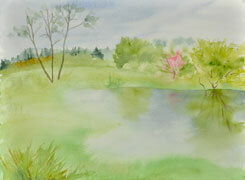 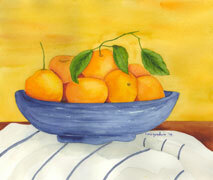 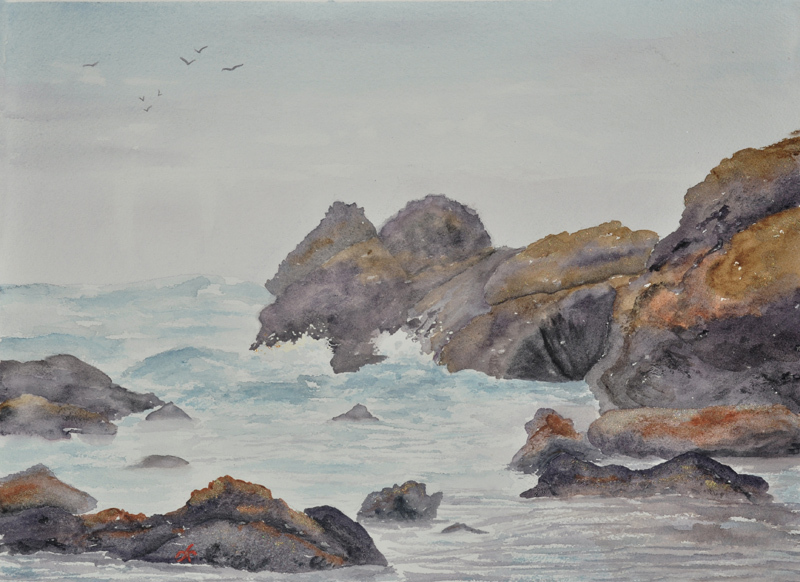 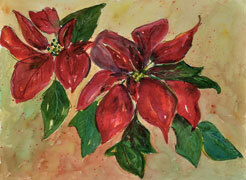 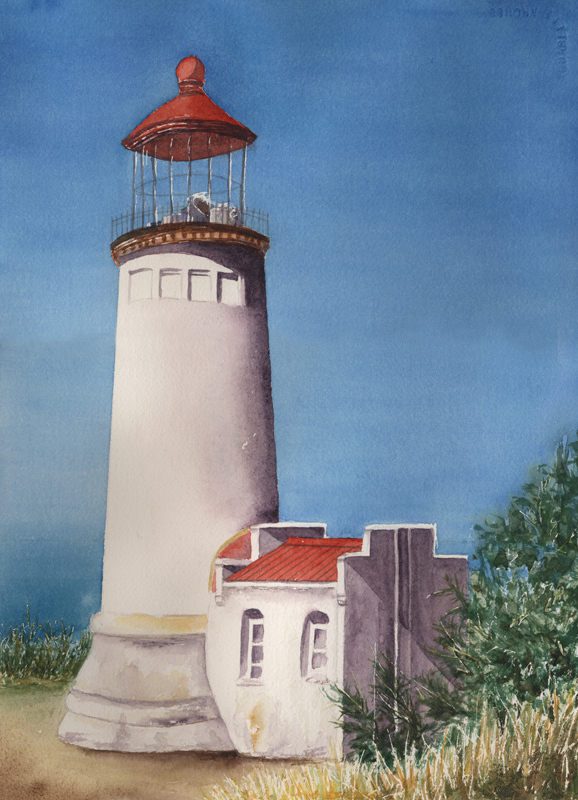 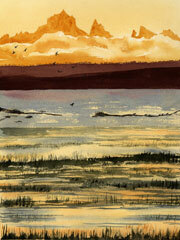 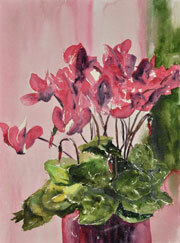 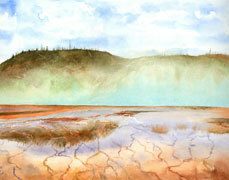 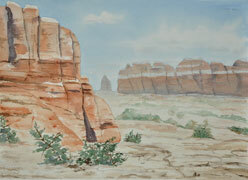 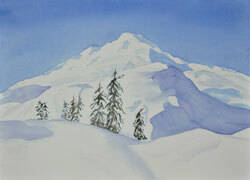 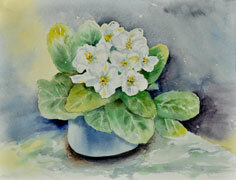 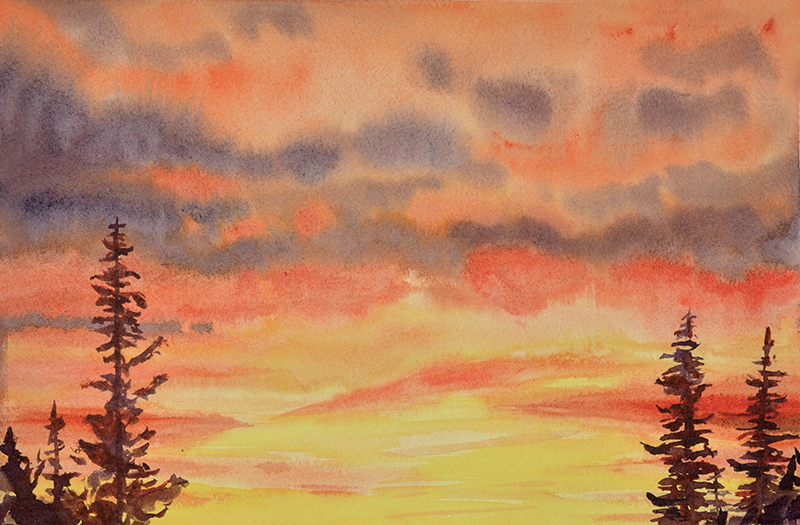 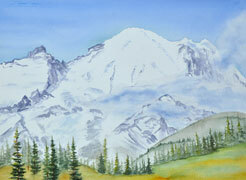 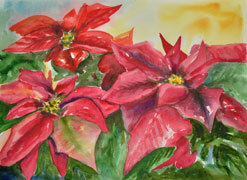 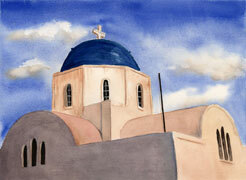 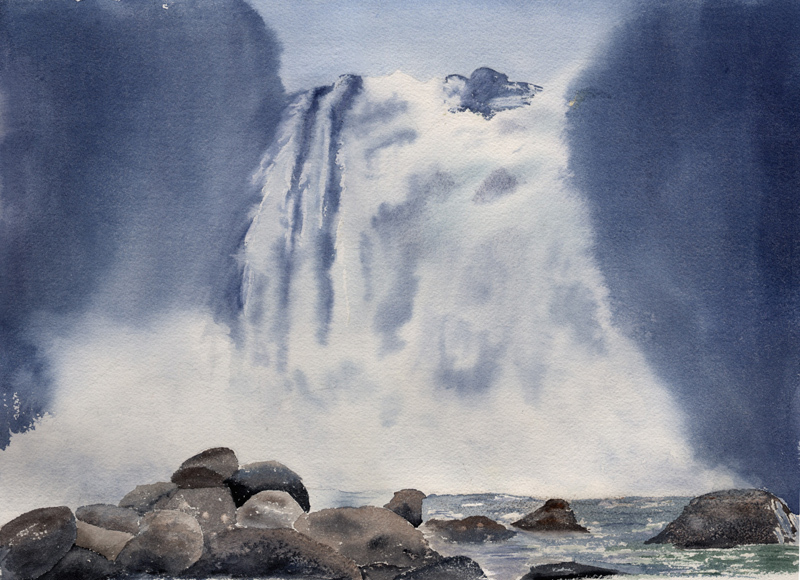 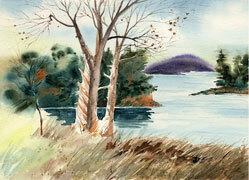 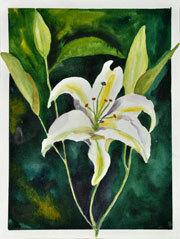 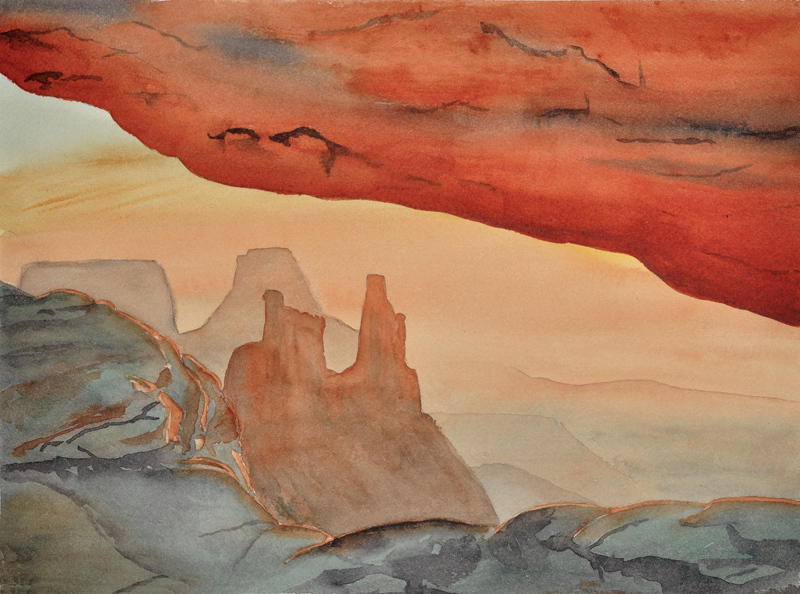 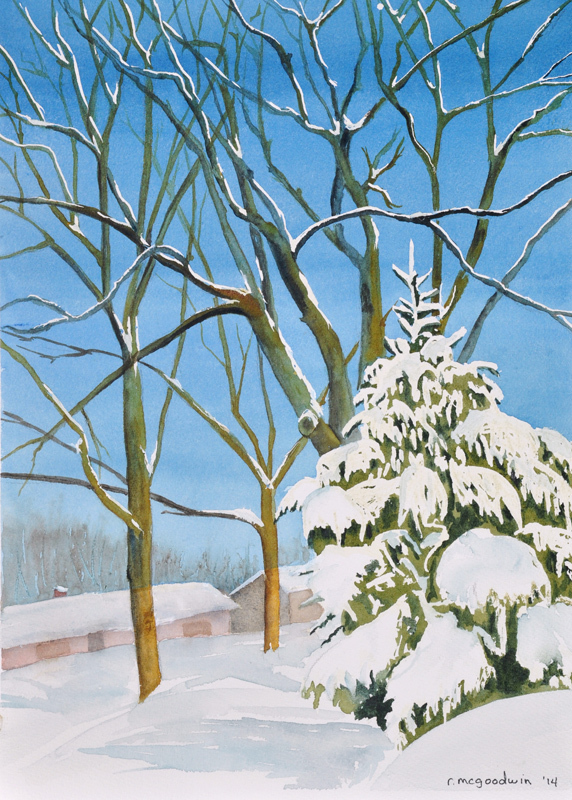 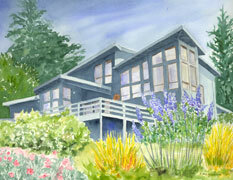 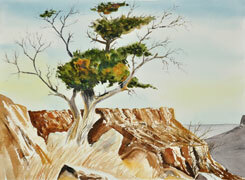 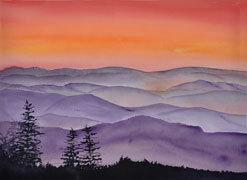 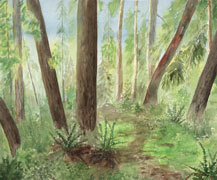 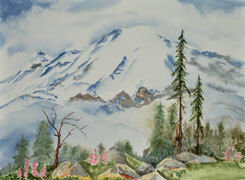 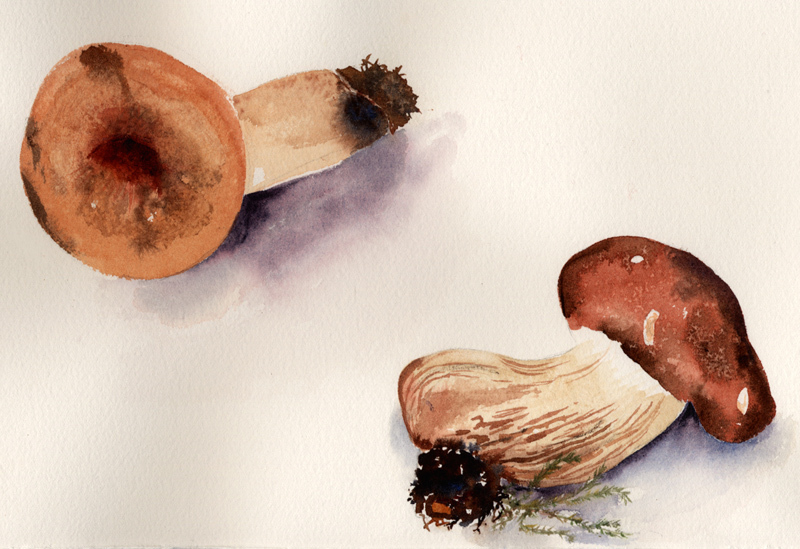 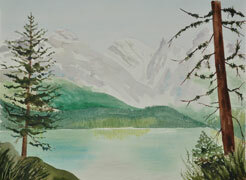 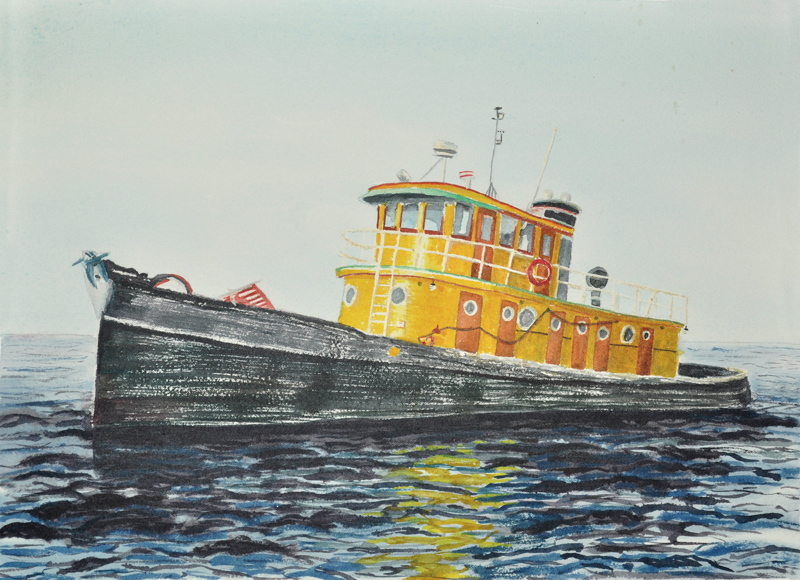 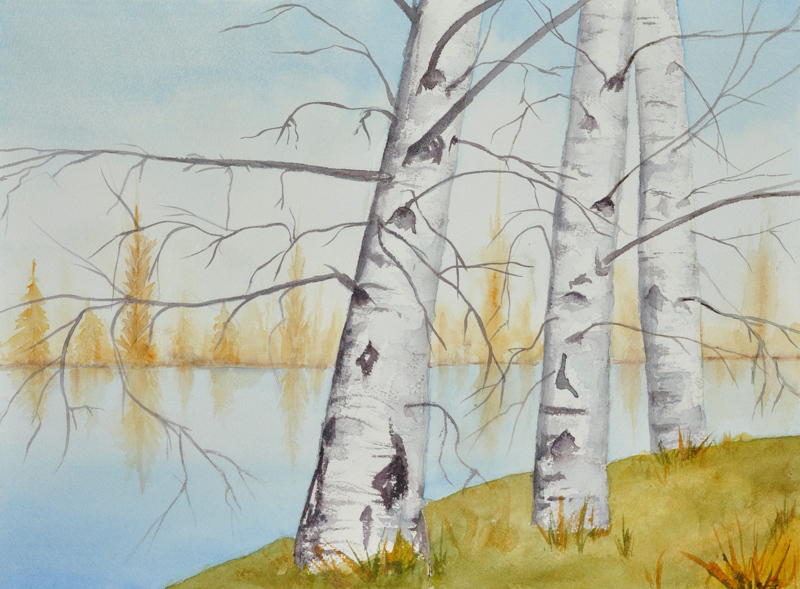 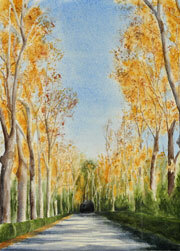 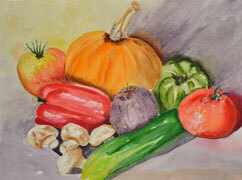 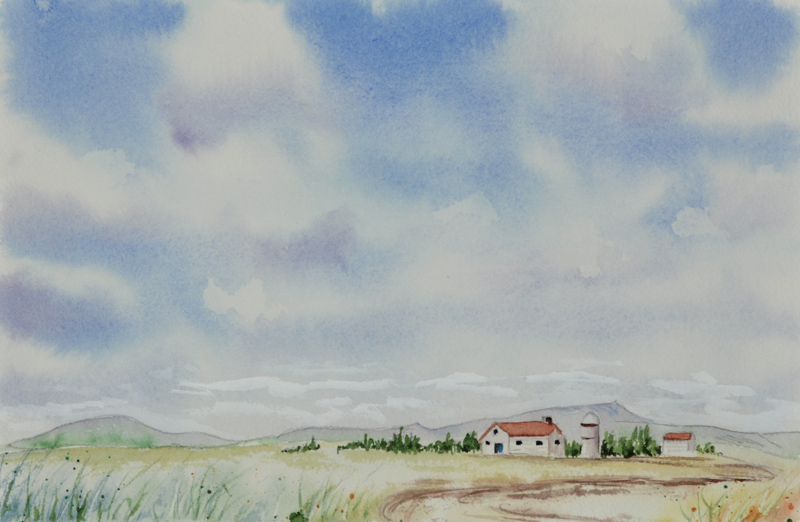 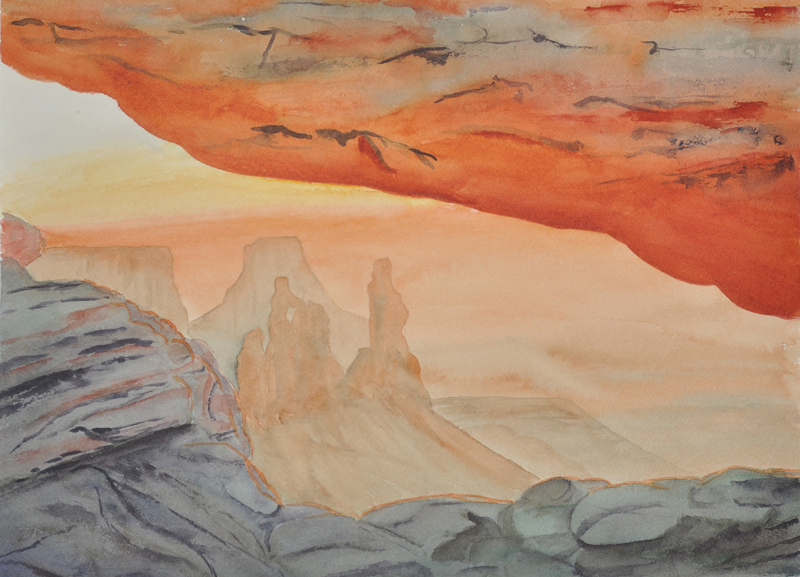 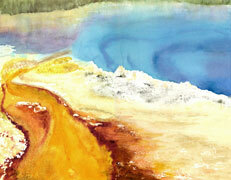 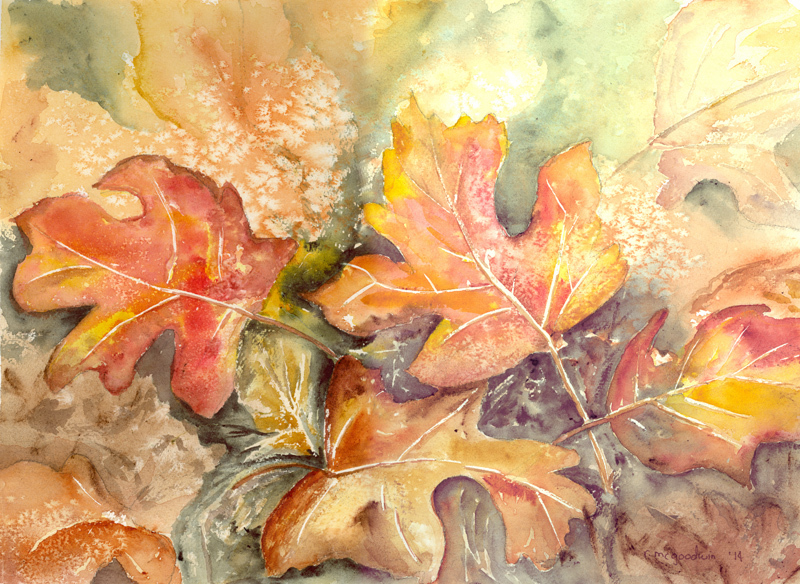 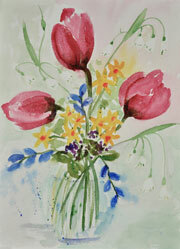 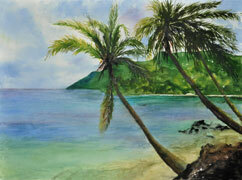 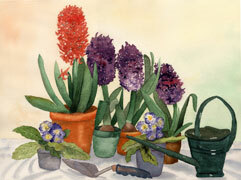 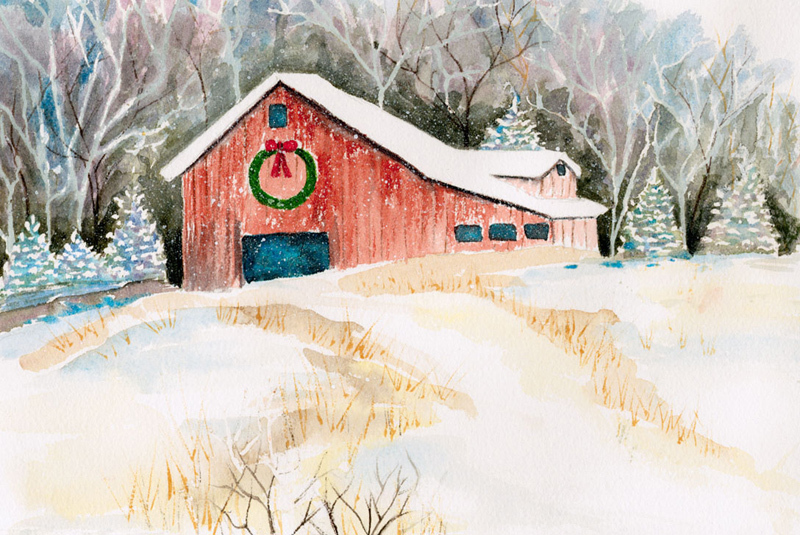 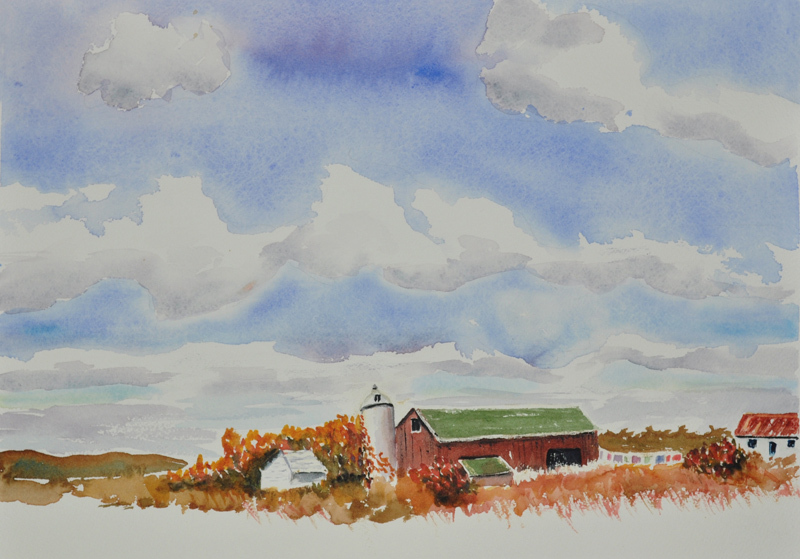 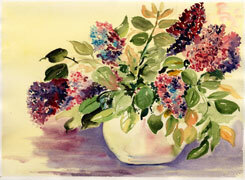 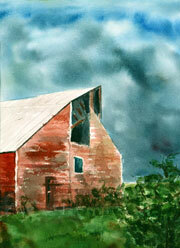 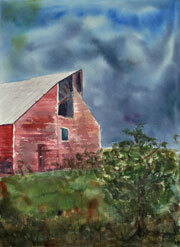 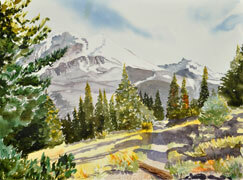 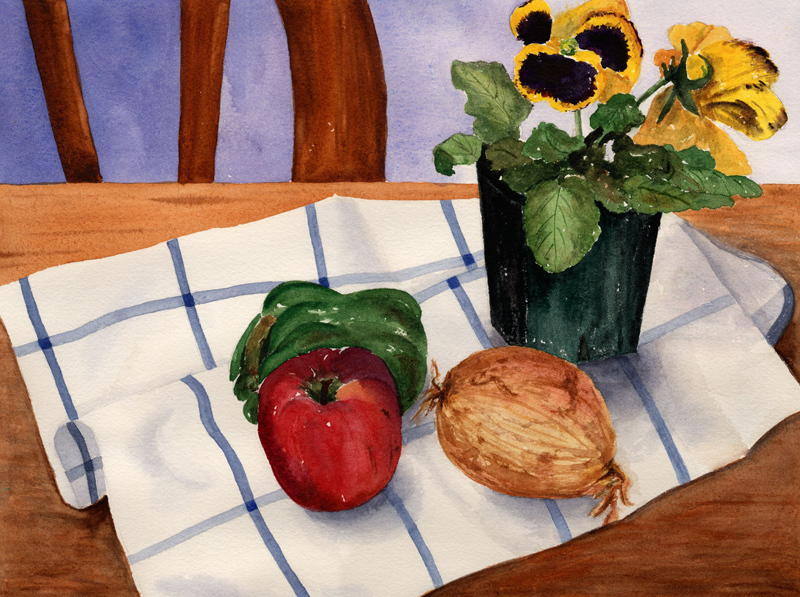 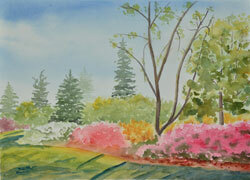 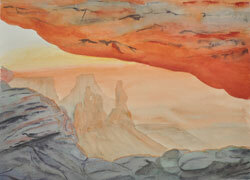 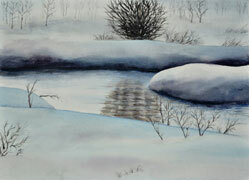 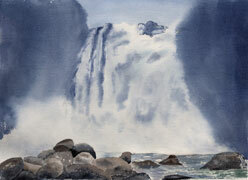 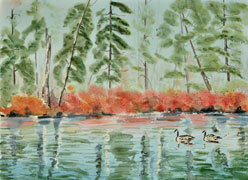 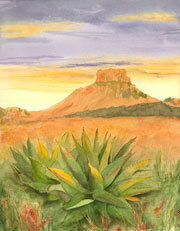 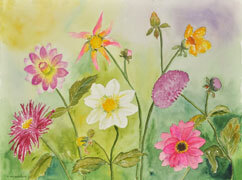 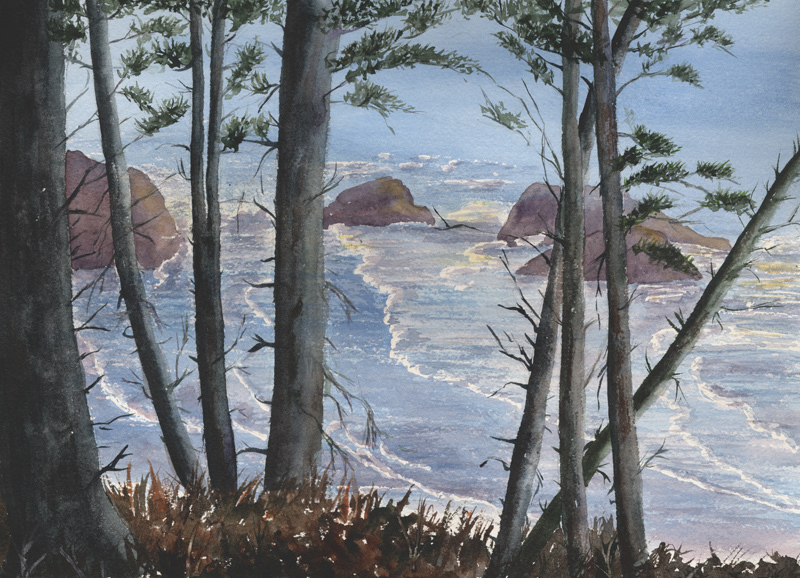 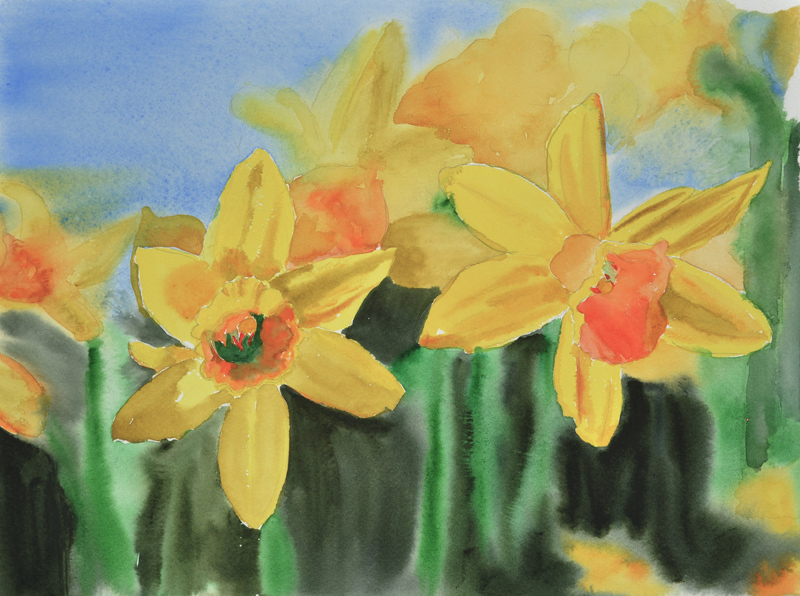 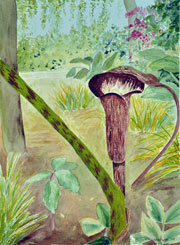 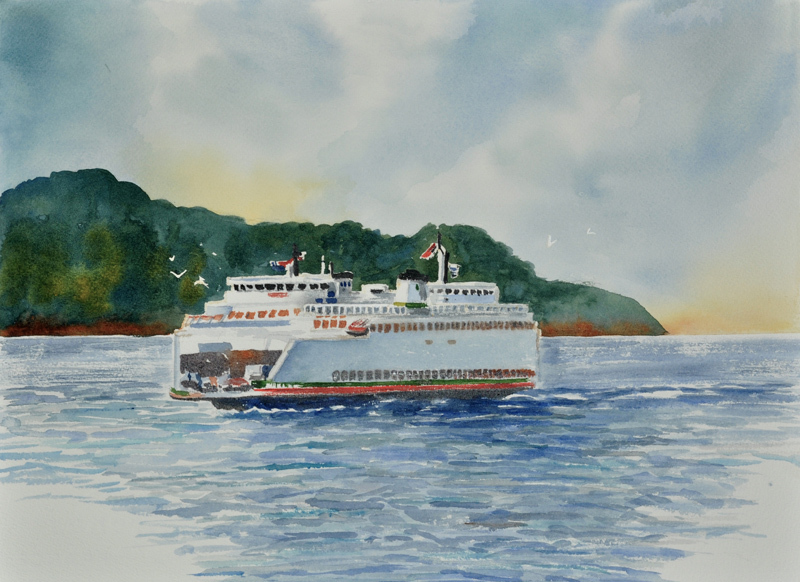 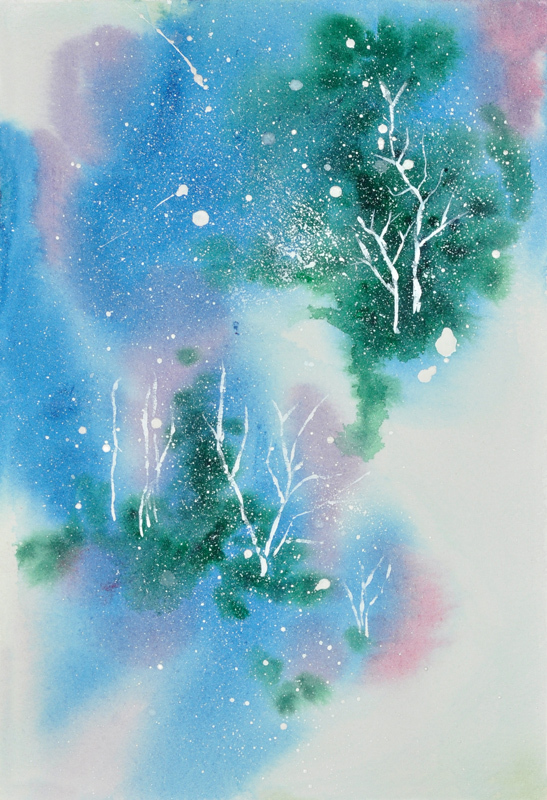 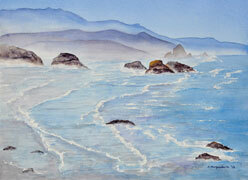 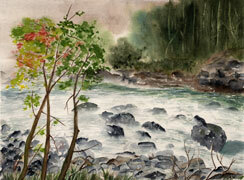 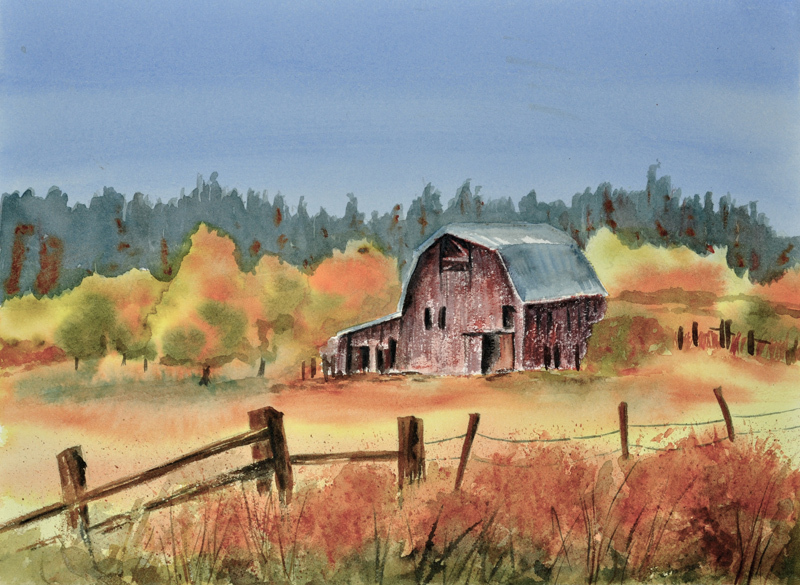 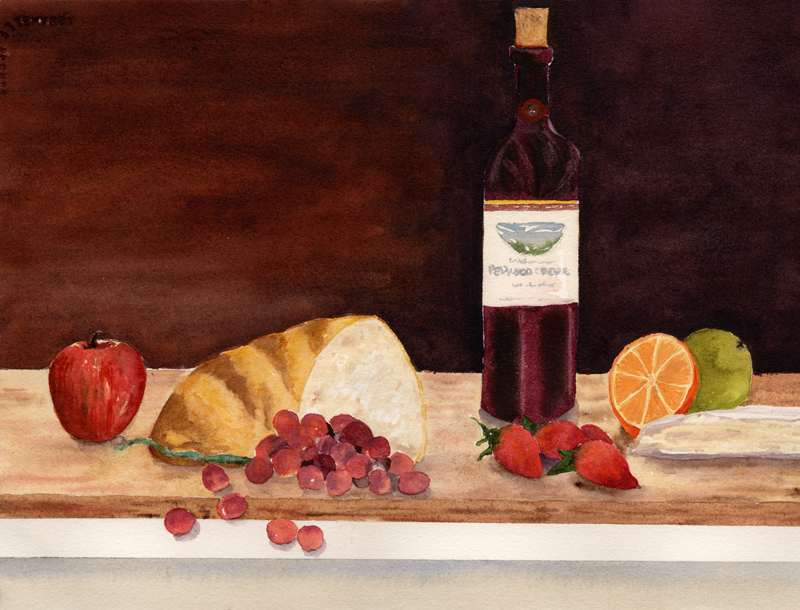 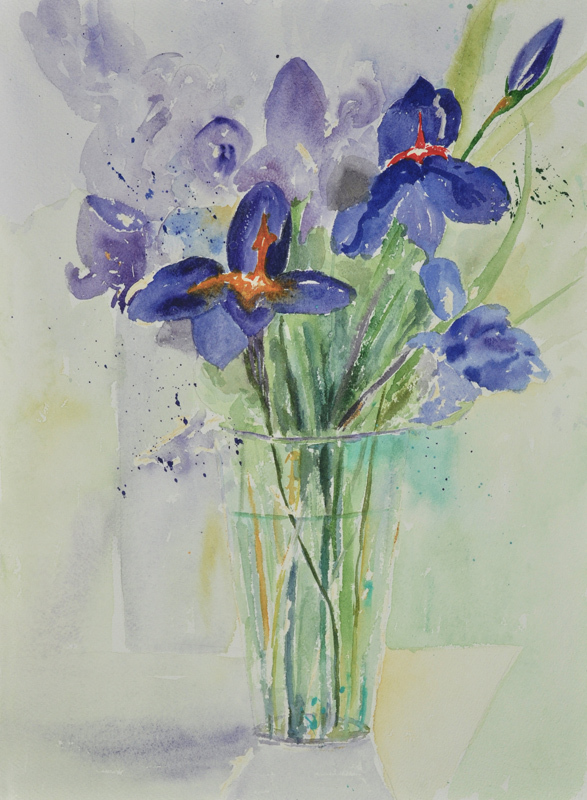 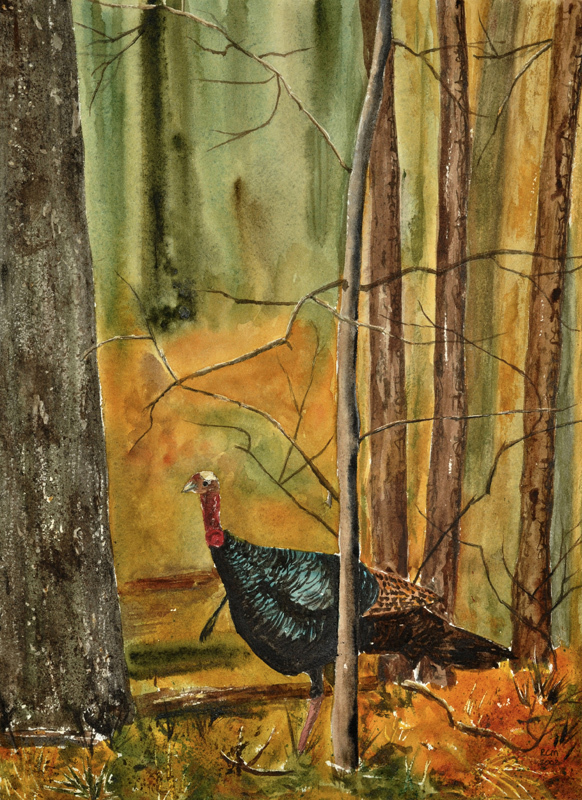 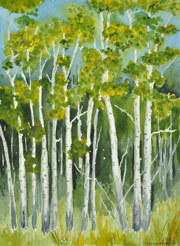 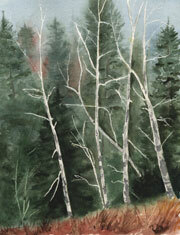 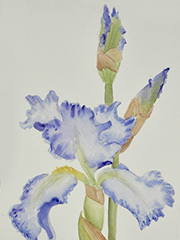 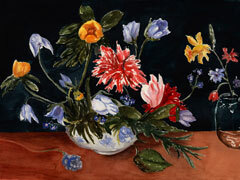 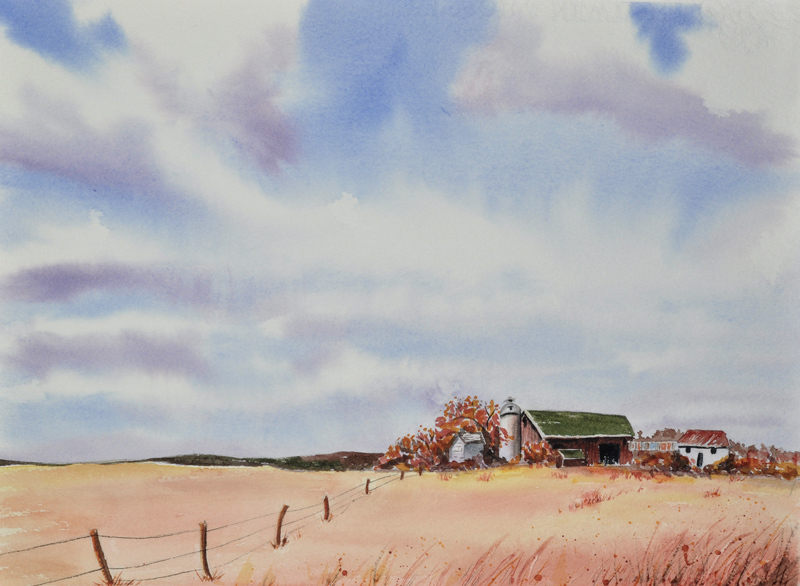 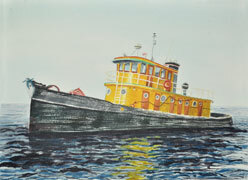 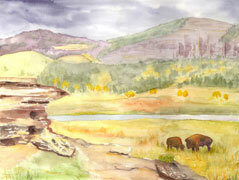 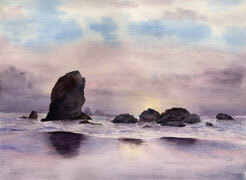 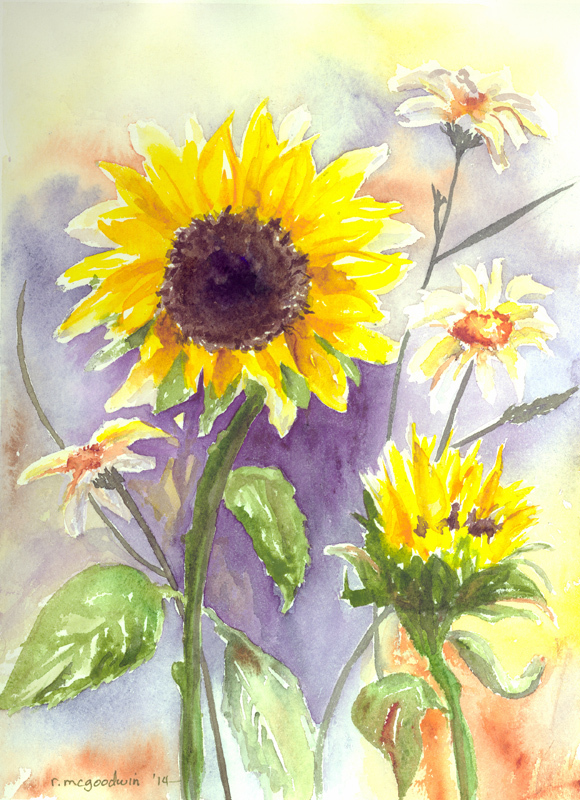 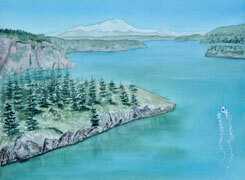 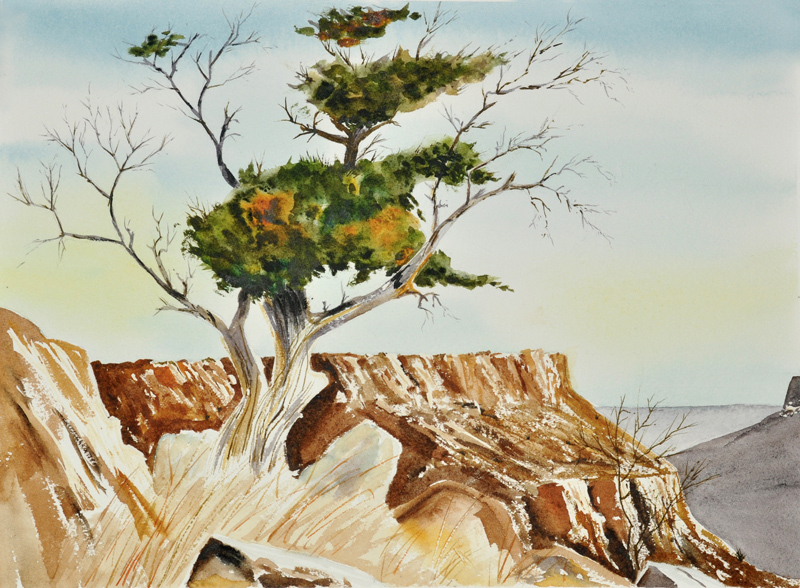 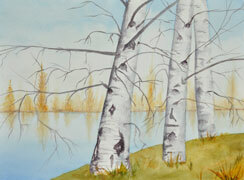 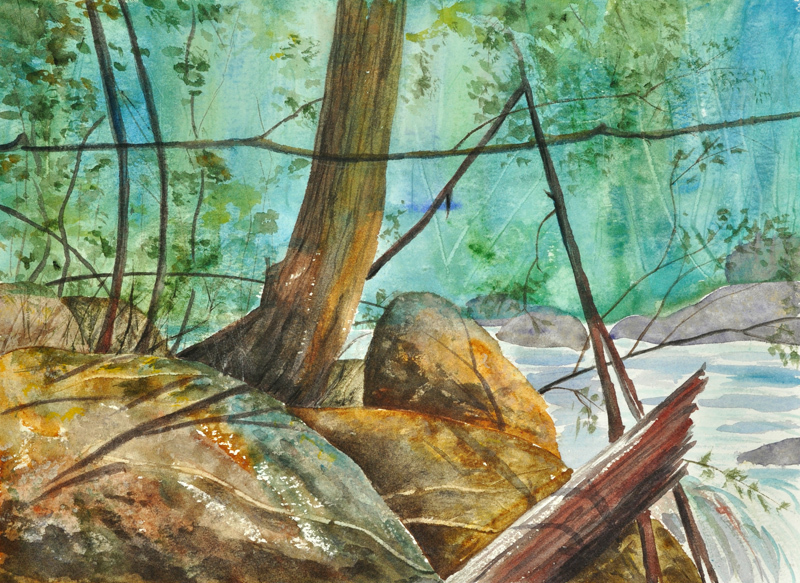 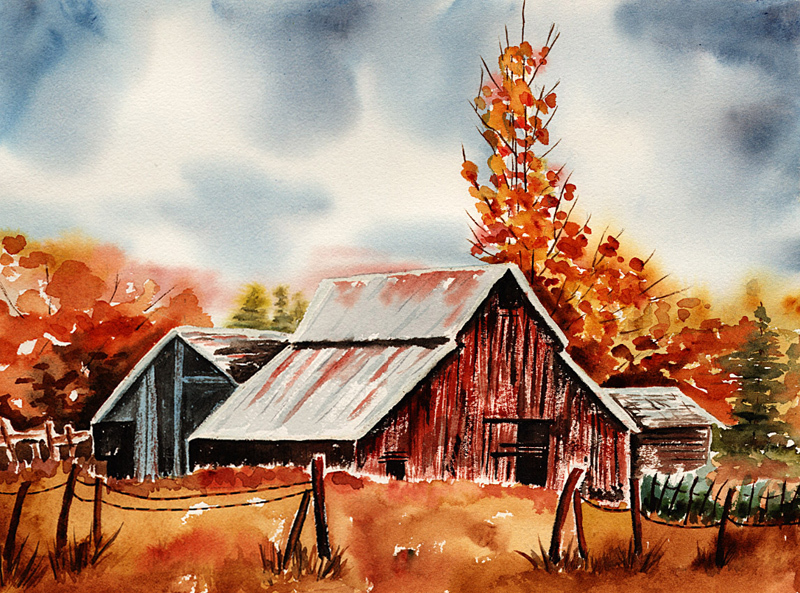 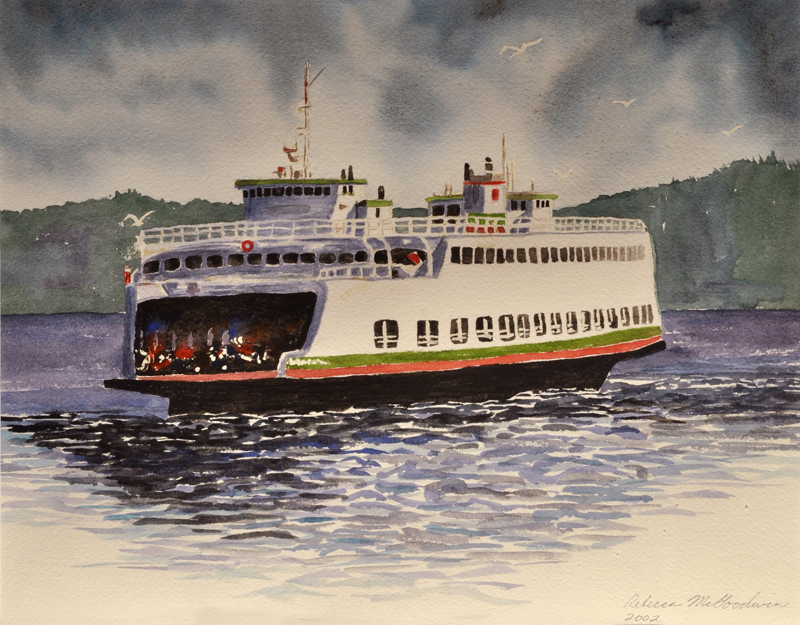 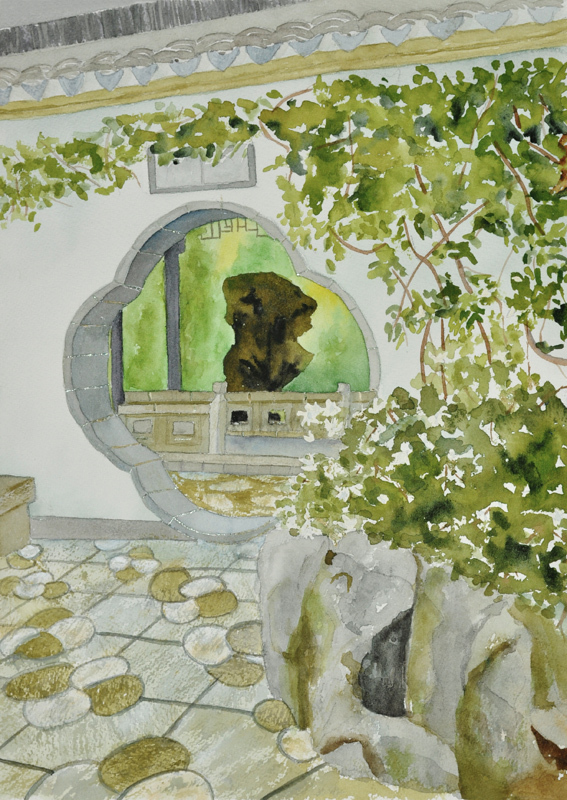 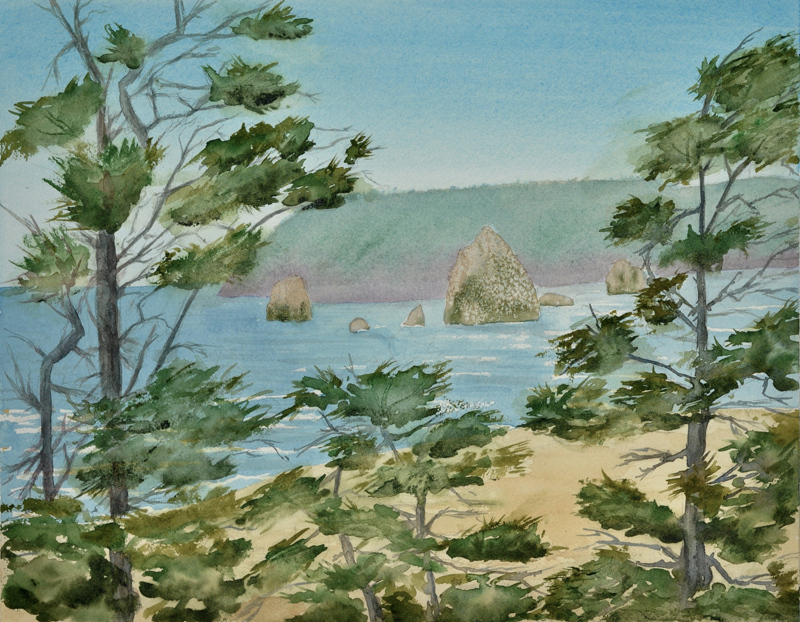 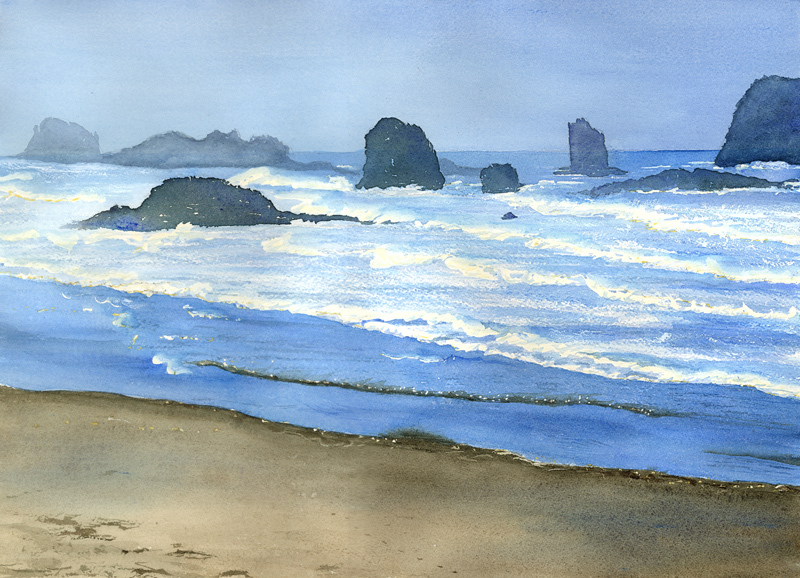 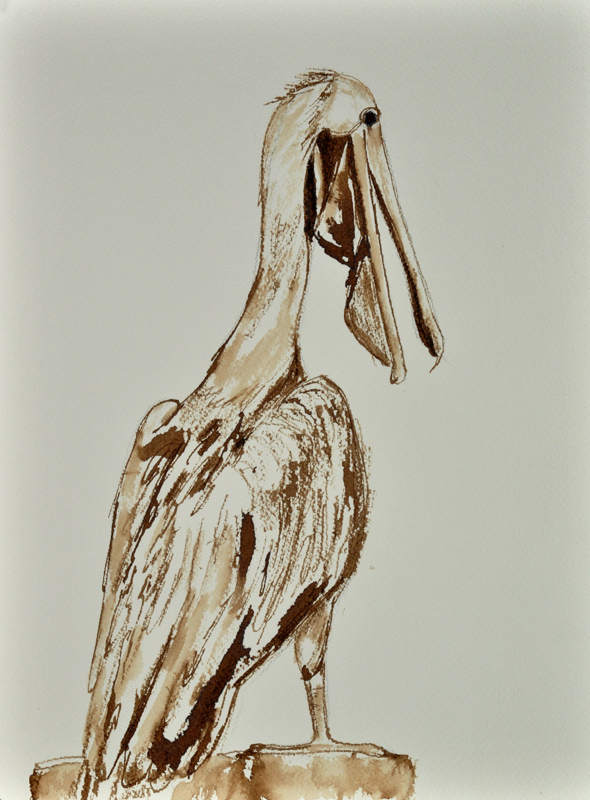 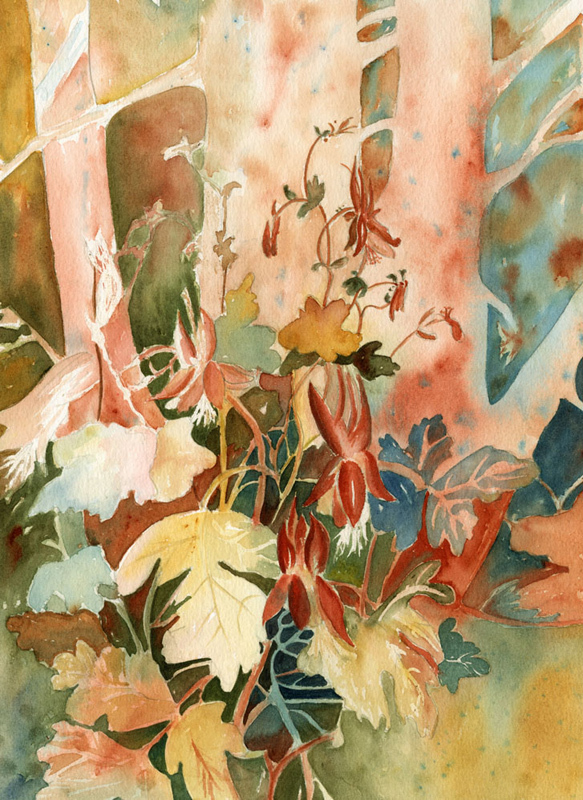 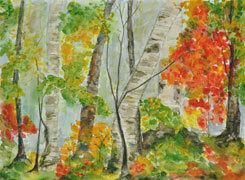 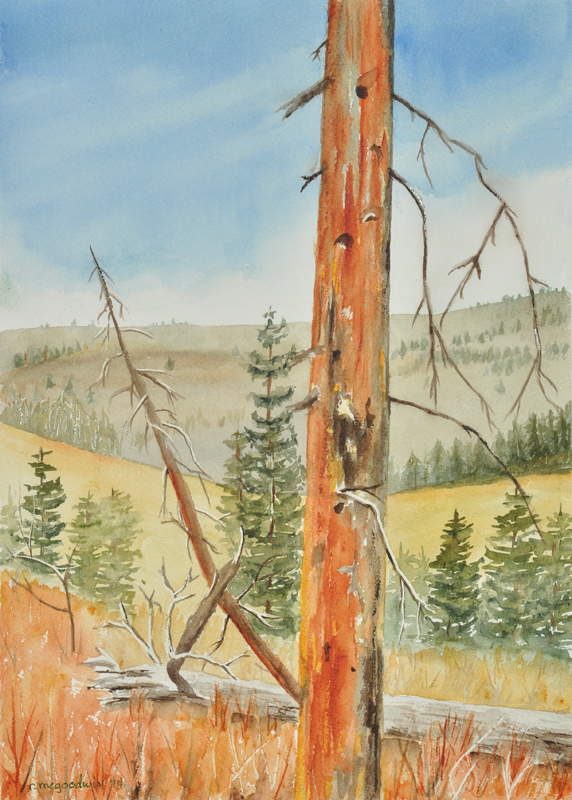 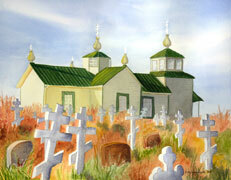 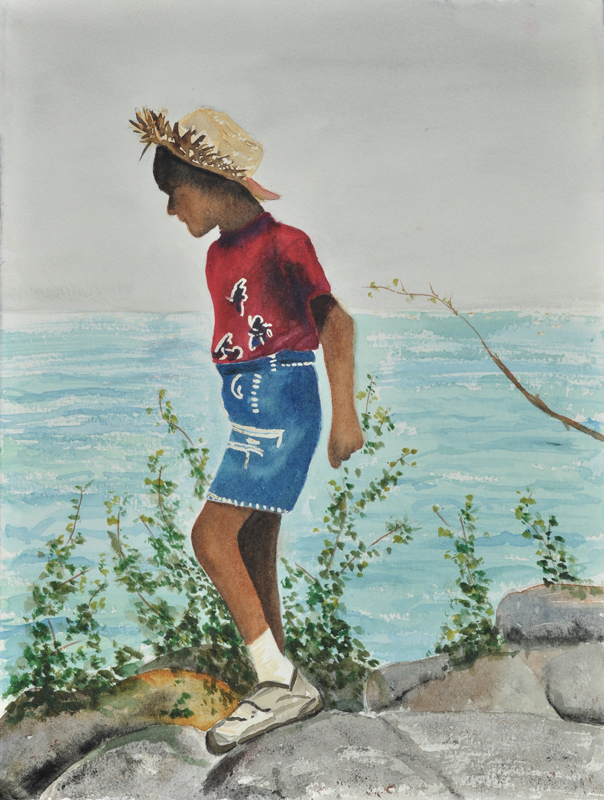 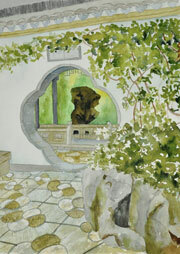 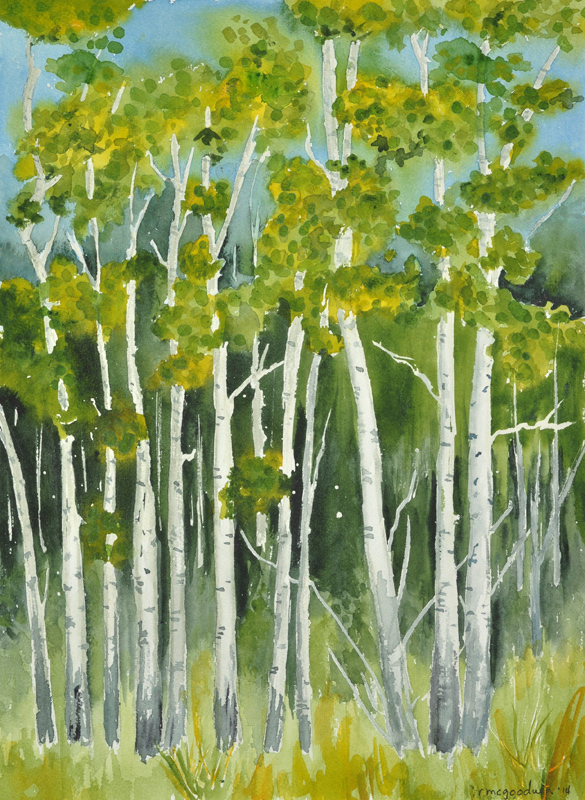 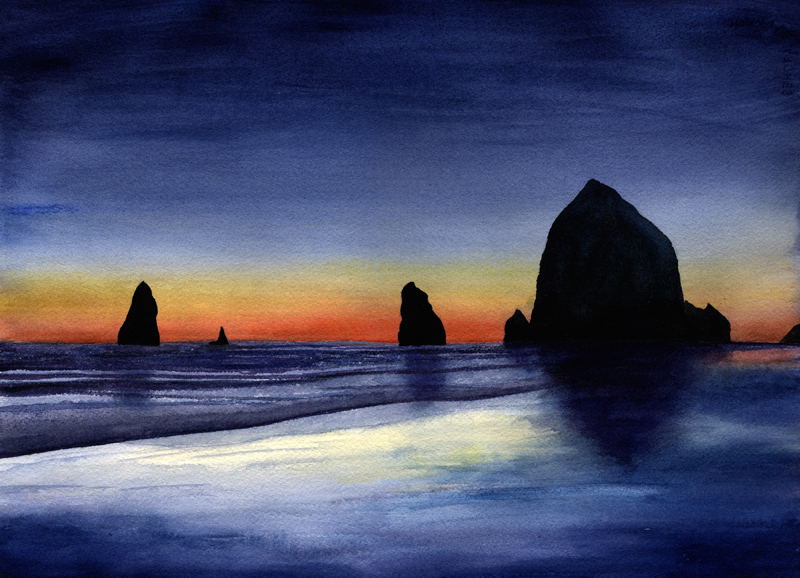 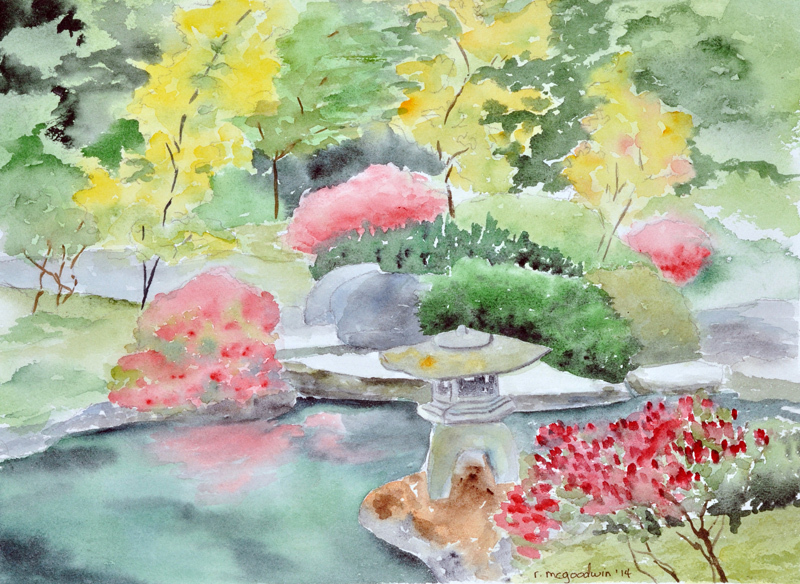 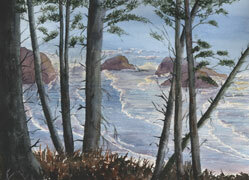 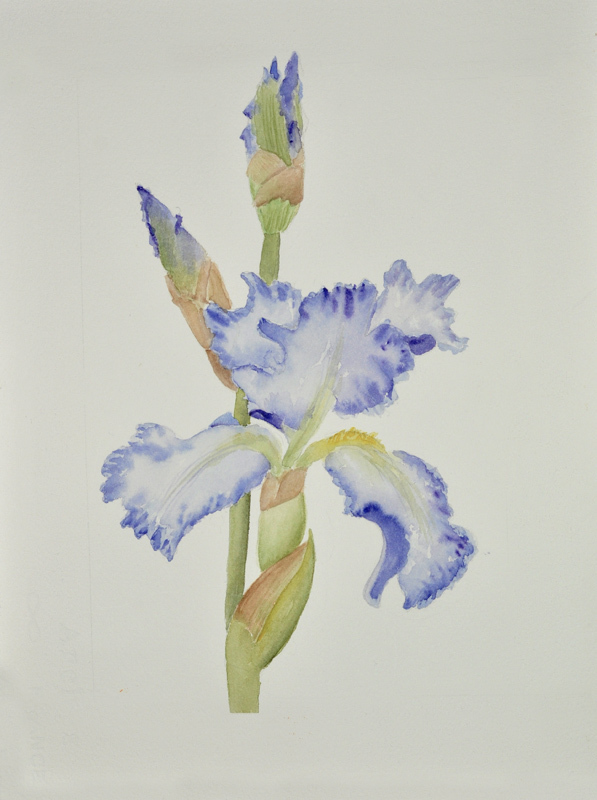 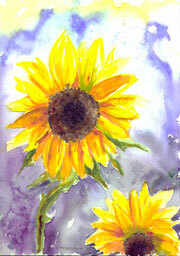 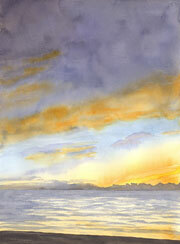 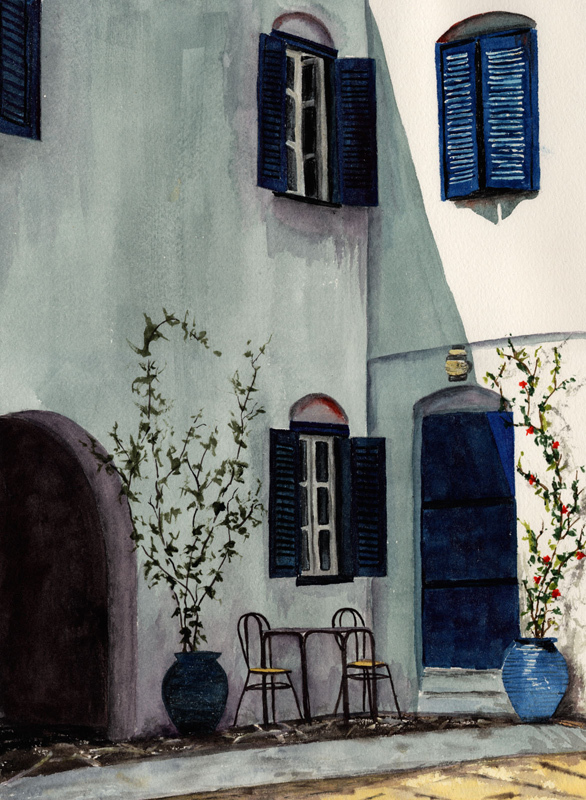 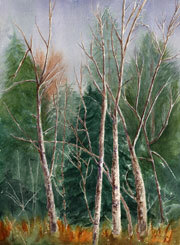 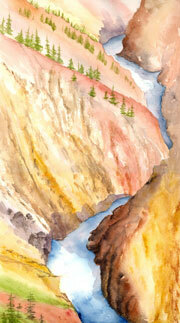 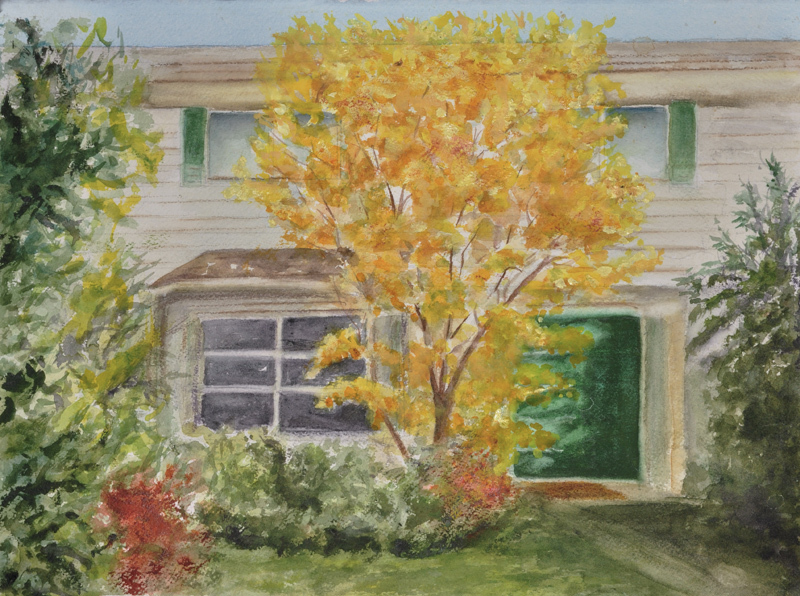 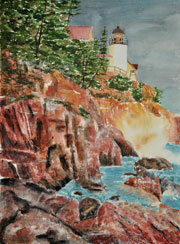 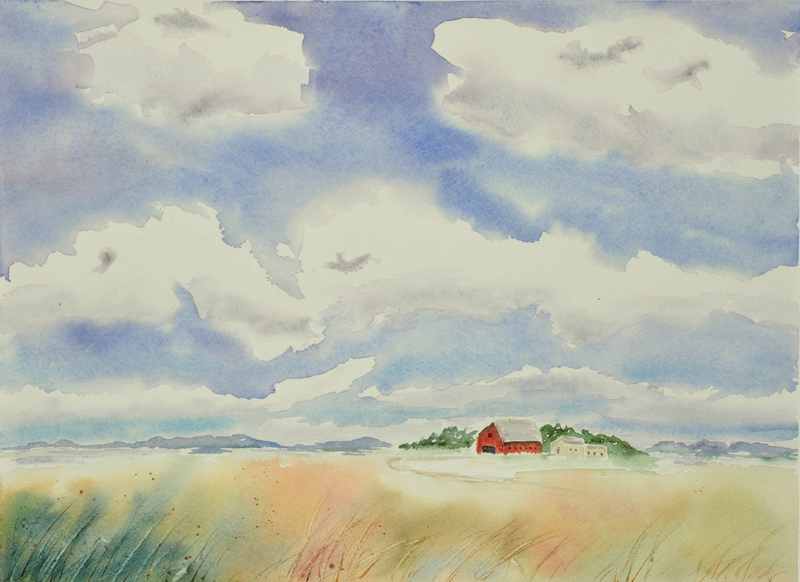 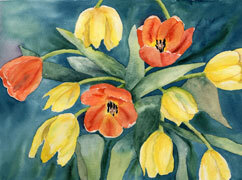 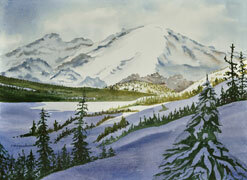 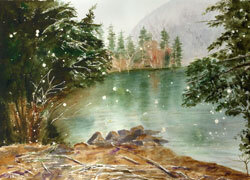 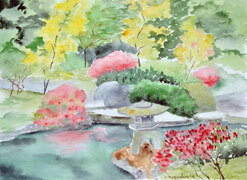 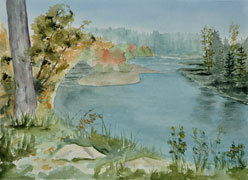 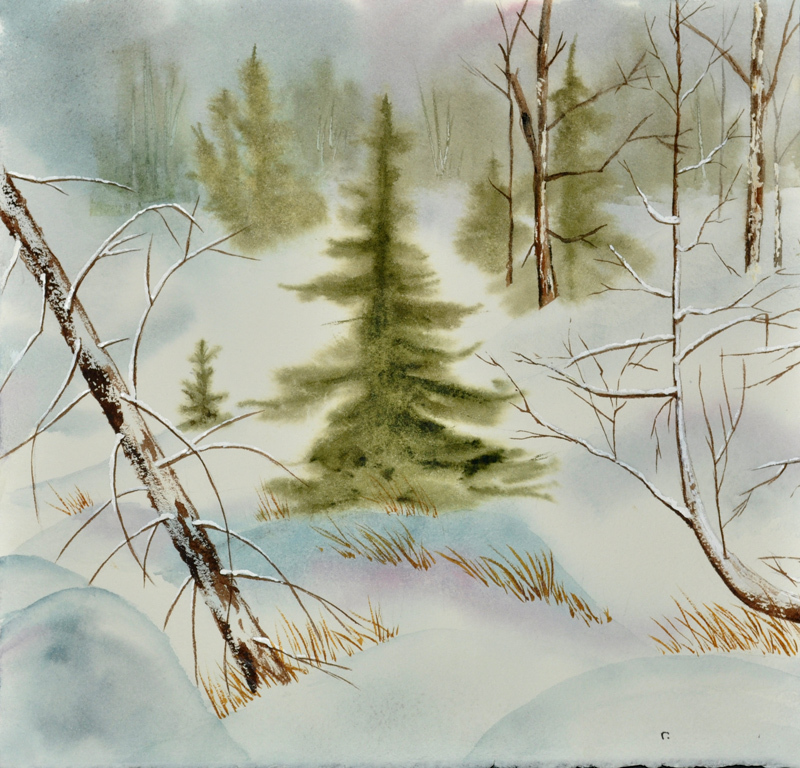 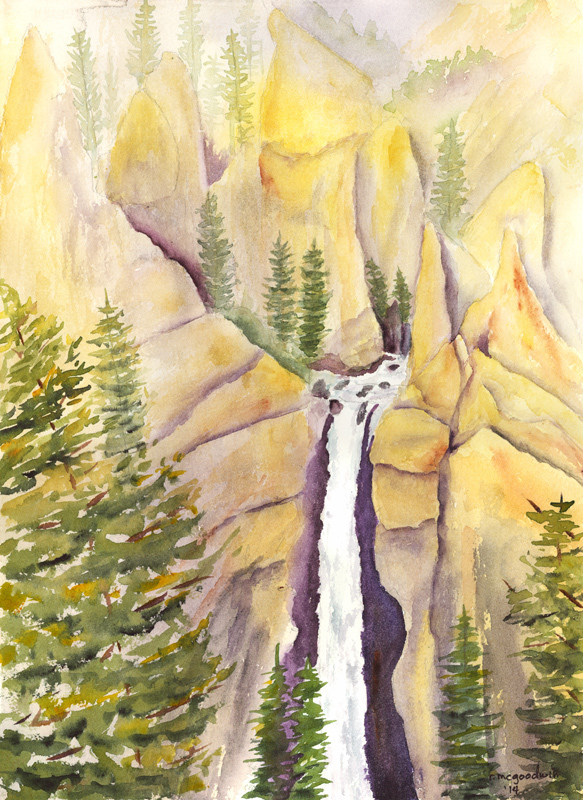 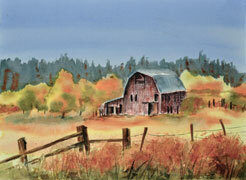 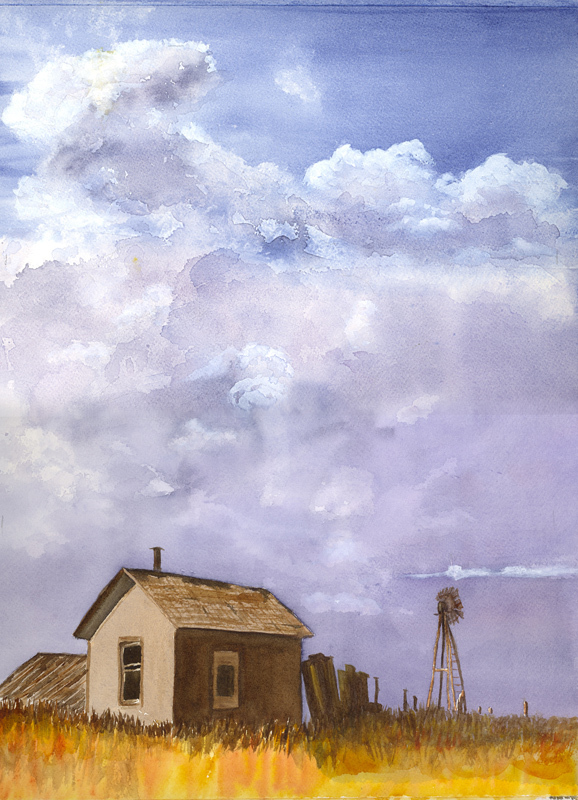 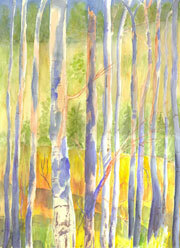 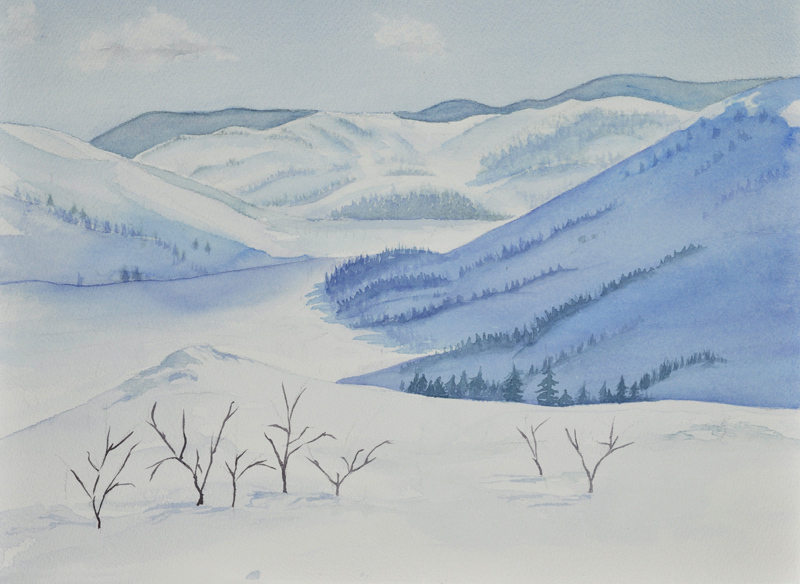 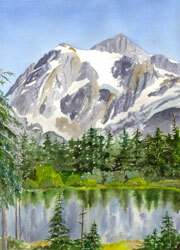 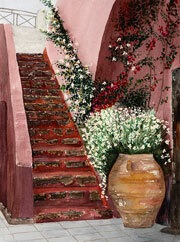 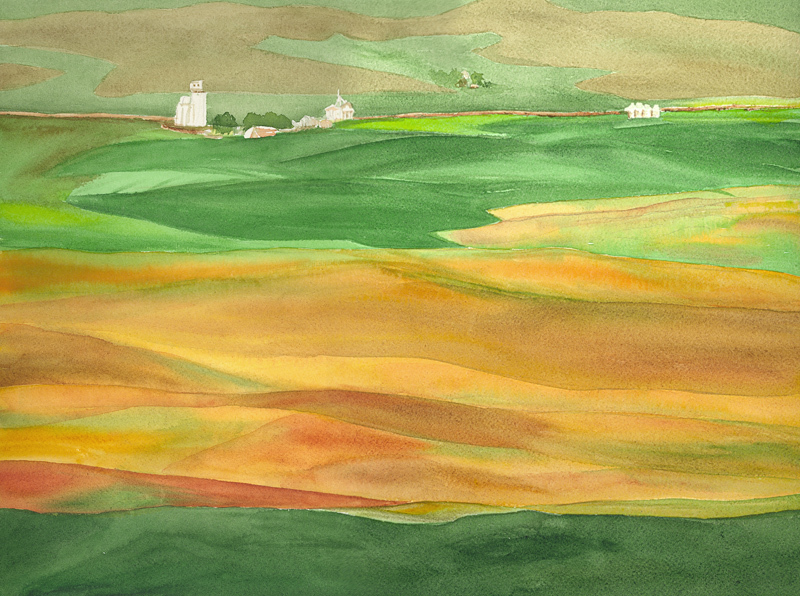 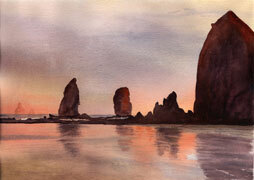 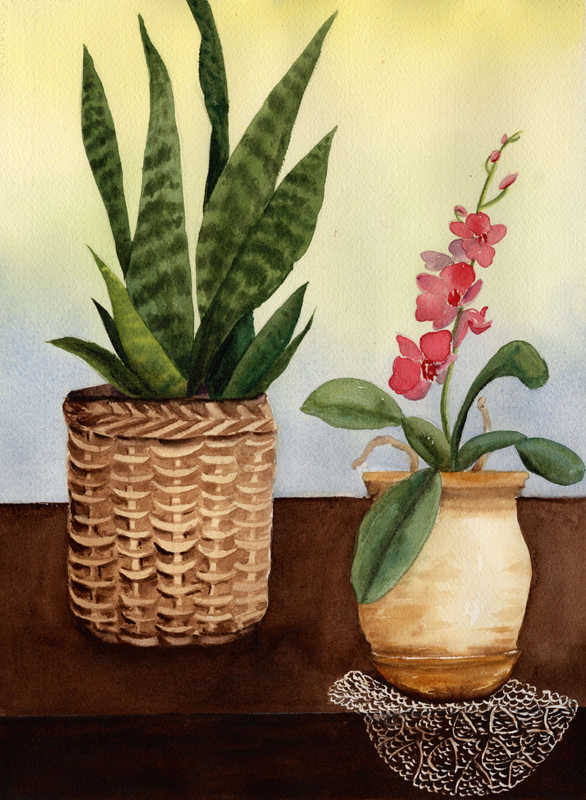 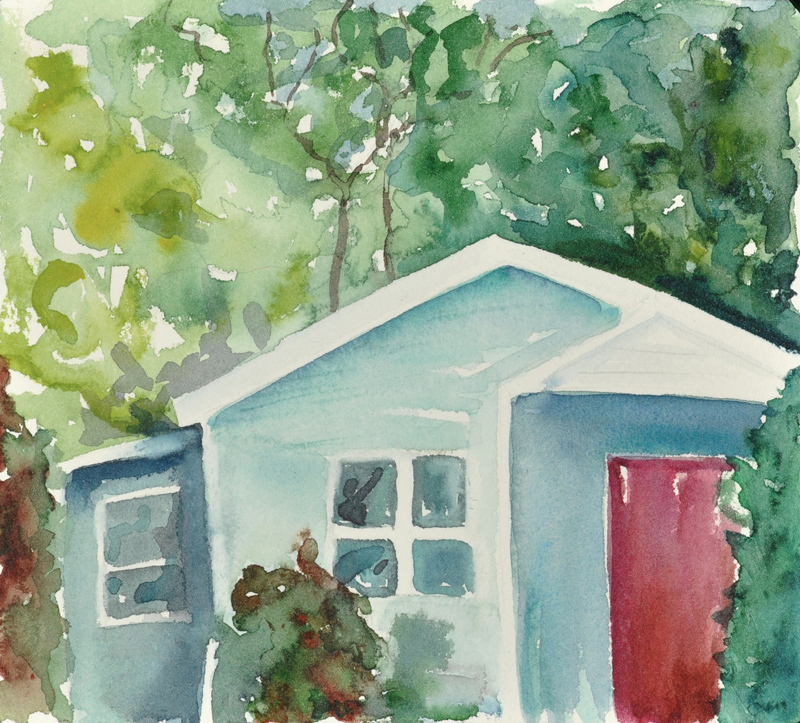 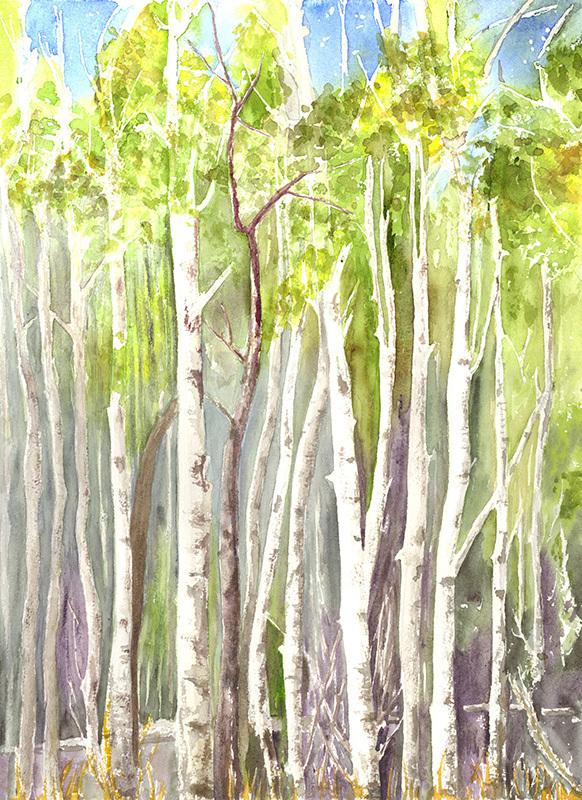 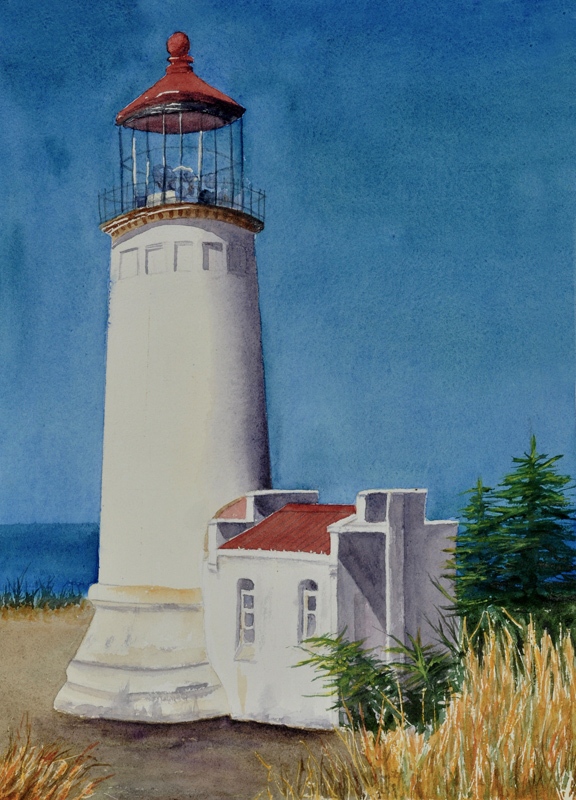 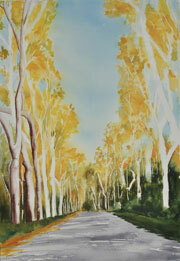 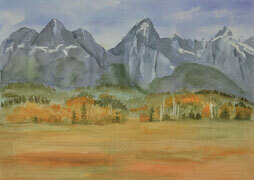 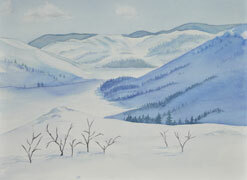 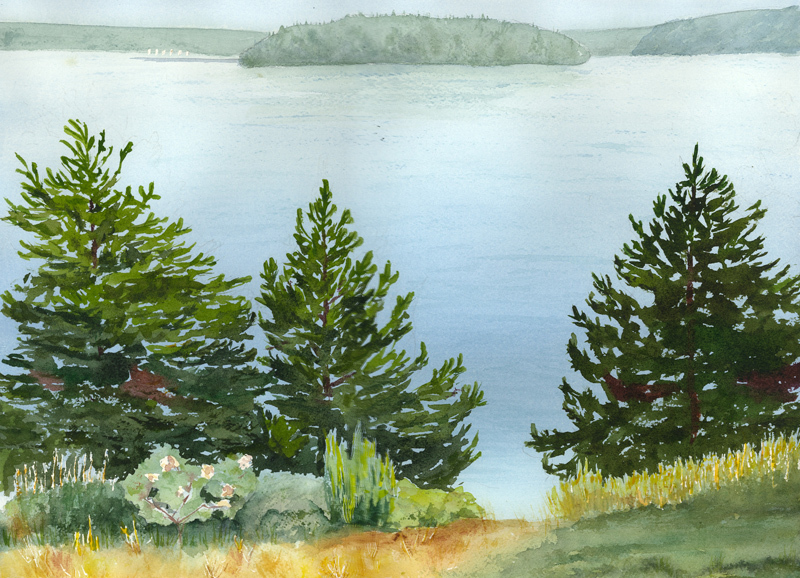 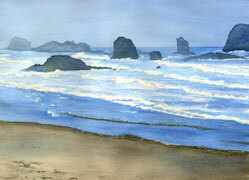 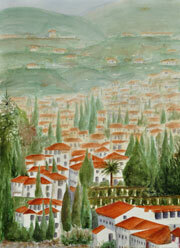 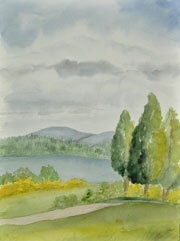 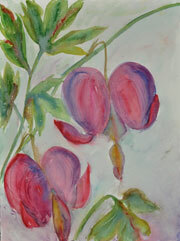 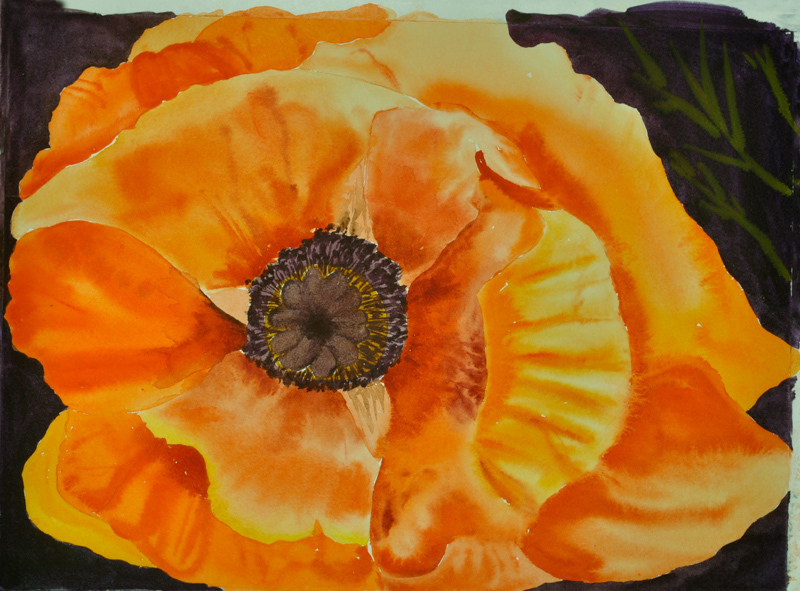 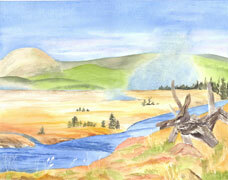 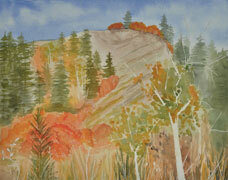 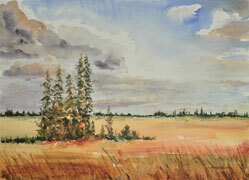 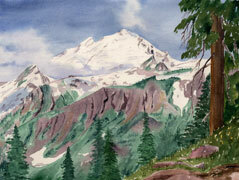 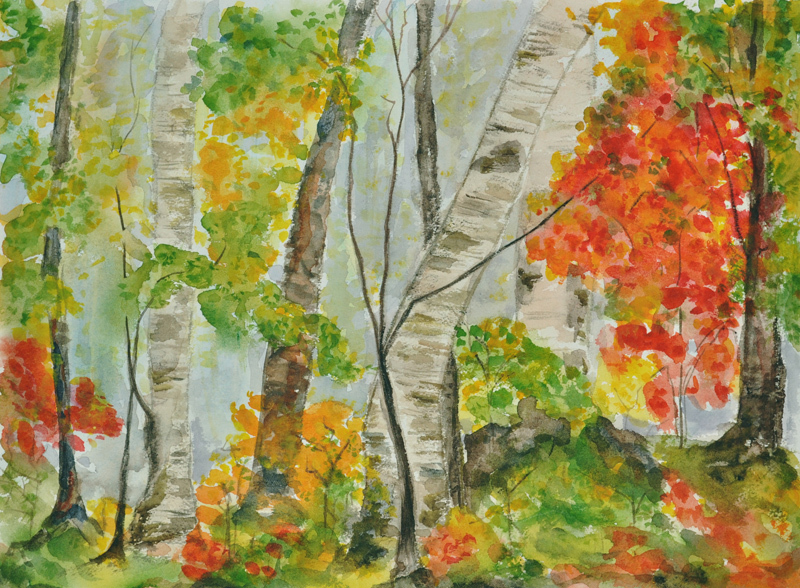 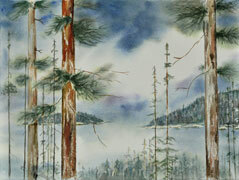 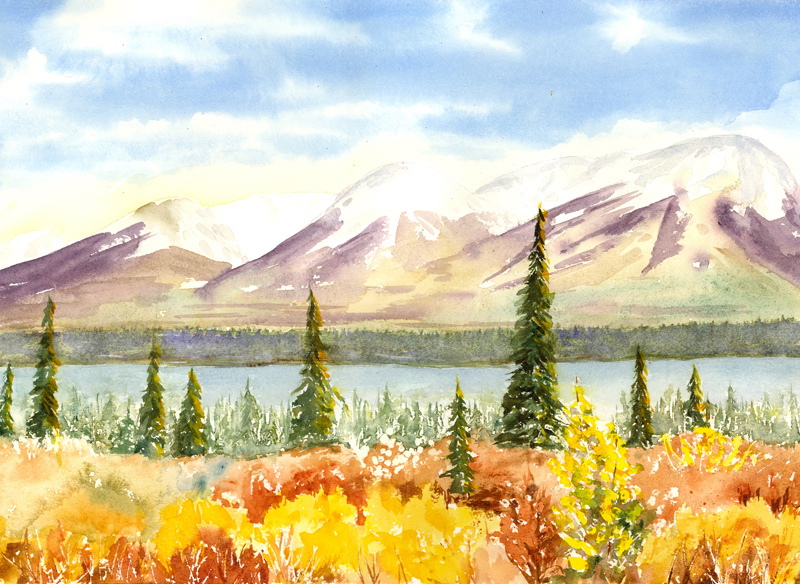 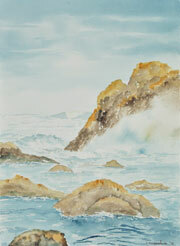 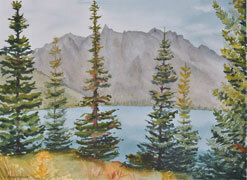 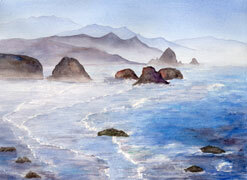 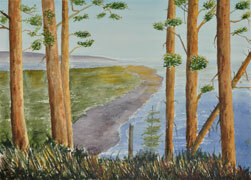 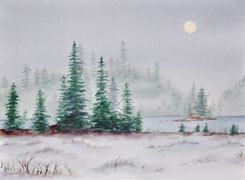 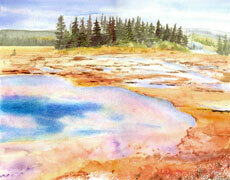 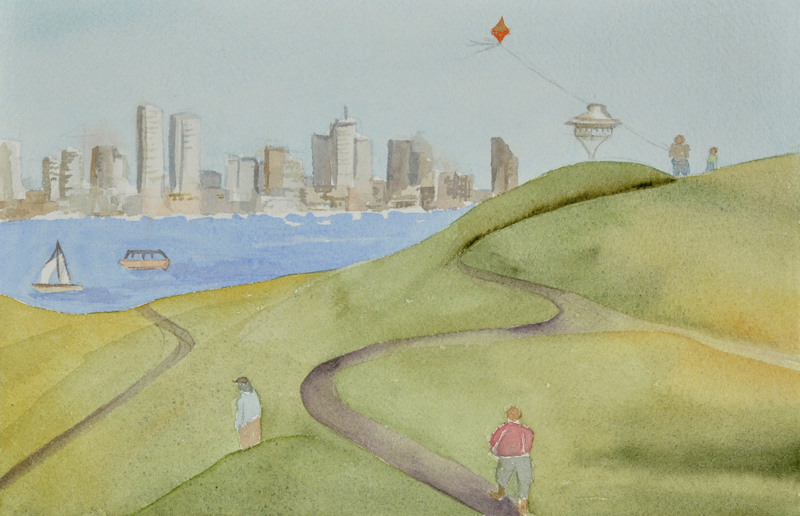 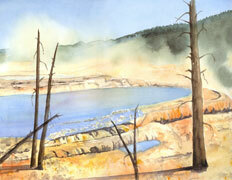 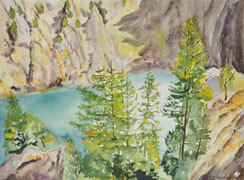 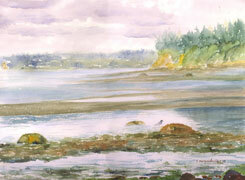 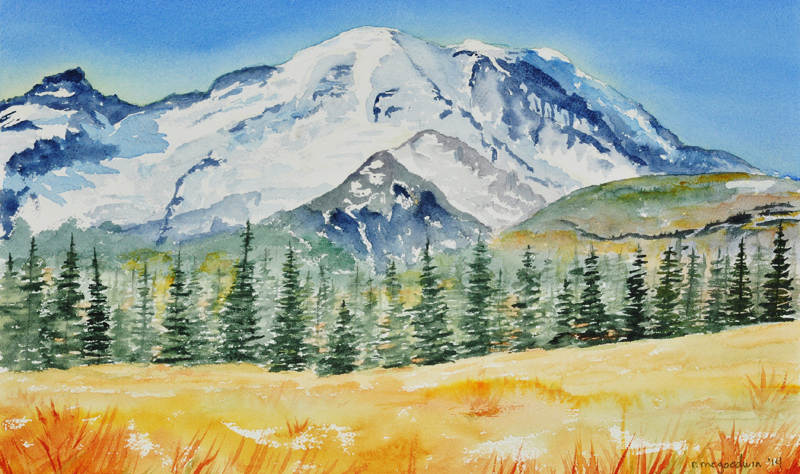 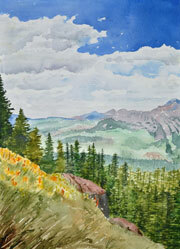 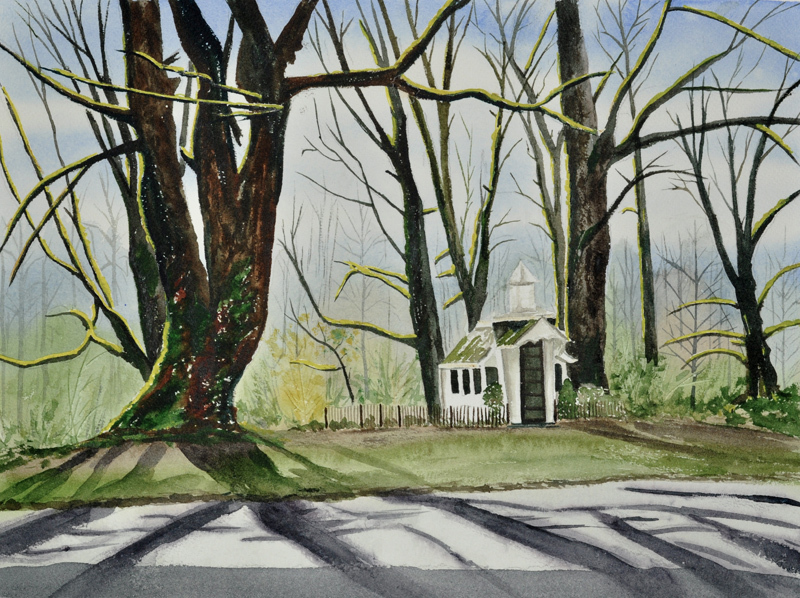 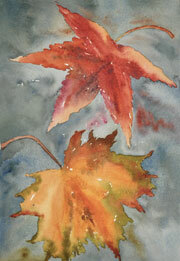 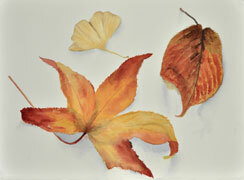 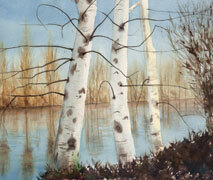 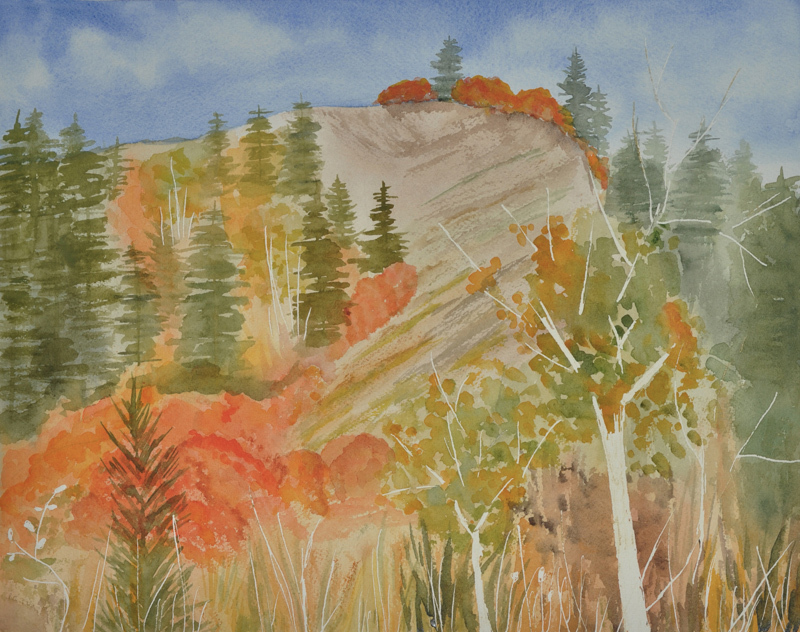 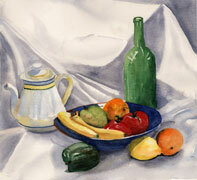 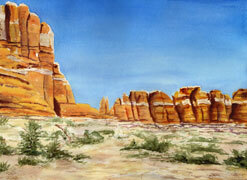 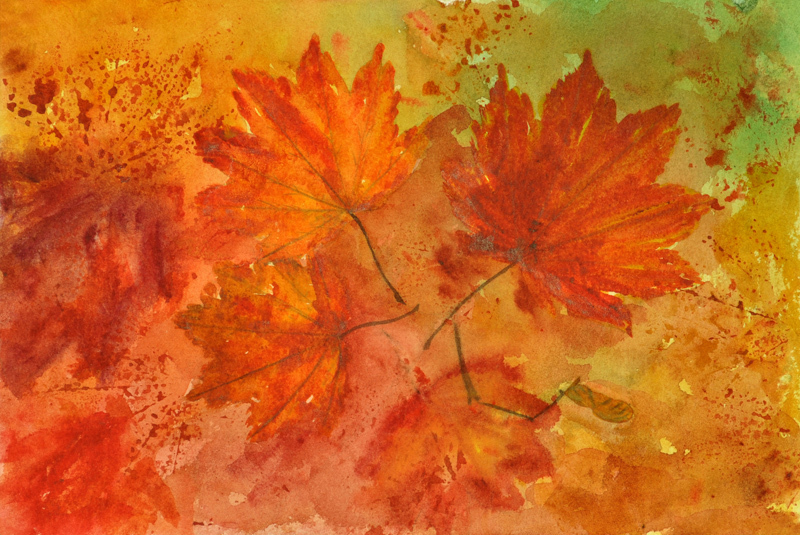 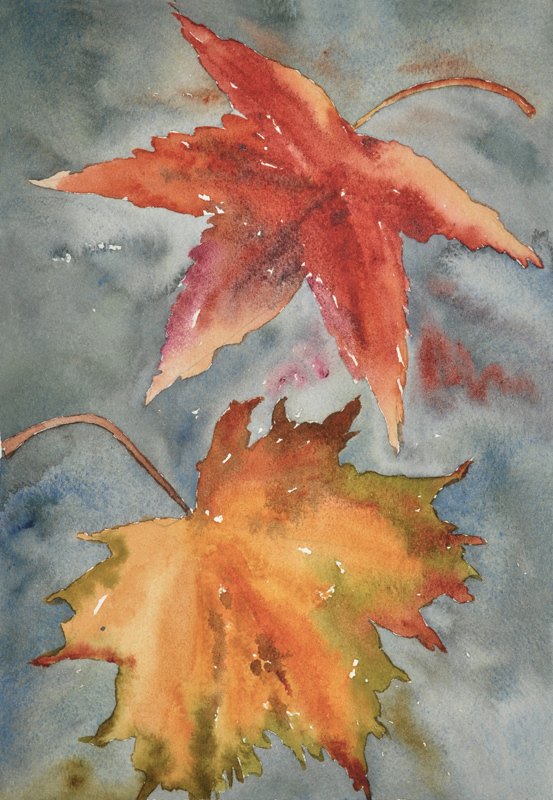 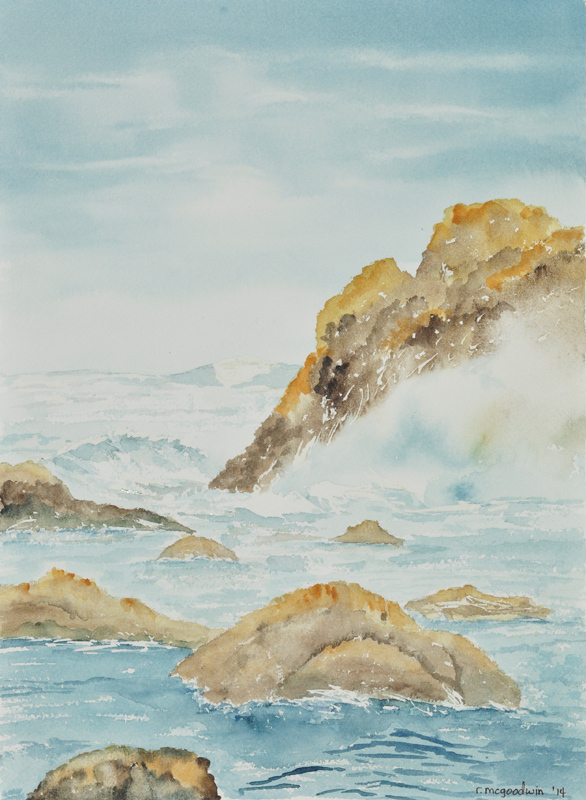 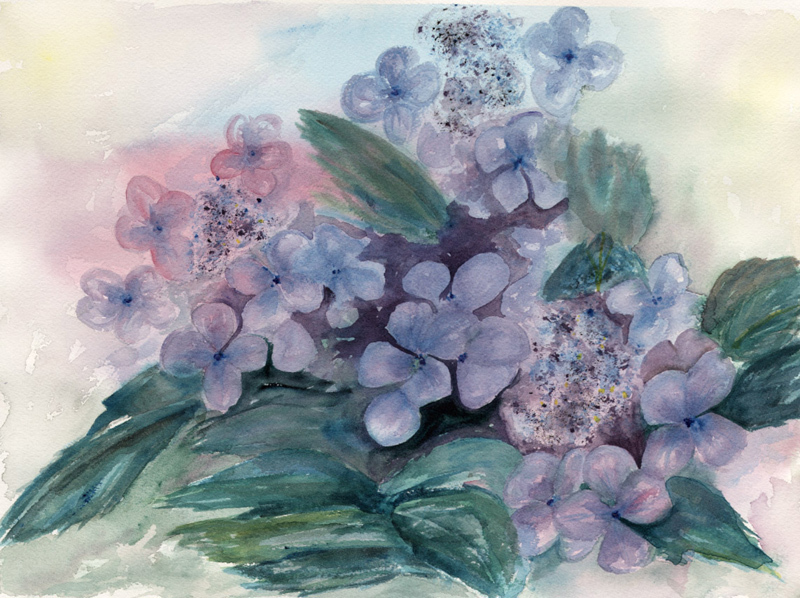 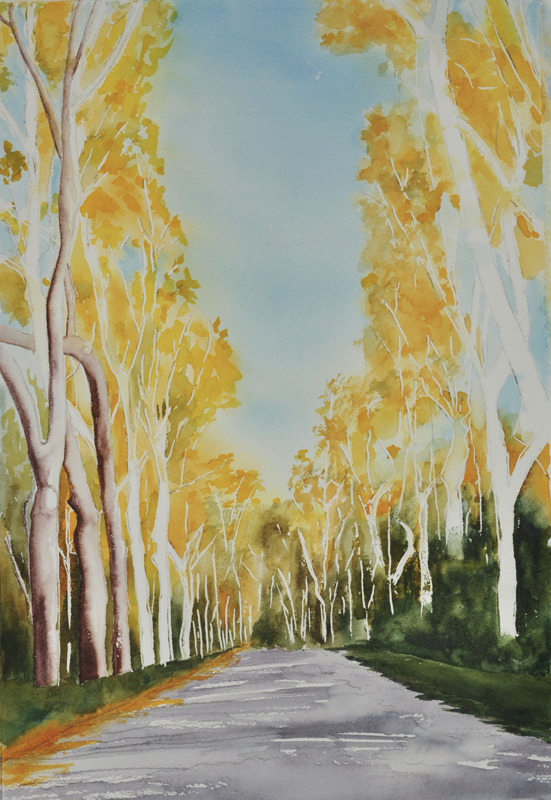 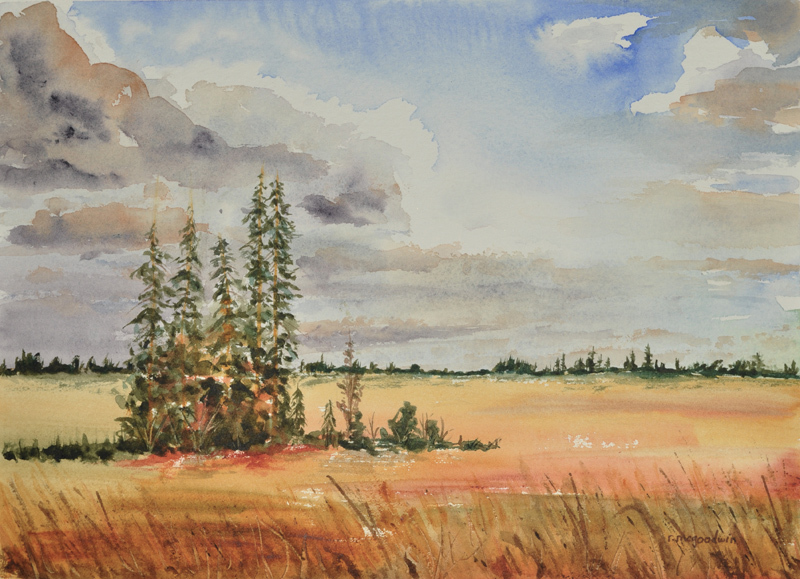 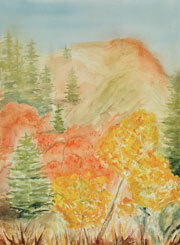 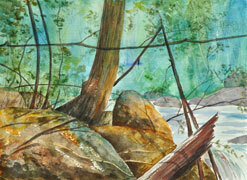 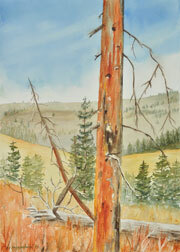 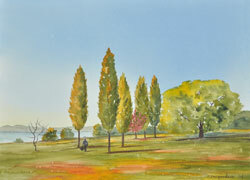 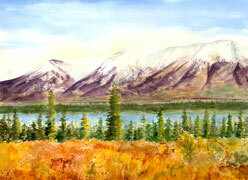 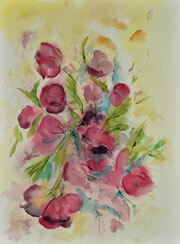 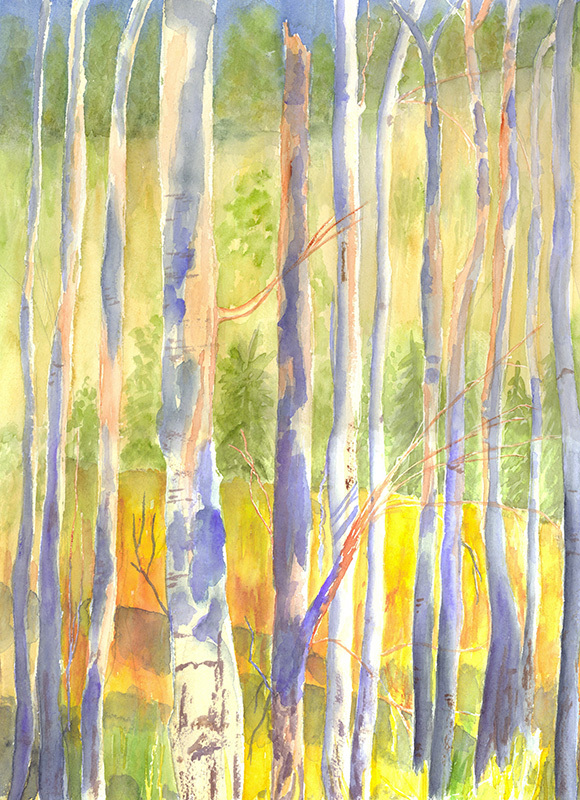 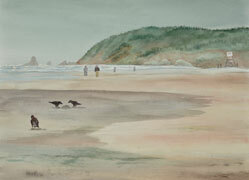 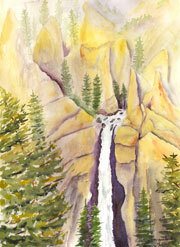 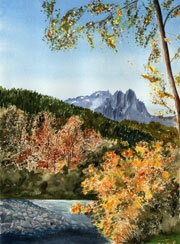 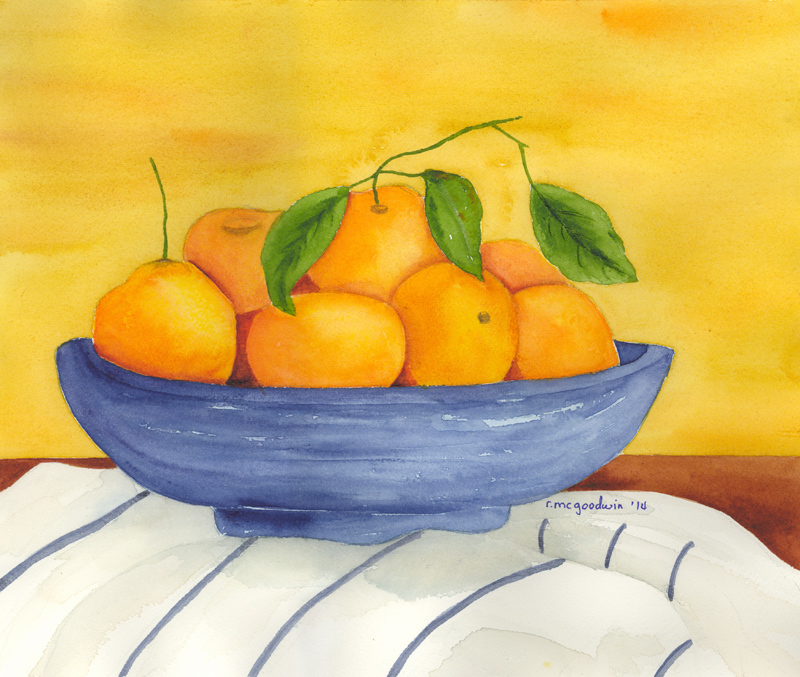 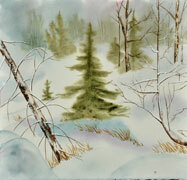 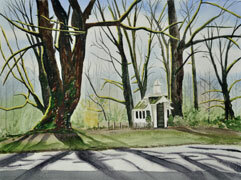 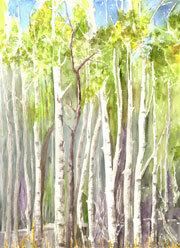 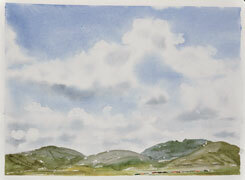 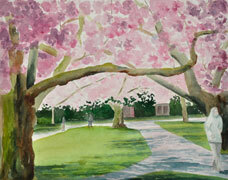 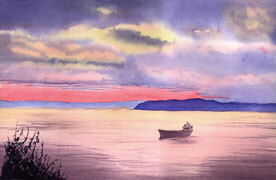 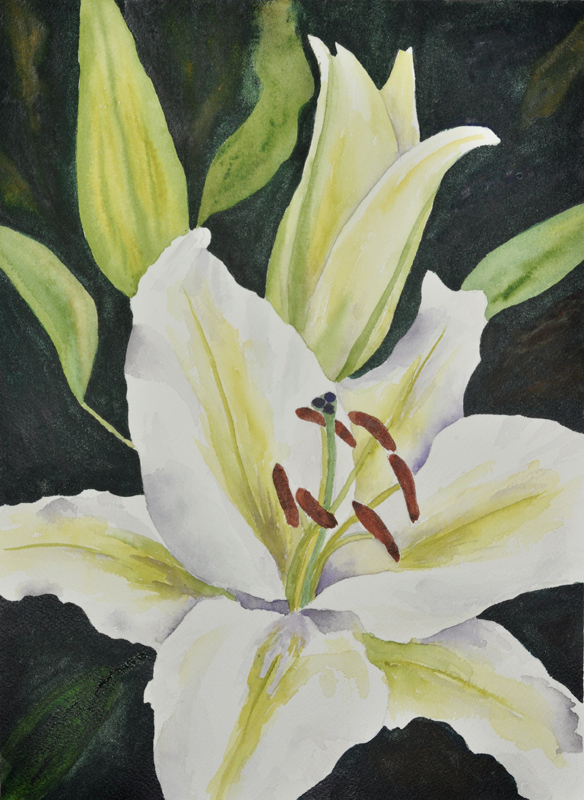 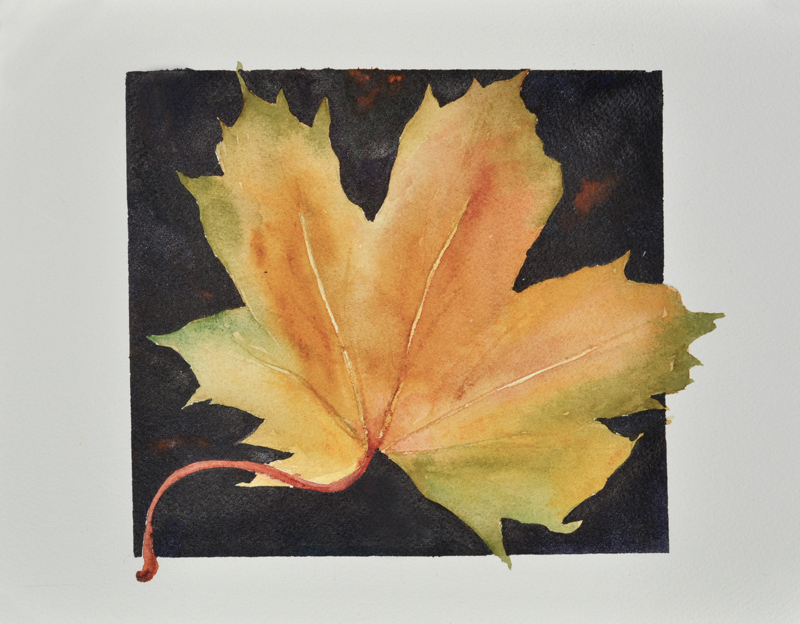 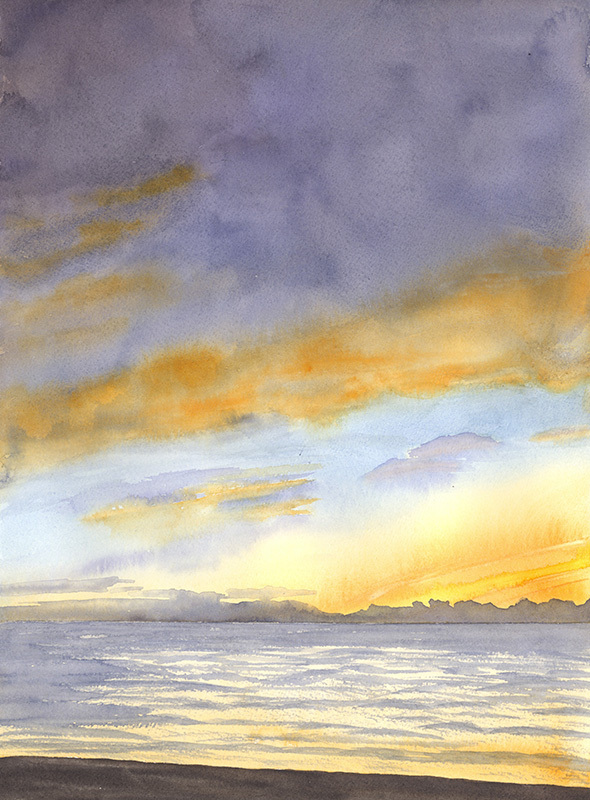 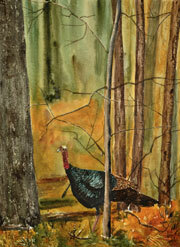 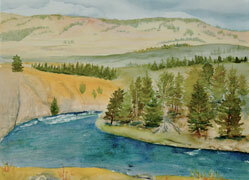 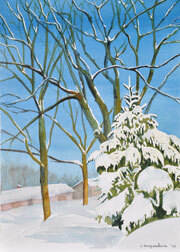 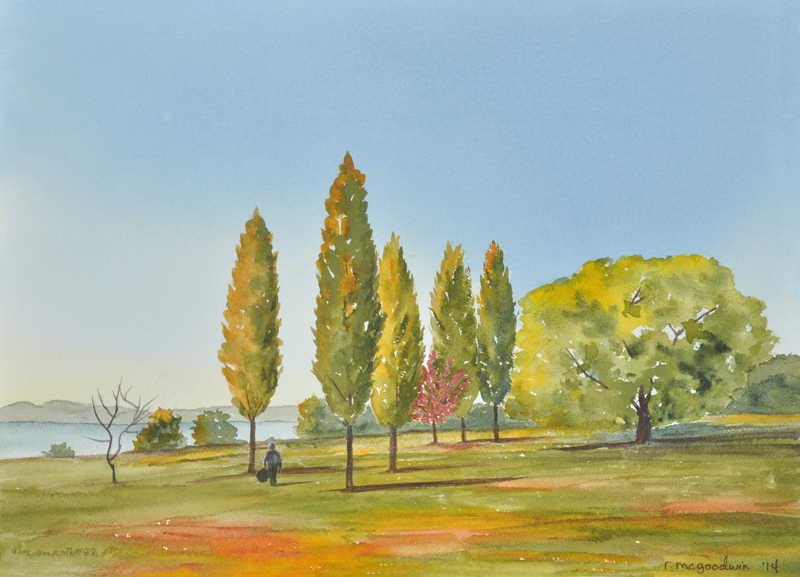 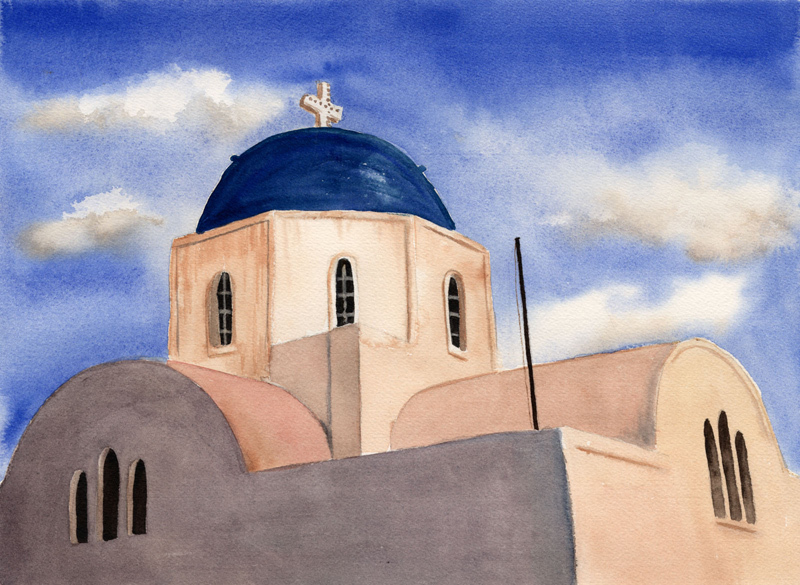 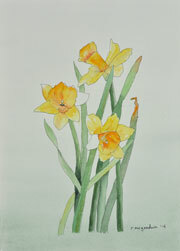 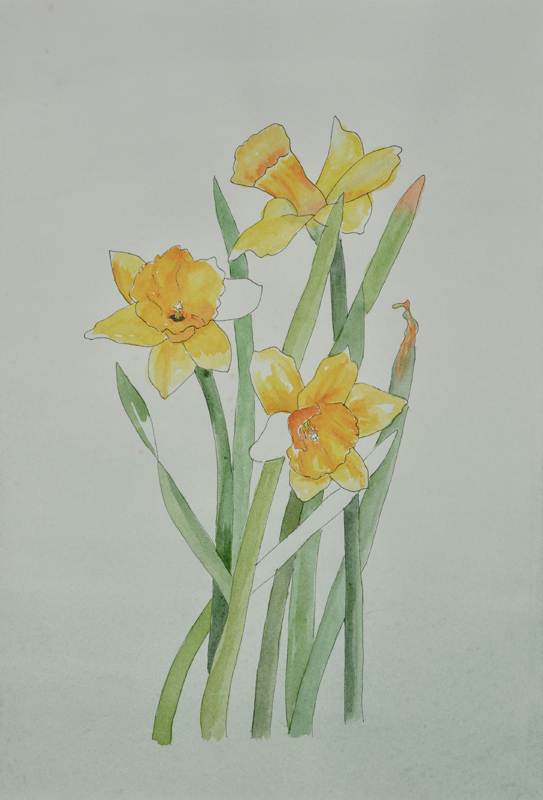 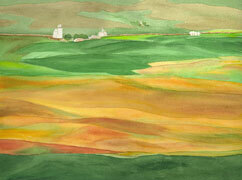 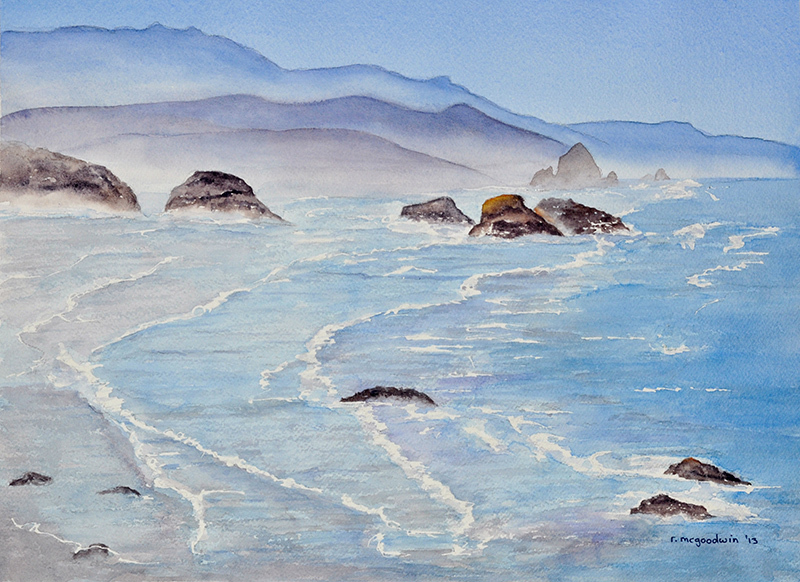 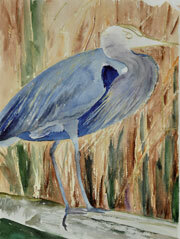 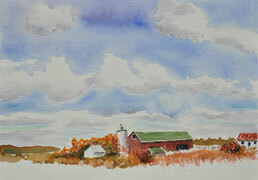 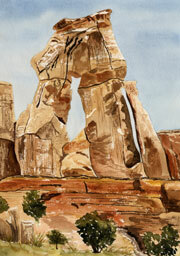 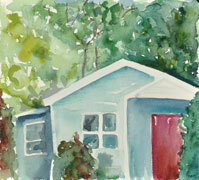 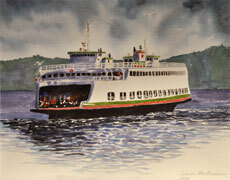 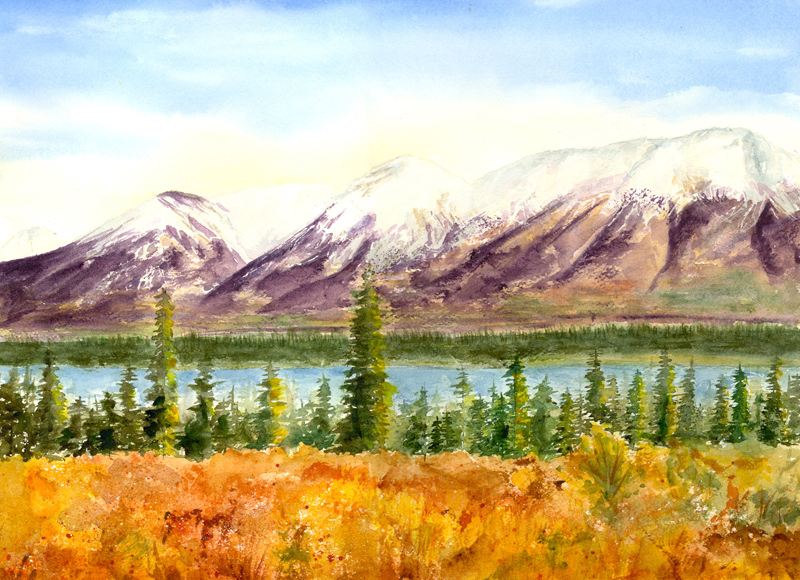 She took up watercolor painting in about 1999 (when she was in her mid-50's). 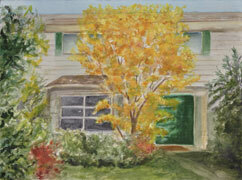 Her favorite subjects varied over the years and were influenced by courses she was taking. 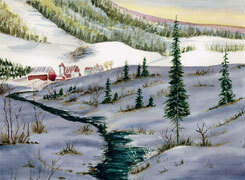 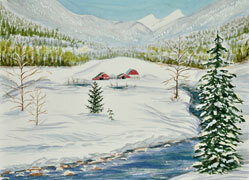 Subjects included landscapes (farms and barns, snowy and seashore scenes, mountains, lakes and rivers, etc. 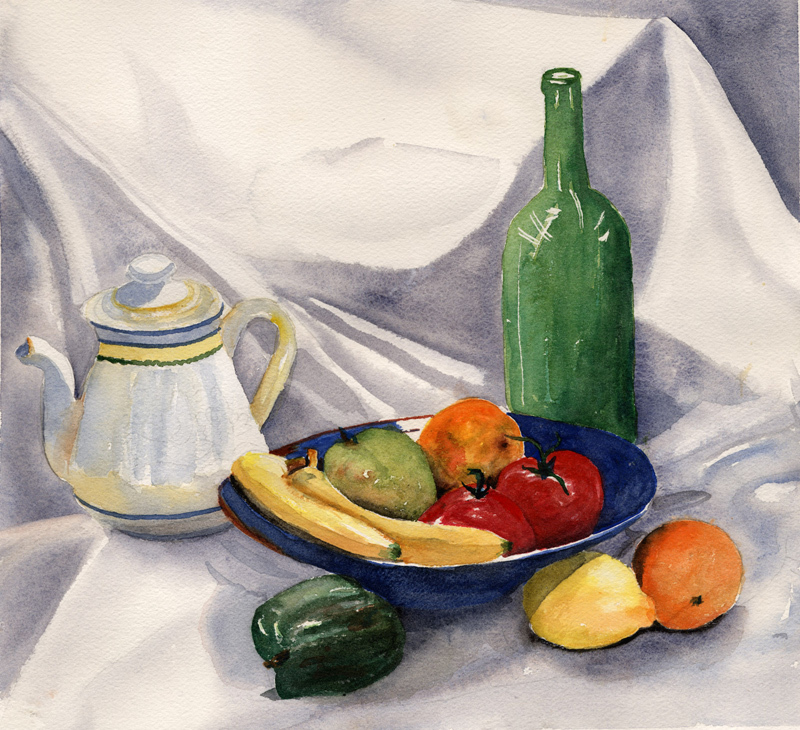 ), still lifes (typically with flowers, fruits, or vegetables), plein air works (drawn while outside), ferries and boats, birds, scenes in Europe, and a variety of structures (lighthouses, staircases, etc.) 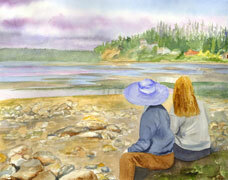 She tended to avoid faces, which she found more difficult. 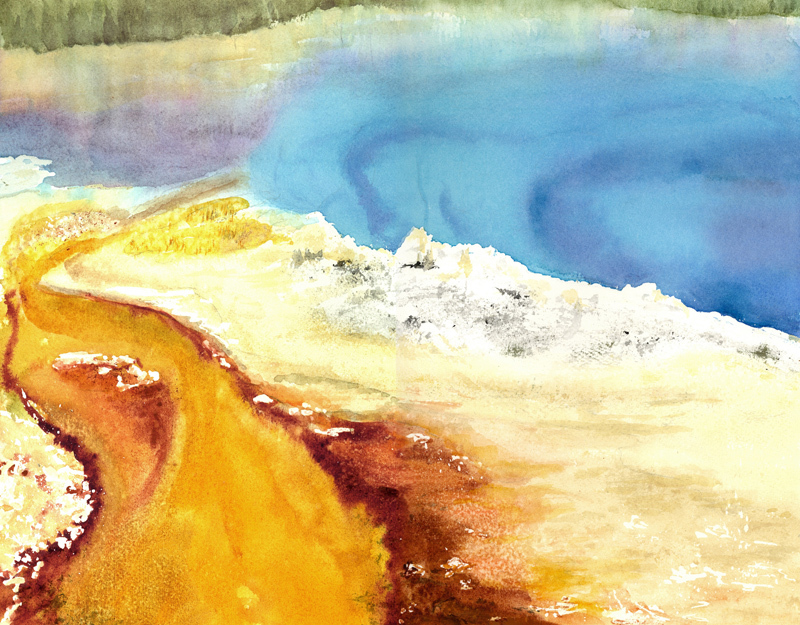 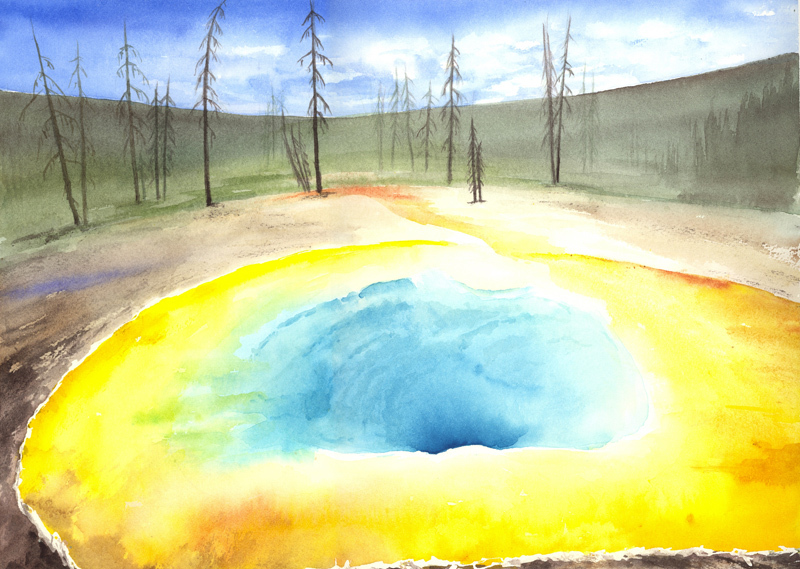 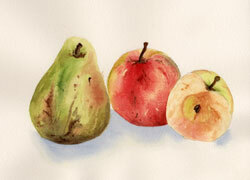 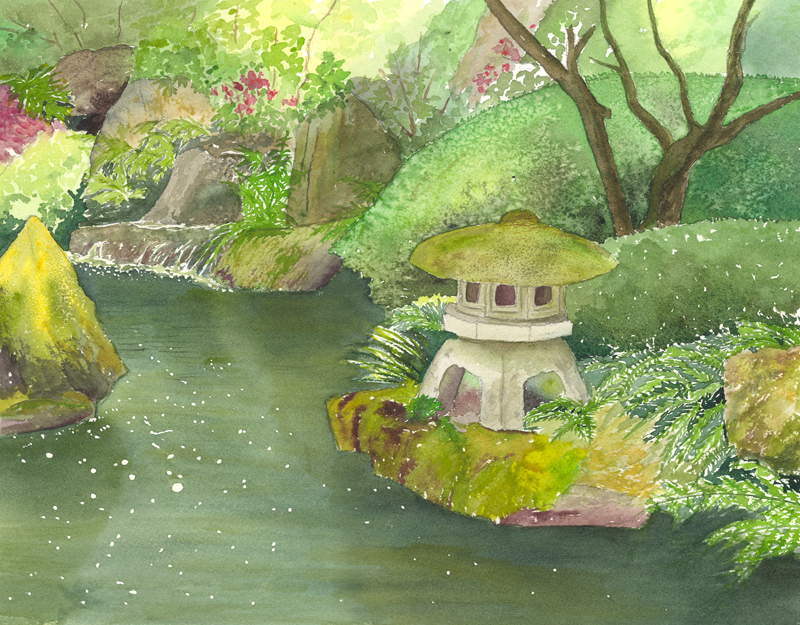 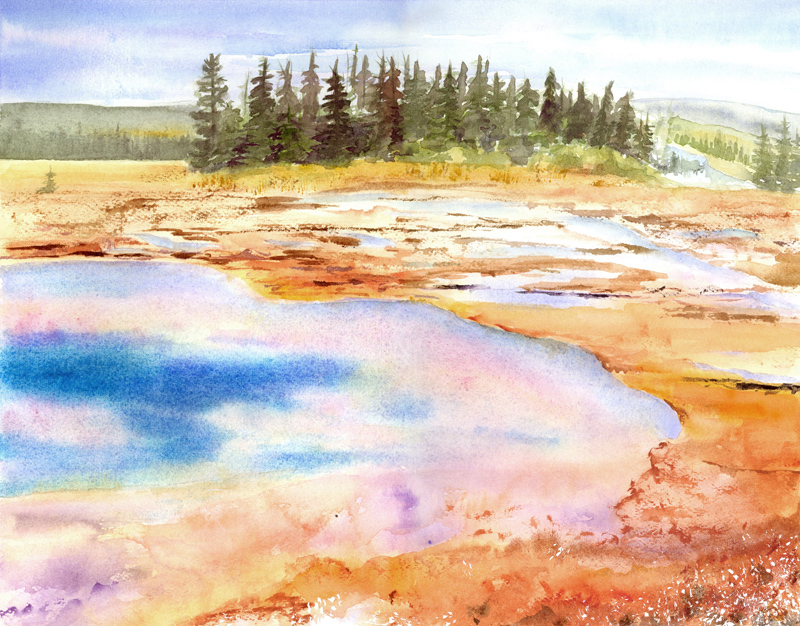 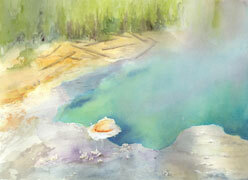 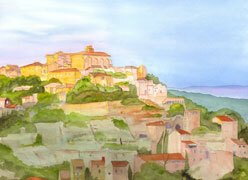 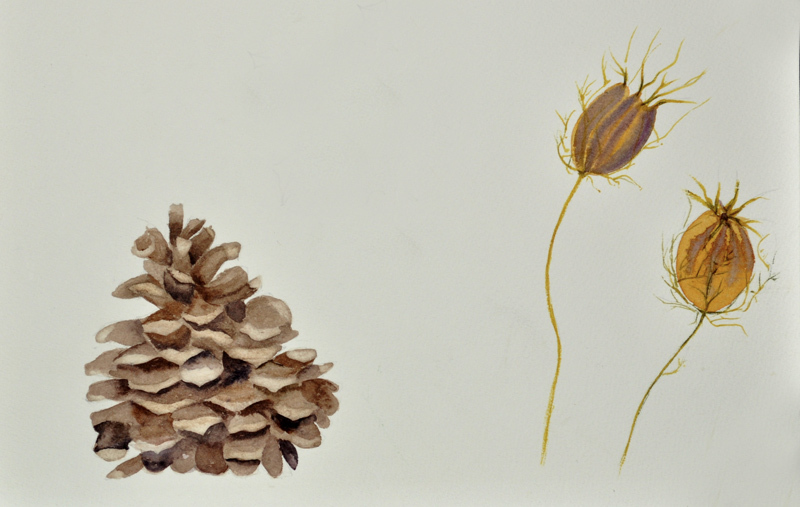 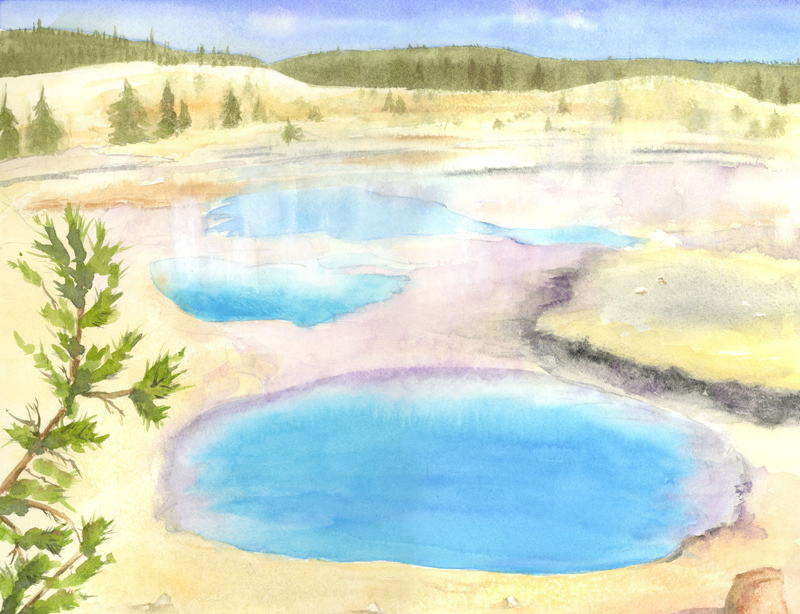 Paintings versus Studies: The works are divided into Watercolor Paintings and Watercolor Studies. 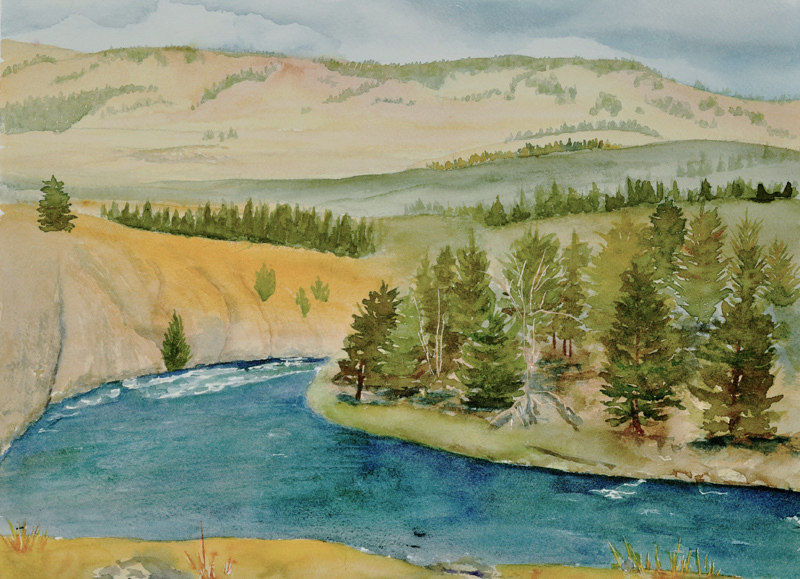 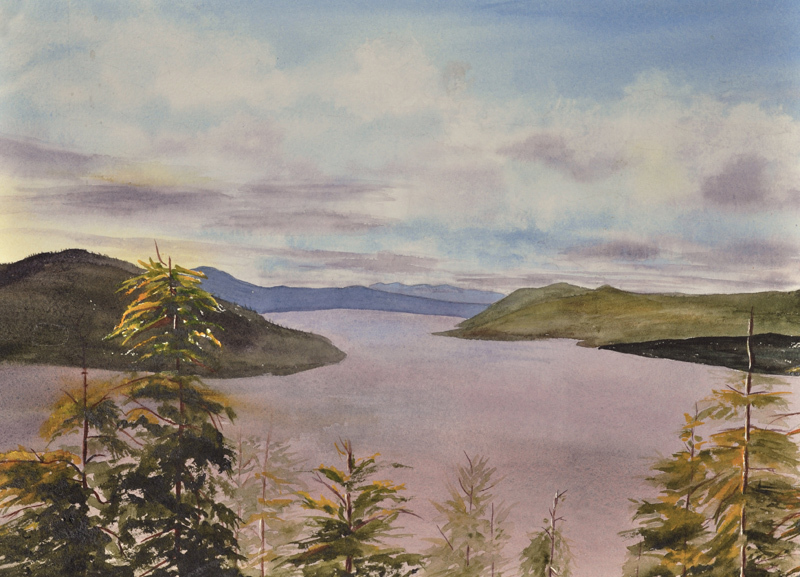 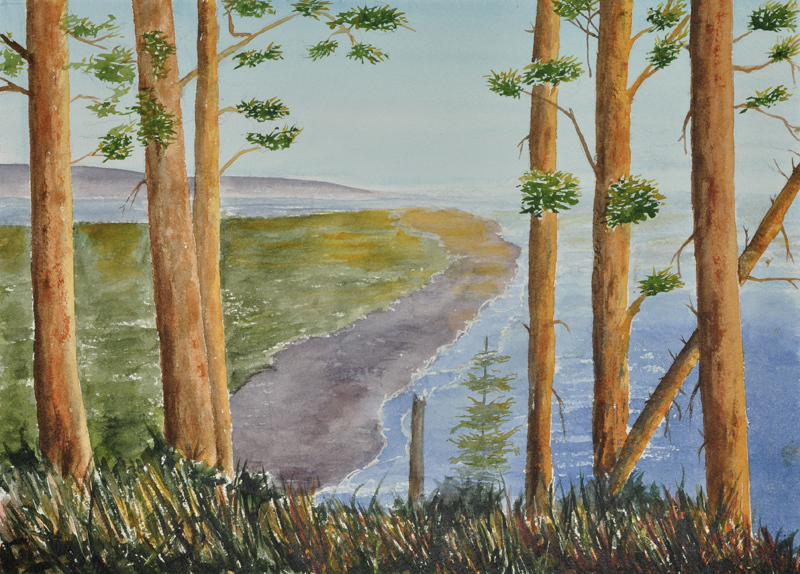 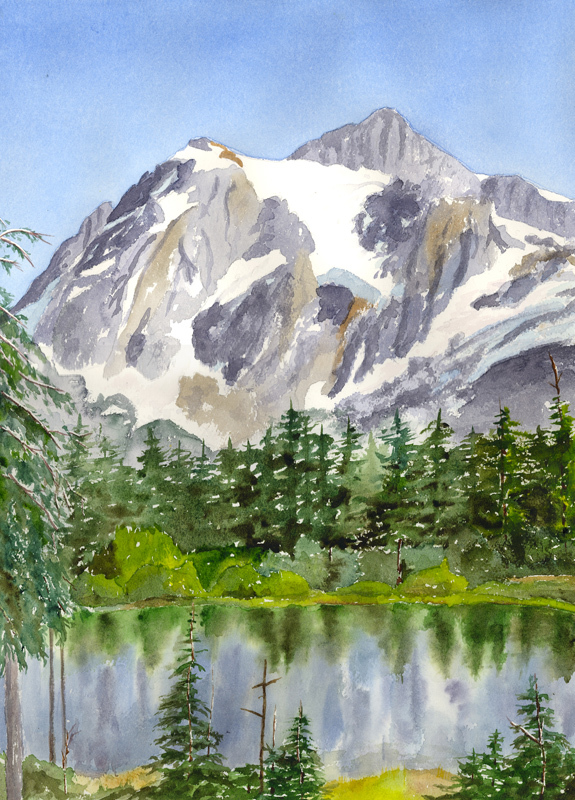 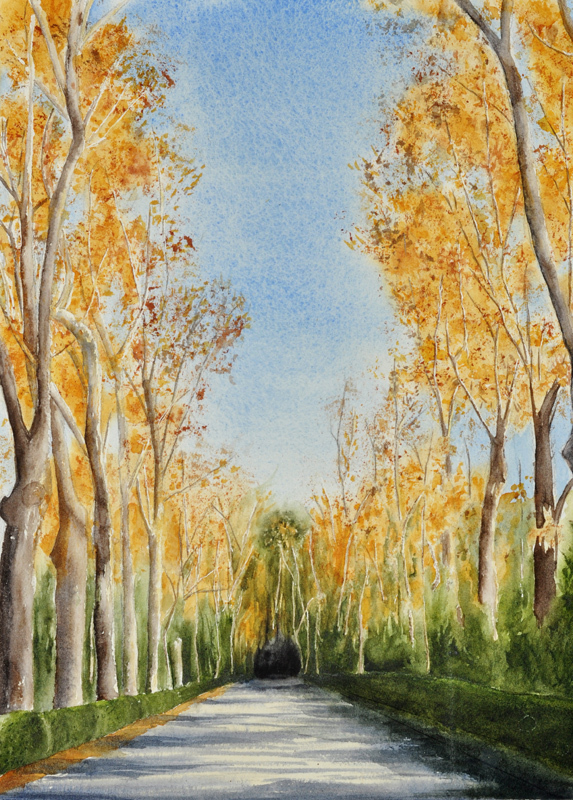 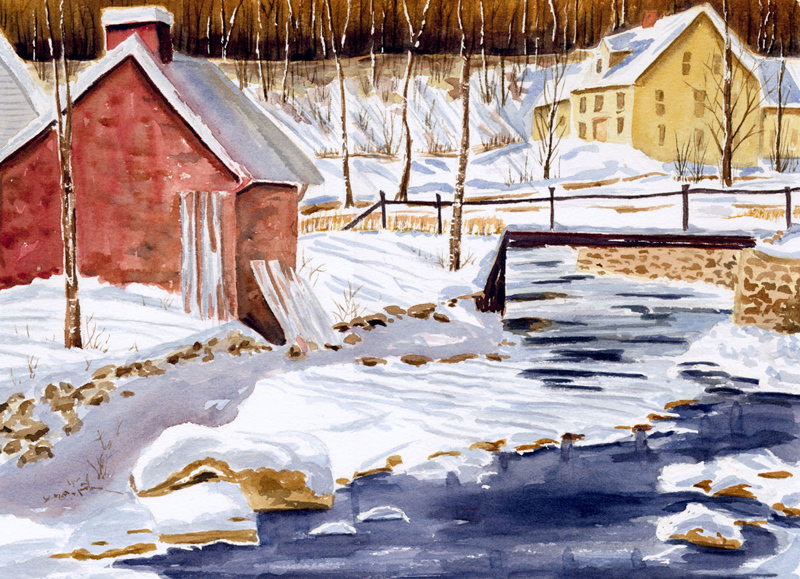 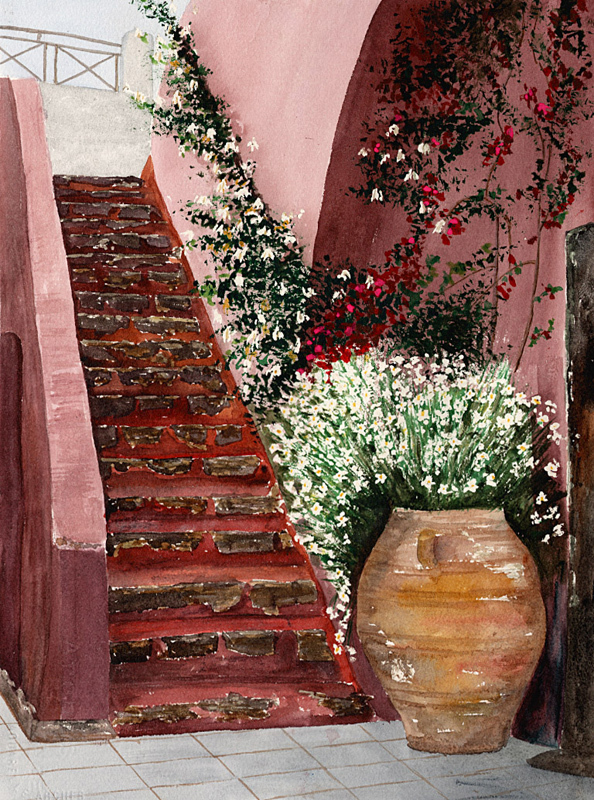 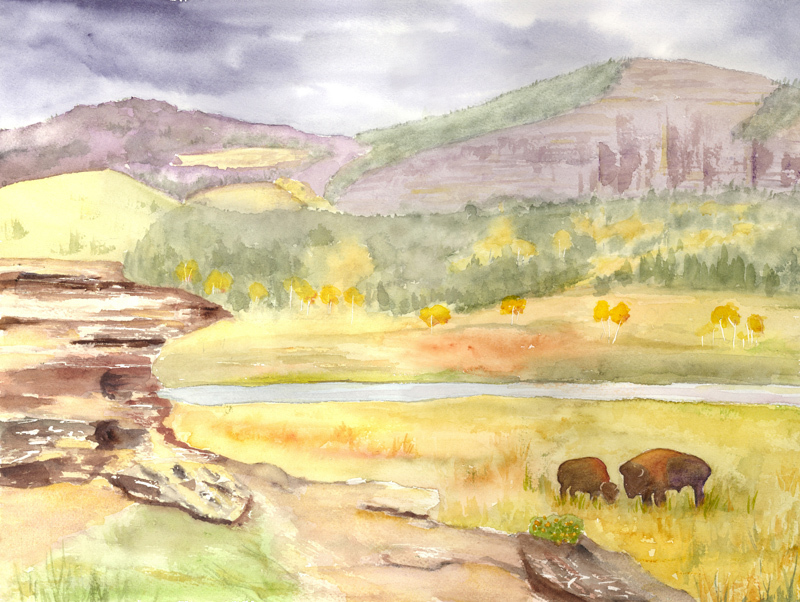 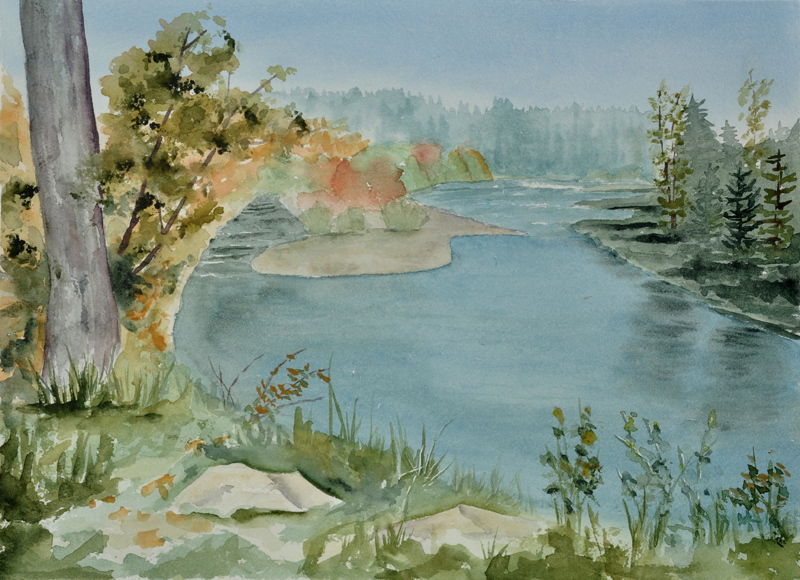 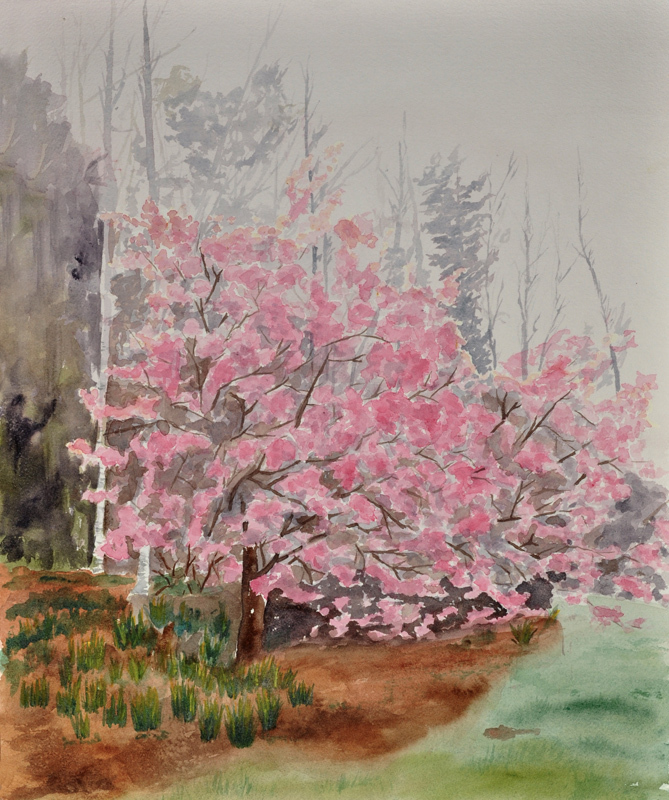 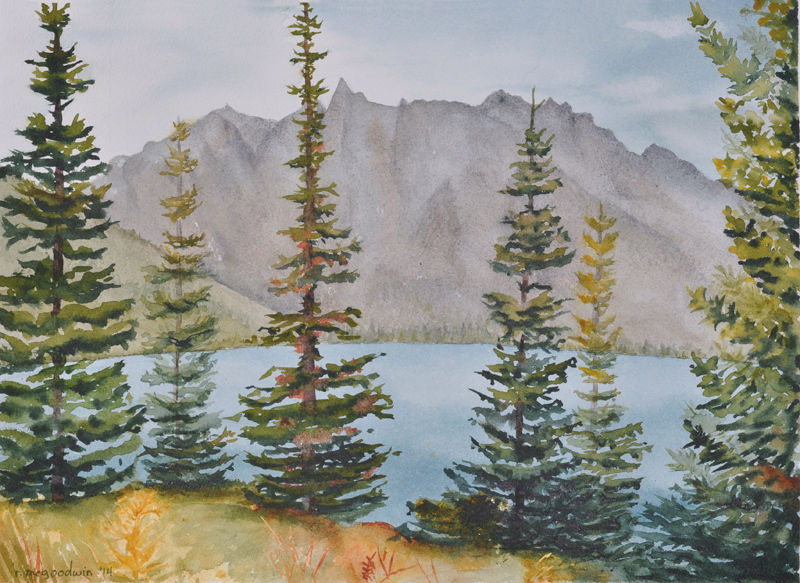 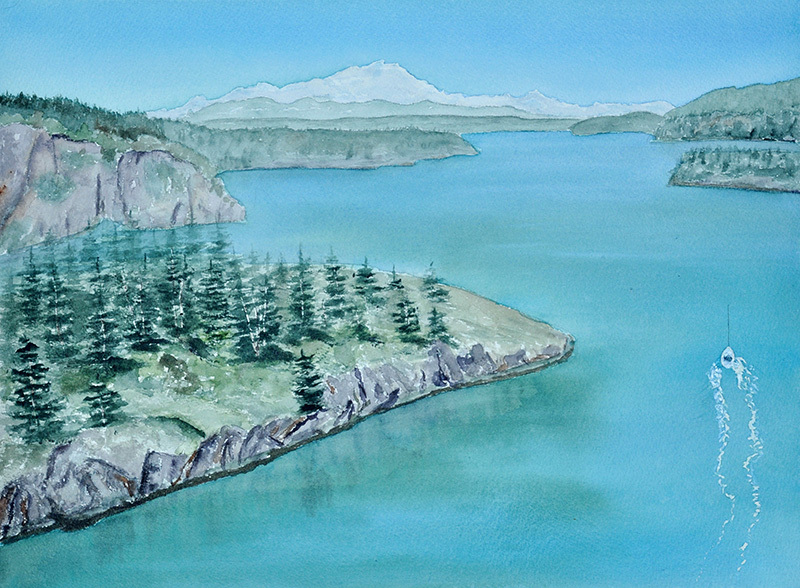 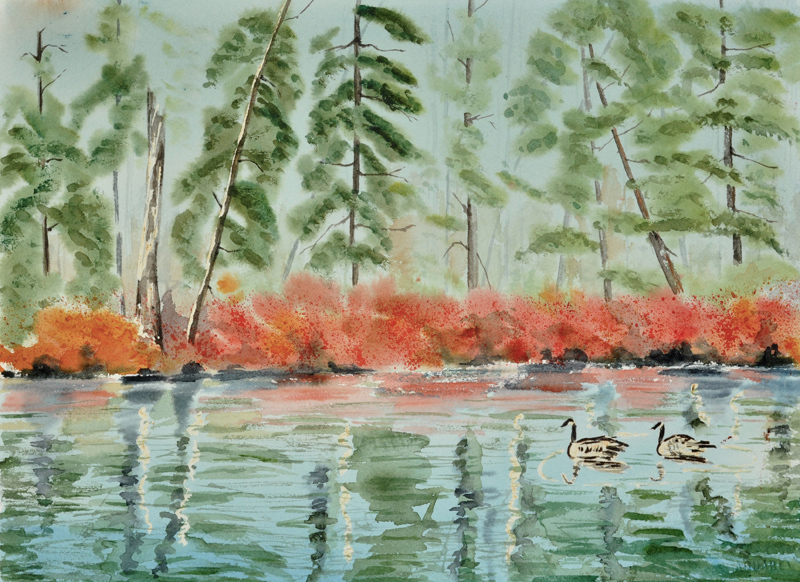 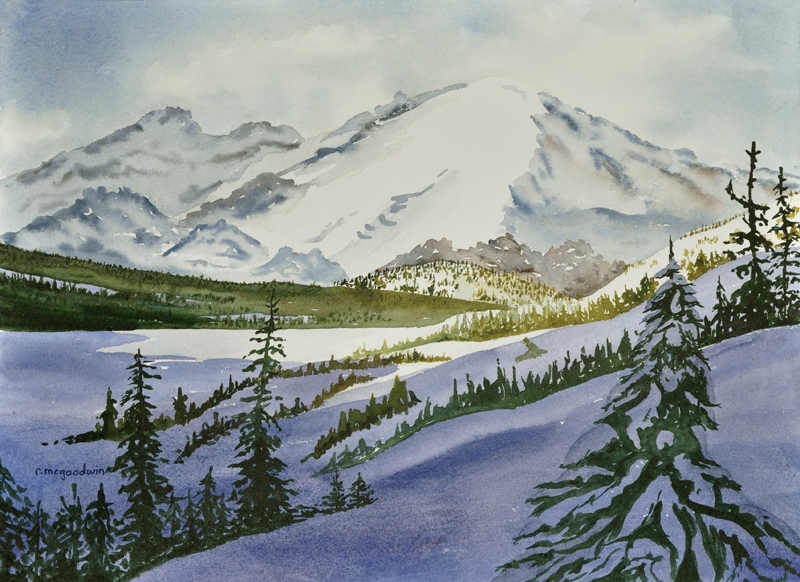 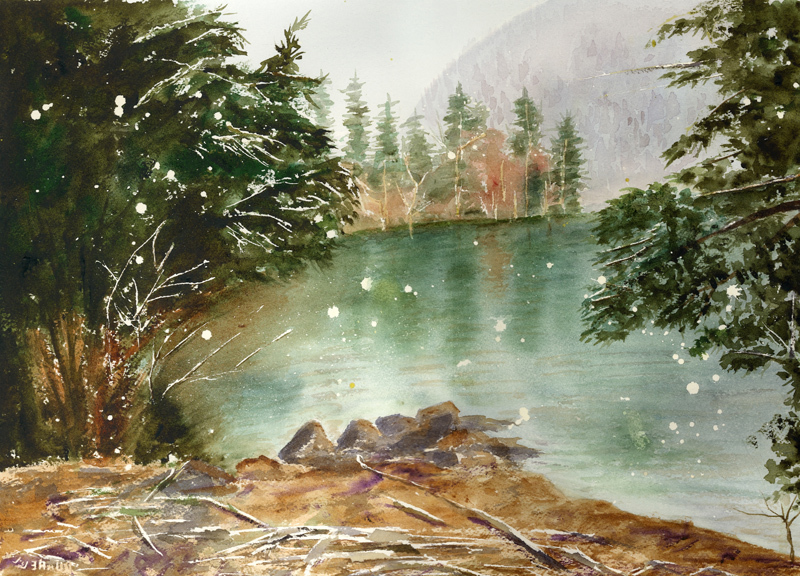 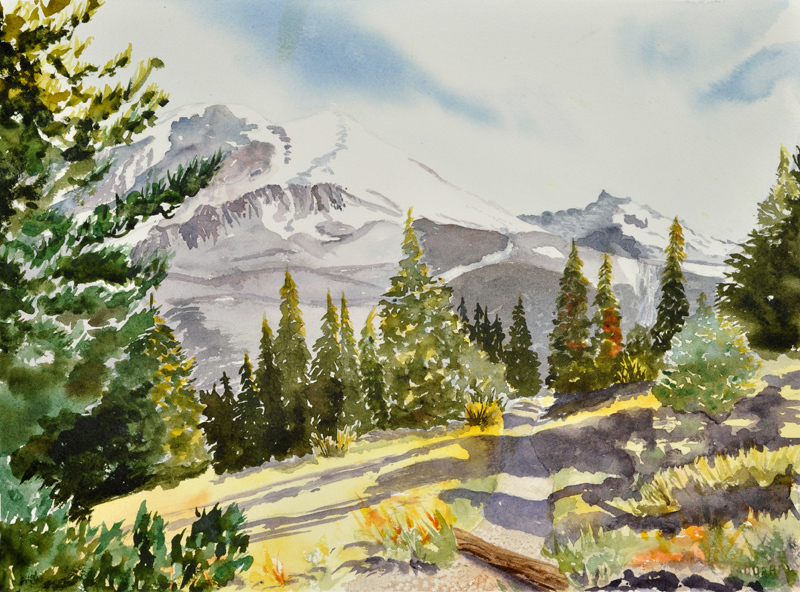 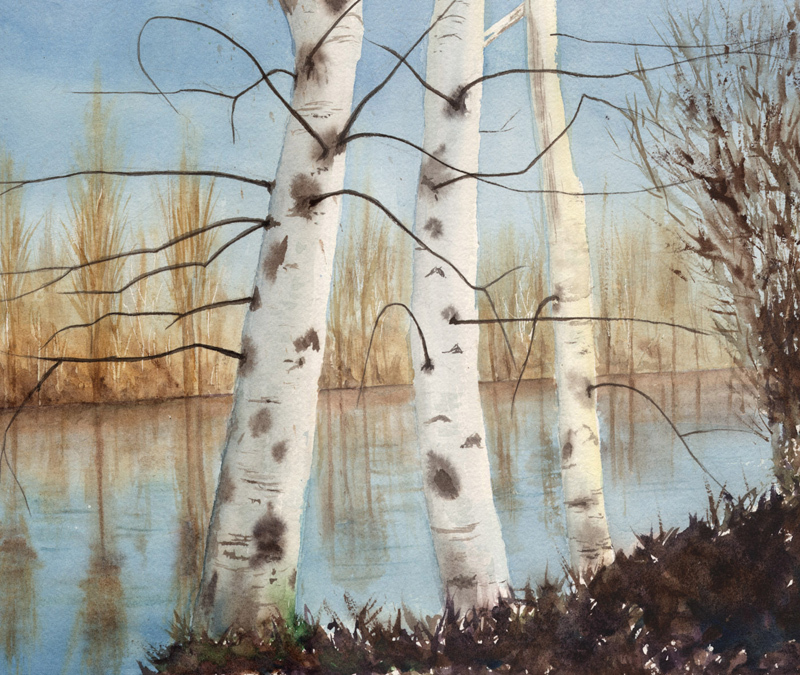 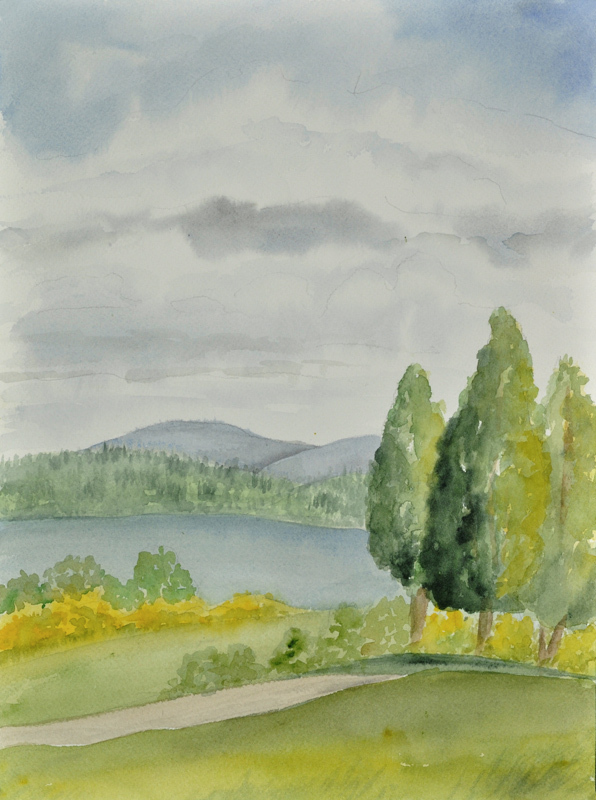 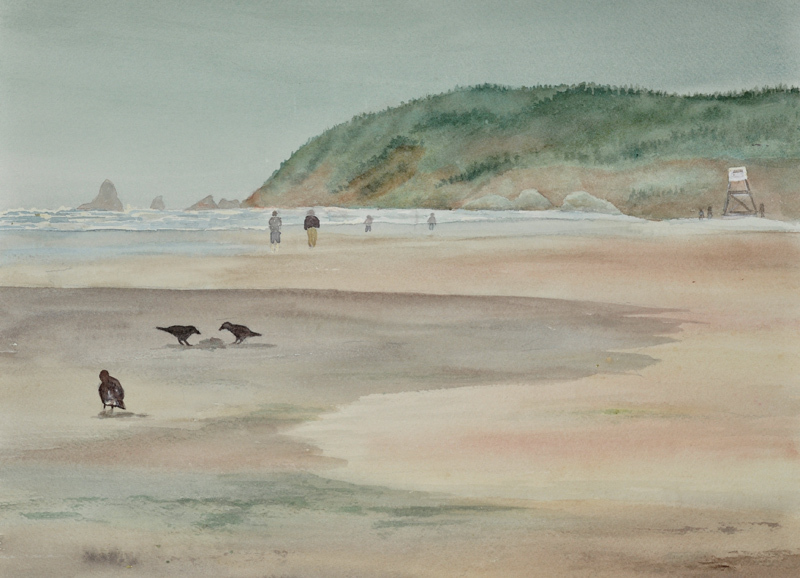 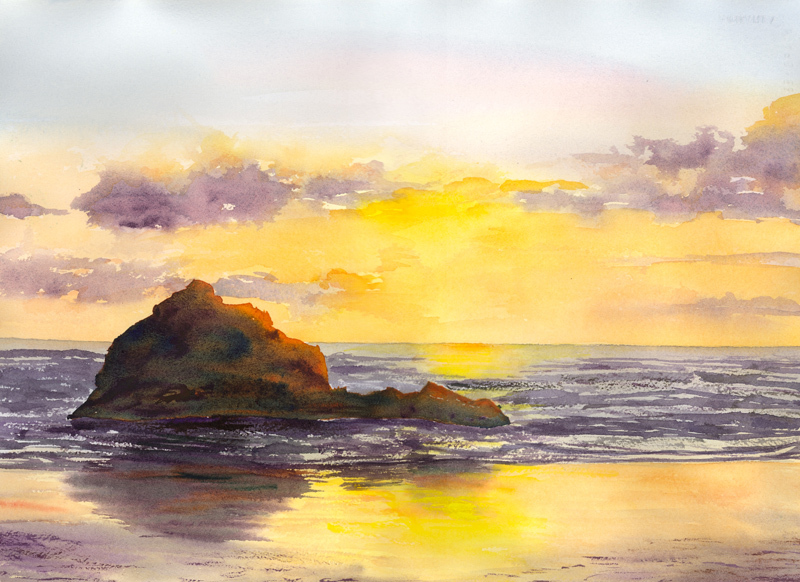 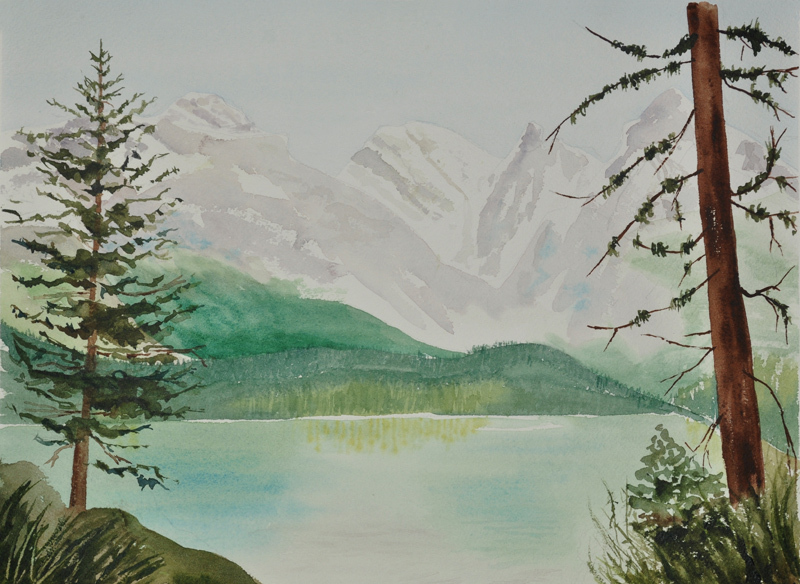 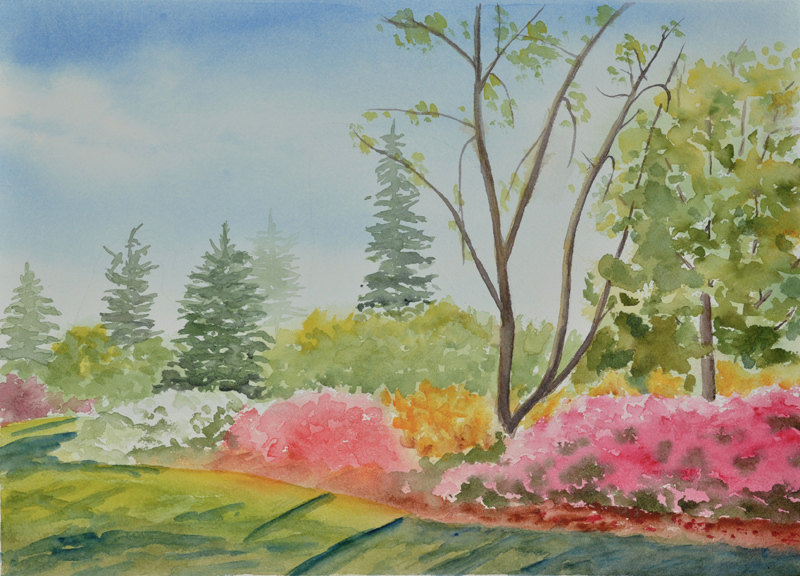 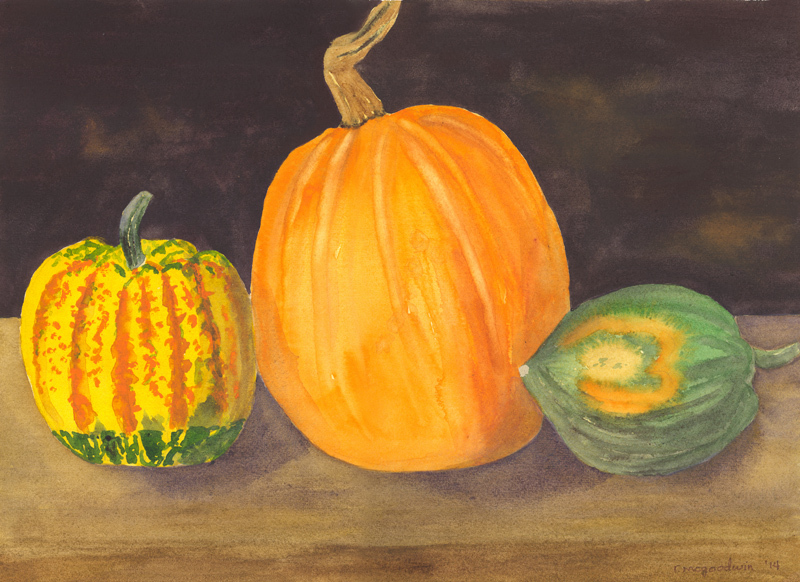 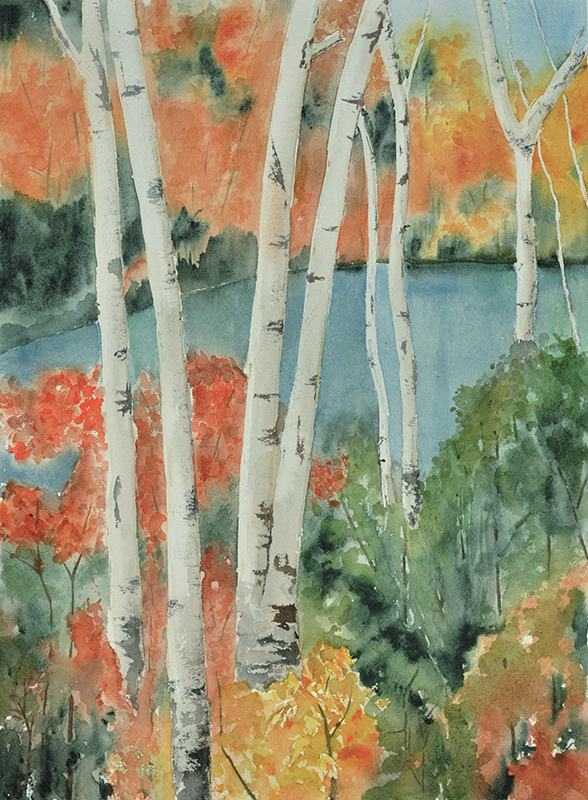 Watercolor Paintings were defined by Rebecca (or in a few posthumous cases, by Michael and her children) as paintings that were complete and among her more pleasing, satisfying, and/or polished works (allowing for the skill level along her learning curve that she had attained). 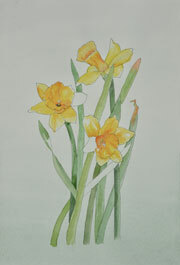 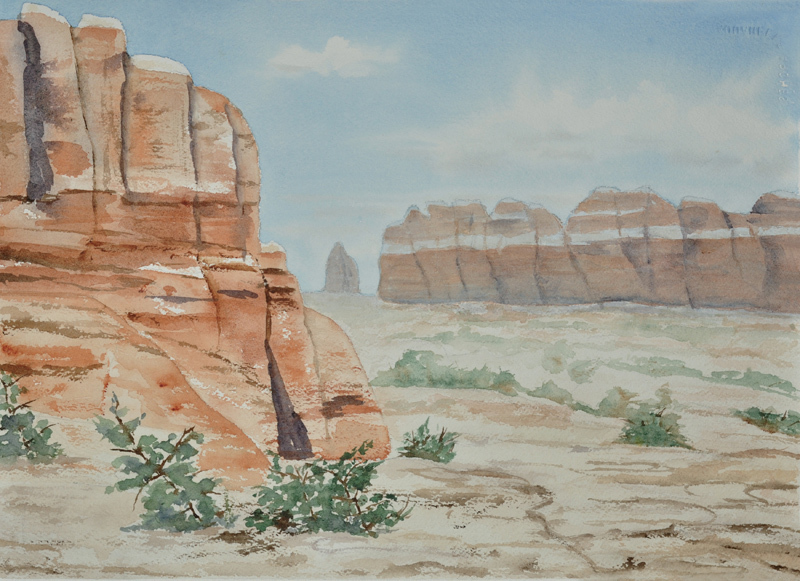 Watercolor Studies were defined by Rebecca (or in a few posthumous cases, by Michael and her children) as paintings that were incomplete, or that were initial, learning, or preliminary efforts which she subsequently improved upon, or were works that she simply did not consider to be among her best paintings (even allowing for the skill level attained at the time). 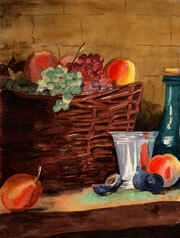 Regardless of this rather subjective classification, we find much to commend many of her Studies. The Studies which are included here represent about one half of the total studies that Rebecca left behind. The other one half will be retained but have not been photographed and are not cataloged or described here. 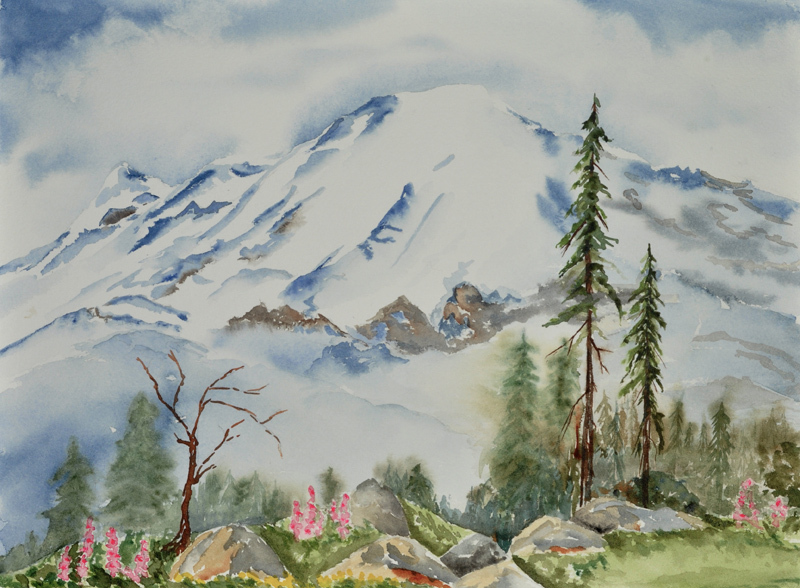 Information Provided about Each Work: The Title of a work (including its Year painted) was exactly specified by Rebecca in most cases (often with my encouragement), but titles were added posthumously by Michael in [square brackets] when Rebecca did not provide one. 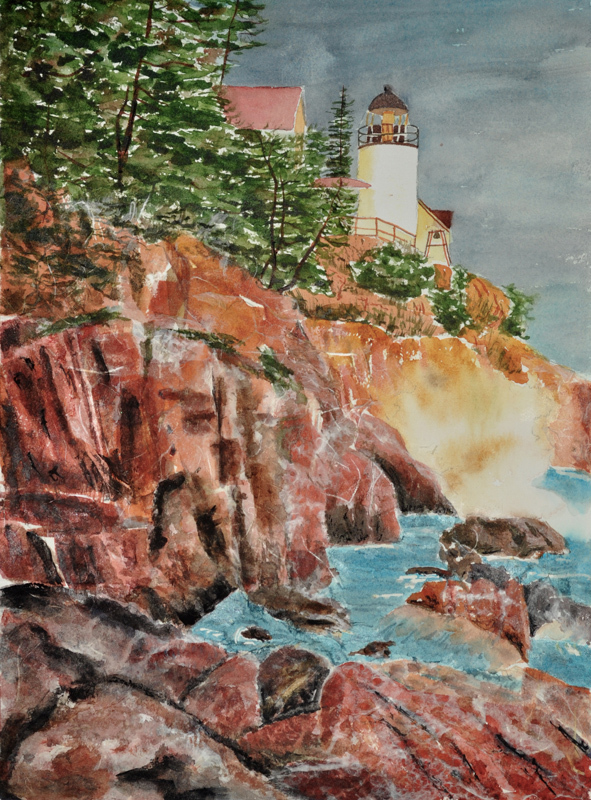 Where possible, we added the title and year to the back lower right of the painting (again in square brackets if she did not provide them). 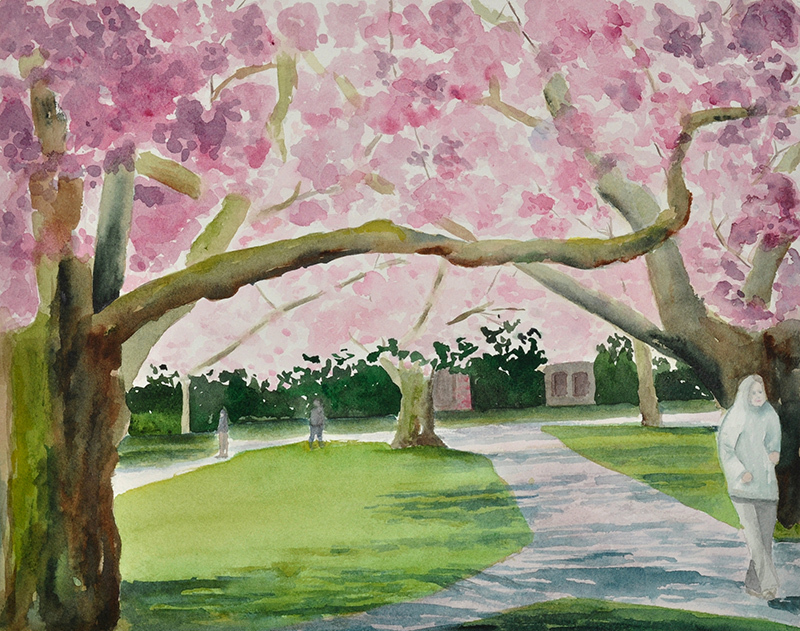 In many instances, Rebecca signed the painting in front, usually at the lower right (for instance, "r mcgoodwin '04" for a painting she did in 2004), but she did not always get around to signing her works. 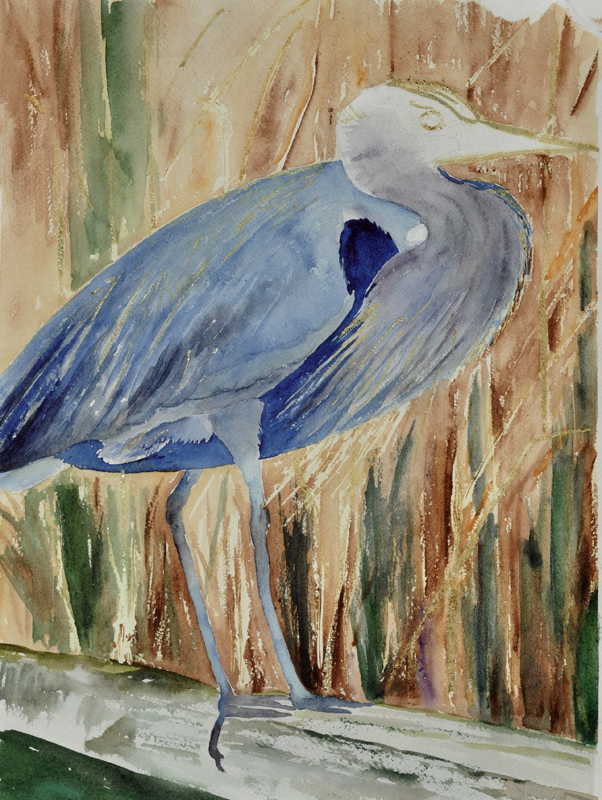 Additional information can often be found in the Description: the subject matter of the painting; its size in centimeters (for the actual painted content, not including the border); and who took the photo or made the painting which she utilized as a model; etc. Technical Aspects of Digitally Imaging her Paintings: Many of the earlier paintings were imaged by using a flatbed scanner, a tricky task because the painting would usually not fit in only one scan. 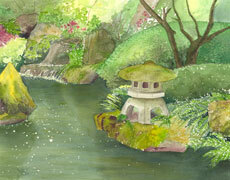 This meant that two or more scans were made and then, to the best of my ability, were stitched together in Photoshop. 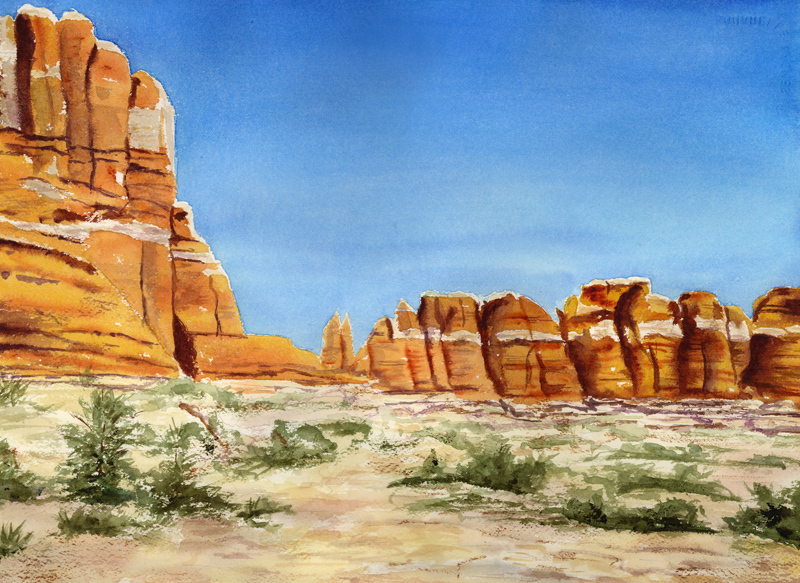 With the availability of a high resolution digital camera, I began photographing the paintings as a single image rather than scanning them. 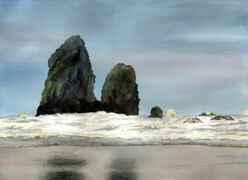 All images have been adjusted for color balance and contrast etc. 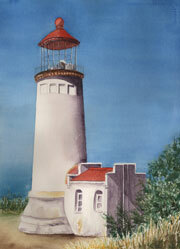 in Photoshop so that they most closely resemble the actual painting, though lighting conditions and resulting color matching are not always perfect. 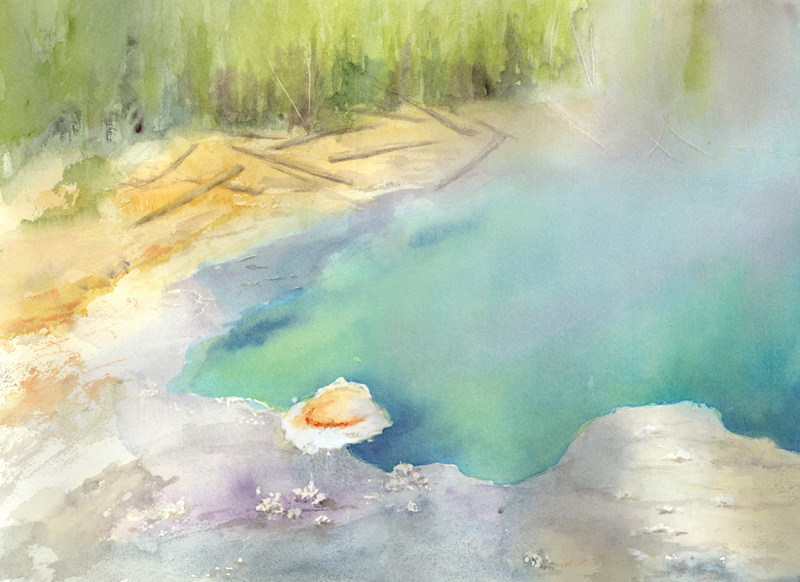 In some cases, the uneven edges of the images have been cleaned up in Photoshop a little for aesthetic purposes. With my photographic setup, it is not always possible to assure that the image is centered on the optical axis of the camera, and that the painting is exactly perpendicular to the optical axis. 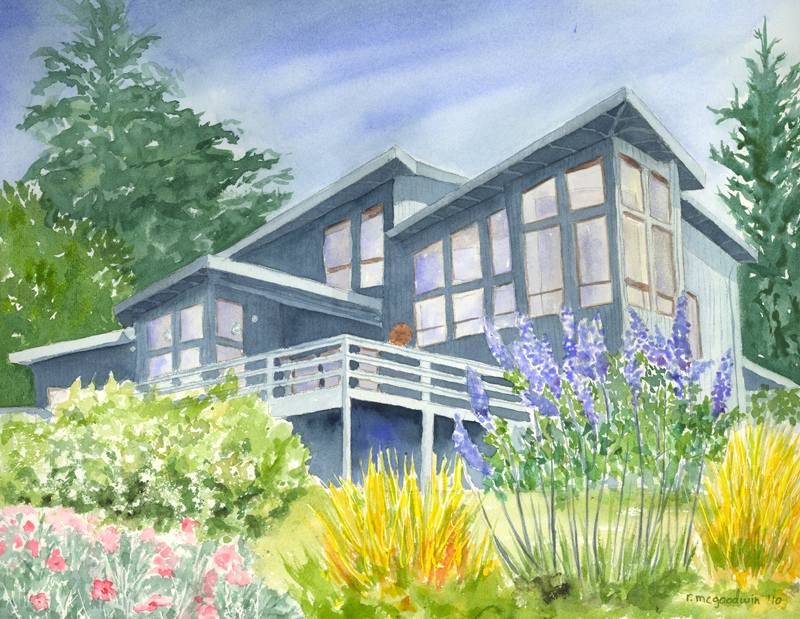 This can result in slight skew distortion, which in some cases I have attempted to correct by de-skewing in Photoshop. 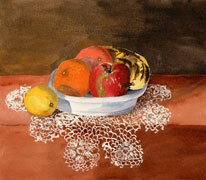 Otherwise, paintings have not been significantly retouched. 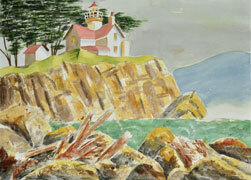 Privately archived full size images range in size from 100 KB to 9 MB. However, the images linked to on this page are limited to a maximum size of 800 pixels on a side. Please respect the copyrights of these works. 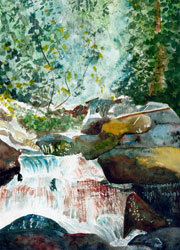 Viewing the Works via Thumbnail Usage: Click (or better, Right-Click) on any thumbnail image to see the corresponding larger image. 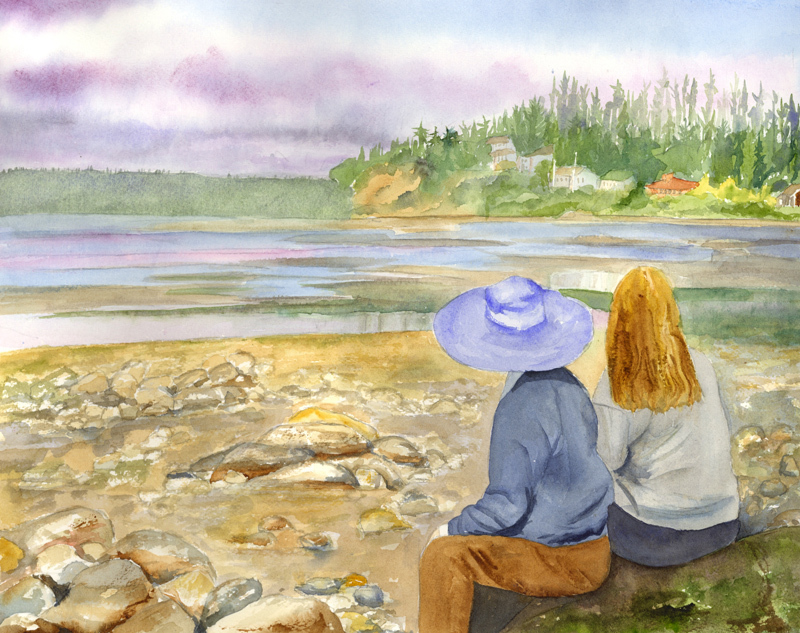 Use the browser's "Back" command (or better, the command to close the current tab, which is Ctrl-F4 on PC's) to return to this page. 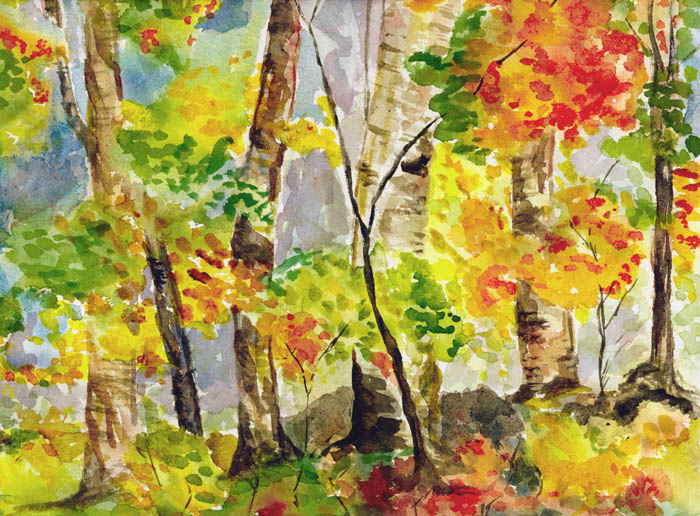 Thumbnails are in approximately reverse chronological order, with newest year first. 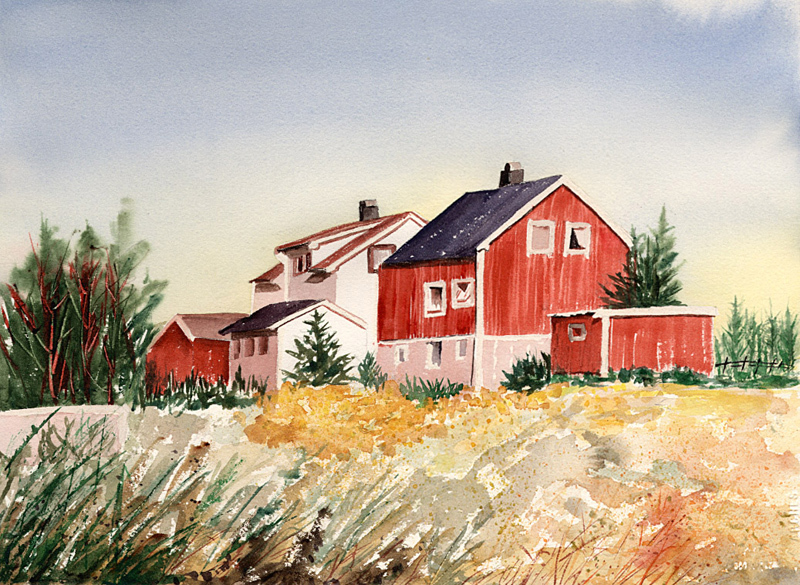 The year of composition is not always known and has in some cases simply been guessed at by Michael and indicated with "c. 2014", etc. Thumbnails are numbered (starting over at 1 for each section or year. 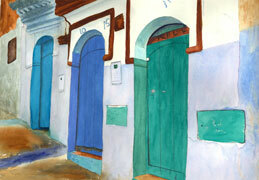 The numbers may not always be consecutive, and some numbers may be skipped). 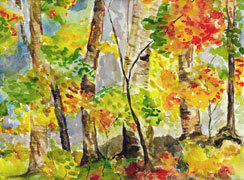 These numbers may be used to match up the thumbnails in the left column of the tables with the narrative text appearing in the upper right column of the tables, as well as the technical information about the photos appearing a little lower in the right column (including file name, size in pixels, and aspect ratio of the photo). RCM = Rebecca Cardiff McGoodwin, WKC = W. Kong Cheung, WLM = Wendy L. McGoodwin. This section was provided previously to family members and others to facilitate gifting, a process that has been completed. 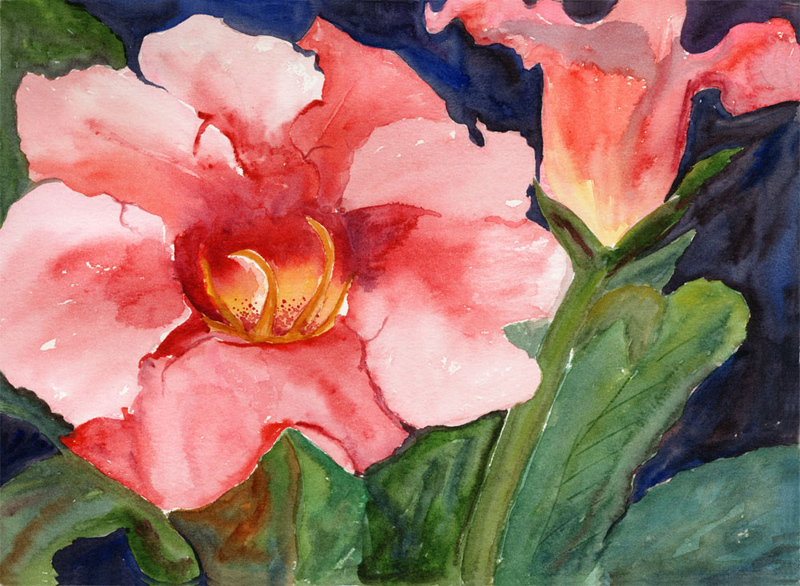 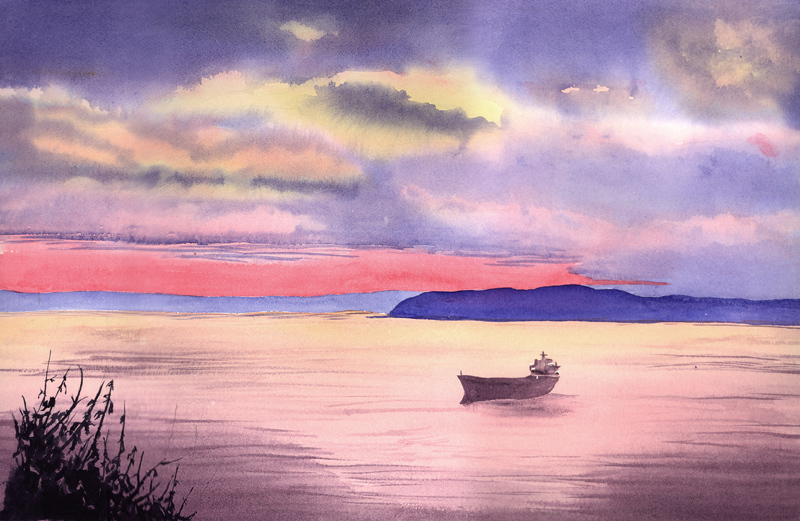 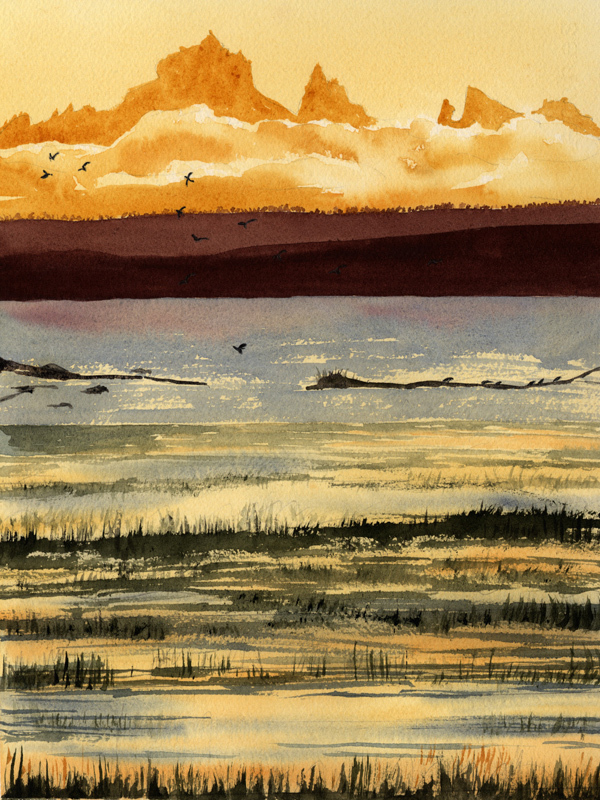 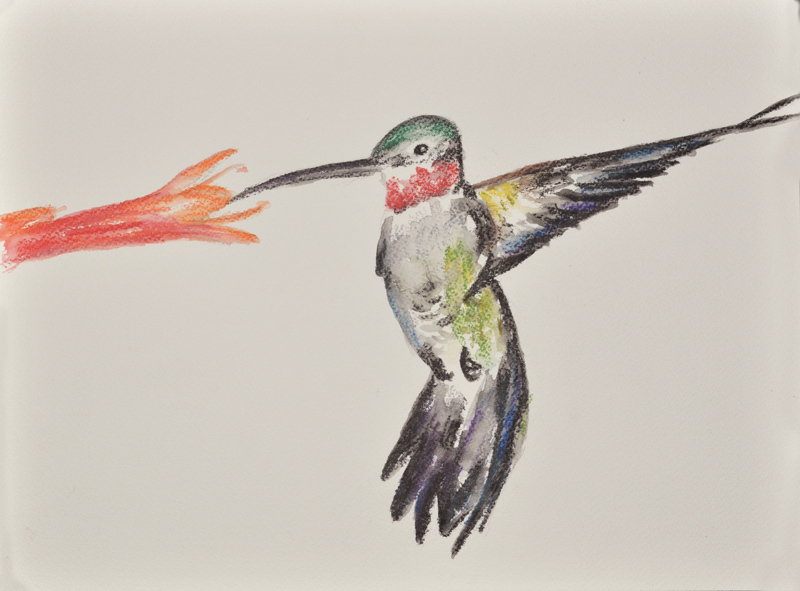 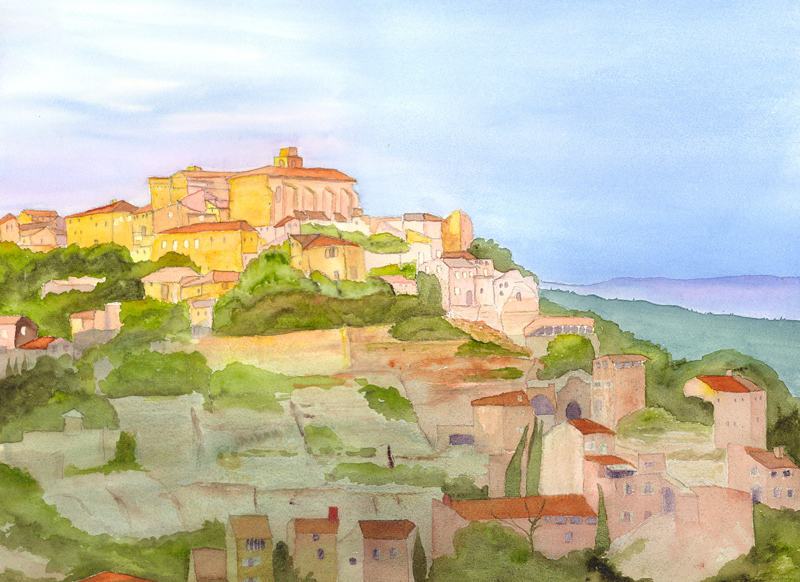 None of Rebecca's watercolors are currently availalble for sale or gifting. 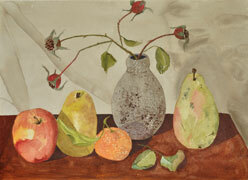 As noted above, these "Paintings" are considered complete and among her more pleasing, satisfying, and polished works. 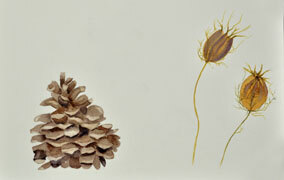 They are presented by year groupings in approximately reverse chronological order, newest first. As noted above, these "Studies" have merit but are considered learning or preliminary exercises, incomplete, etc. 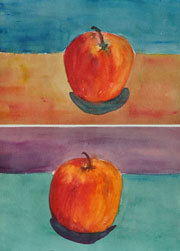 They are also presented in approximately reverse chronological order, newest first. 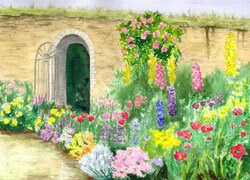 I am grateful to the individuals who supplied photographs that Rebecca used in inspiring and modeling some of her paintings. 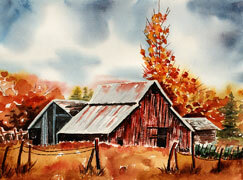 In most cases, the photographer is stated above where known.